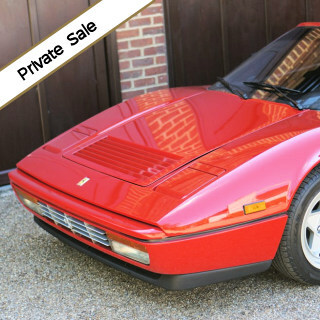 This low mileage 328 GTSi is available for just £84,950 + Buyer’s Premium of 6% inc VAT. 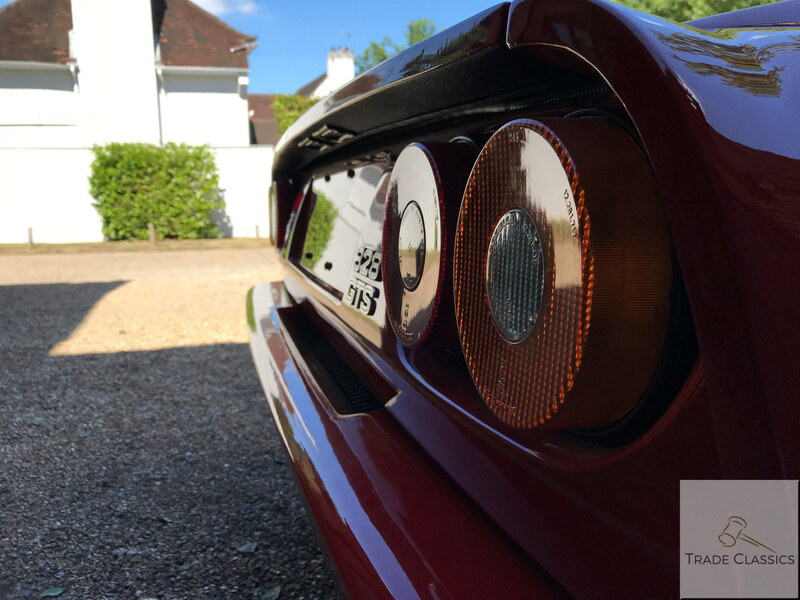 You can submit your interest below, or please call 01926 426 635 to speak to me directly about the car. 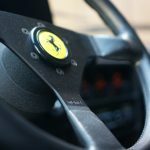 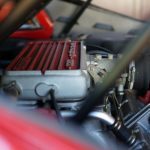 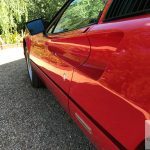 Want to receive updates on this Ferrari? 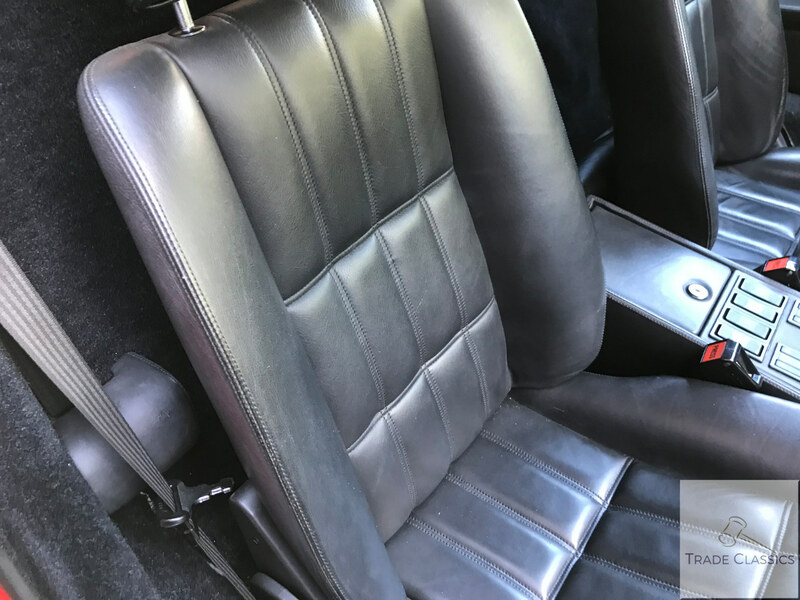 Enter your email below and we’ll keep you updated on this sale and add you to our weekly auction notification email, or call us on 01926 426 635 to contact the seller. 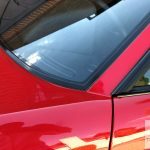 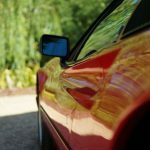 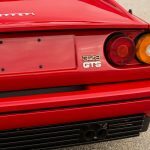 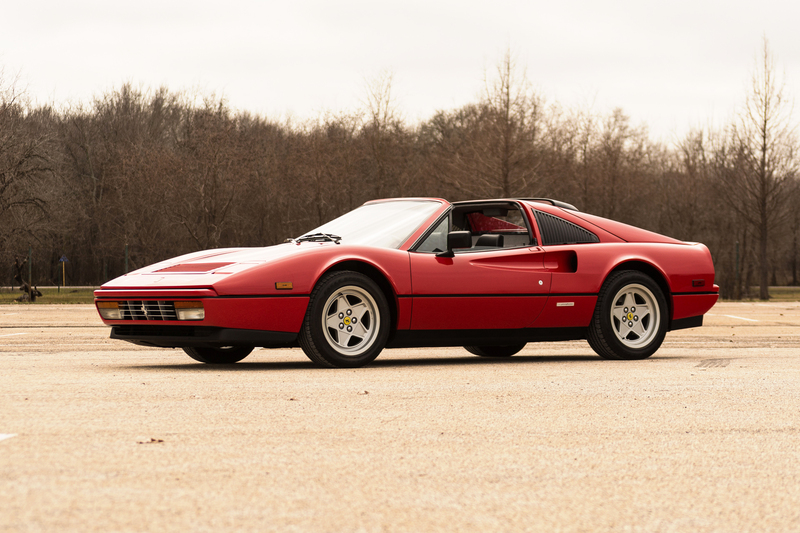 The 328 was developed and built by Ferrari from 1985 through to 1989. 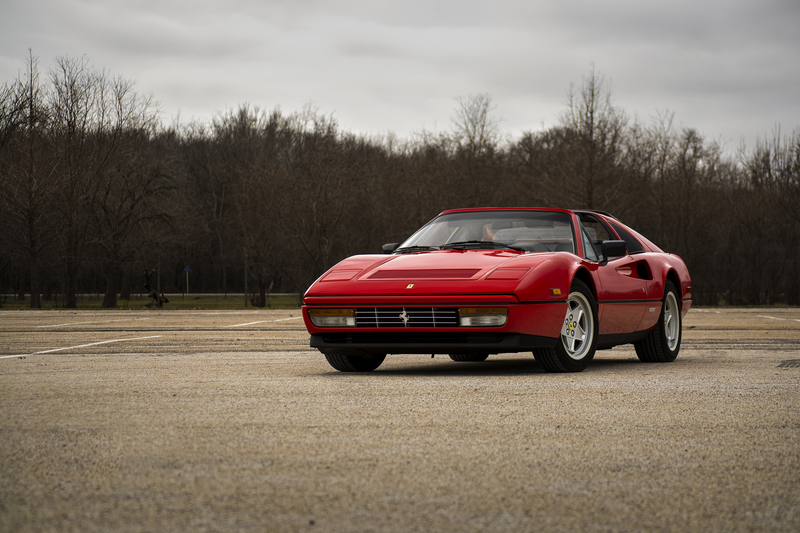 It was the successor to the 308, with the biggest difference between the models being the revised engine up to 3.2L. 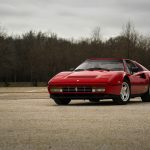 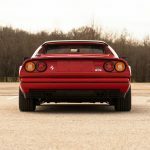 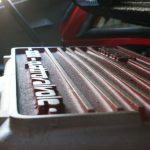 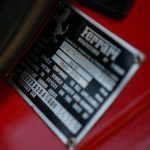 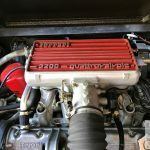 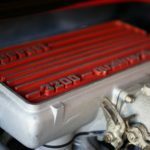 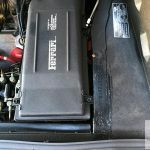 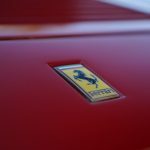 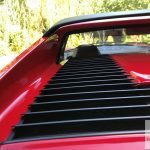 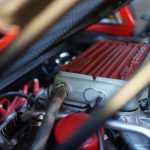 The car being named a 328 (3.2L, 8 cylinder), was to be the last developments of the transverse V8, 2 seat series from Ferrari. 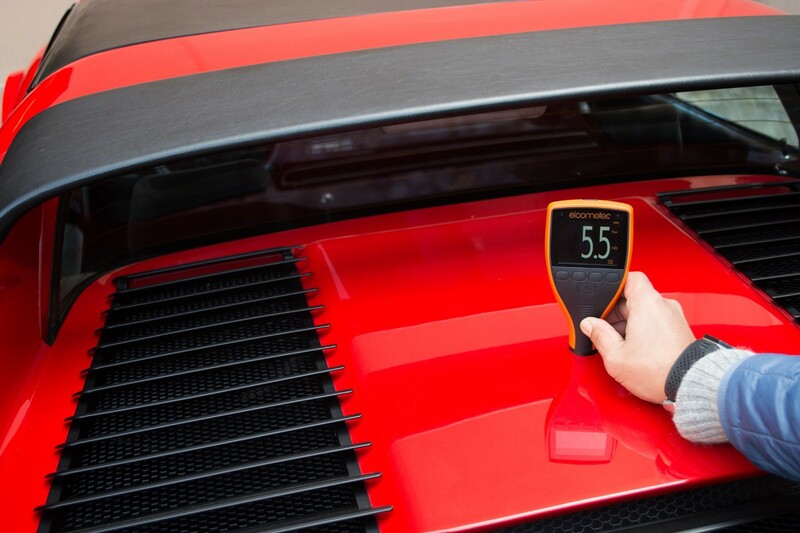 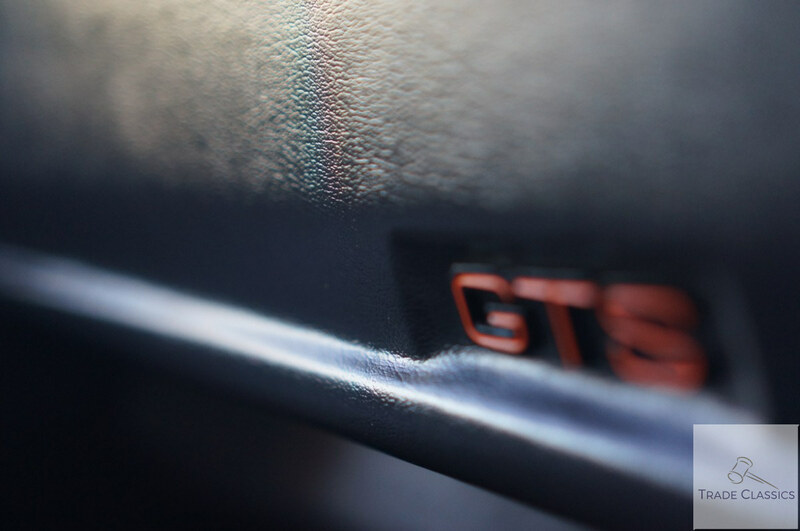 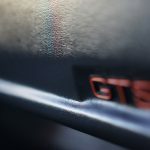 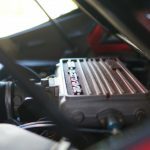 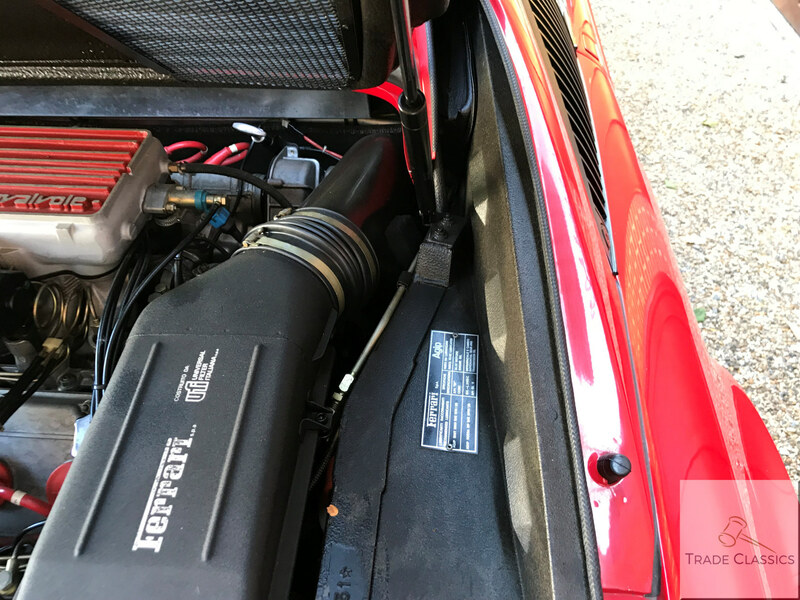 The engine was capable of outputting 270HP, and this meant for the GTS; a 0-60 MPH time of 5.9 seconds, a top speed of 163 MPH. 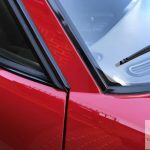 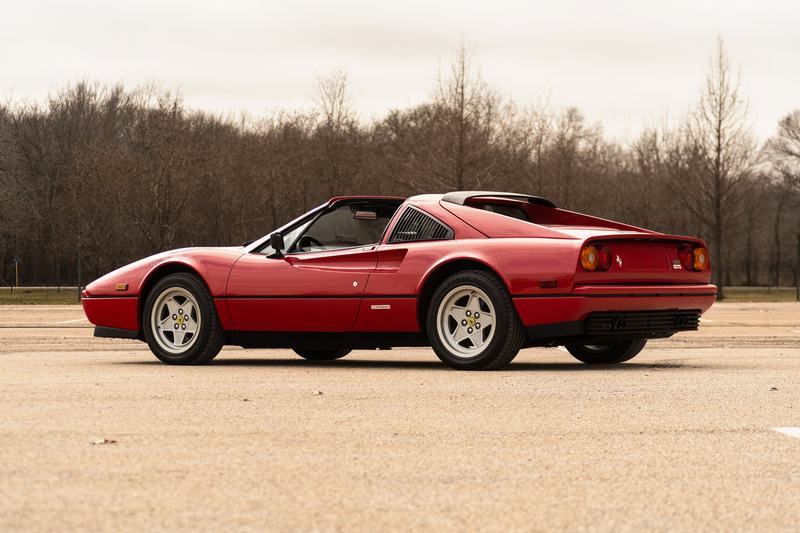 In terms of other changes following on from the 308, the 328; softening of the wedge profile, other elements softened like a rounder front end and rear valance, and a larger air intake on the bonnet. 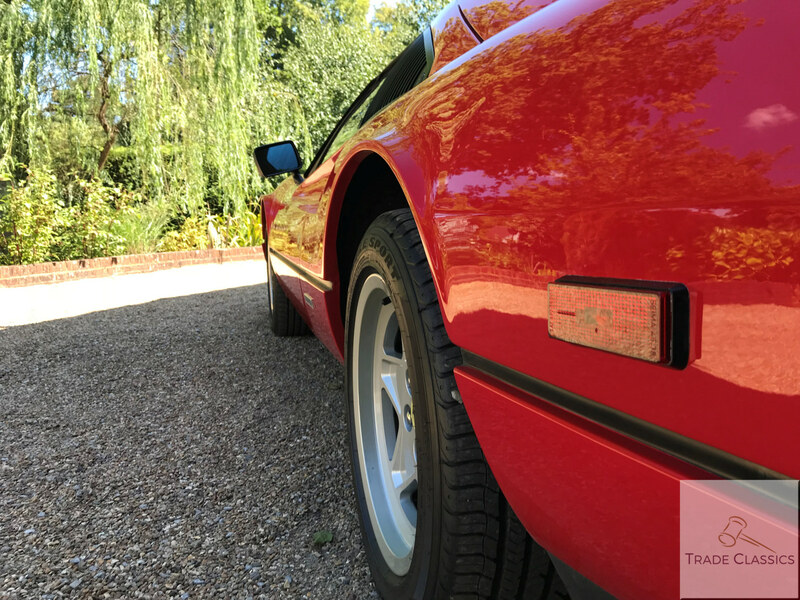 This Ferrari belongs to a friend of us here at Trade Classics, his name is Gary Turner and he’s a proper car guy. 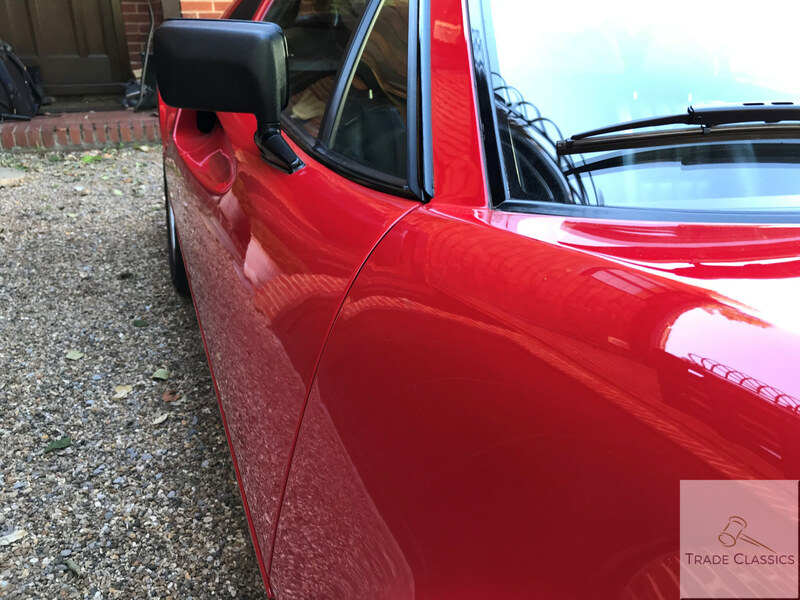 Gary has owned and enjoyed many cars over the years, including some very beautiful and rare 911’s. 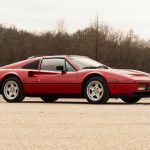 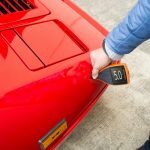 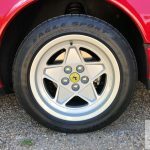 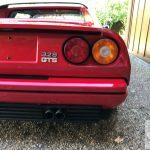 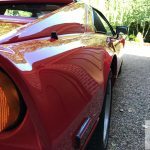 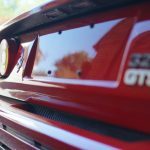 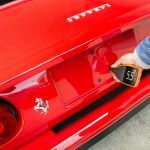 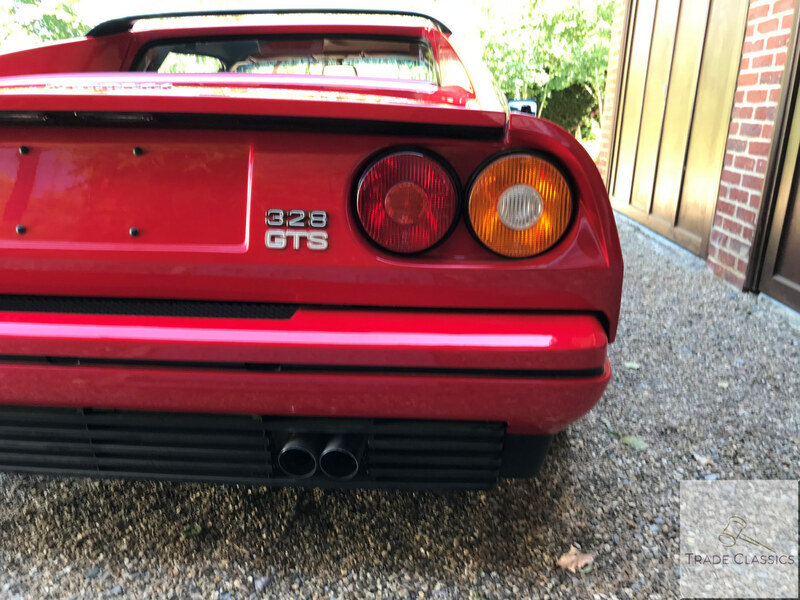 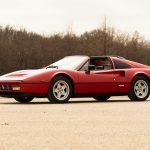 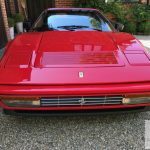 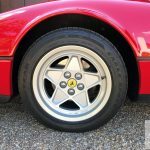 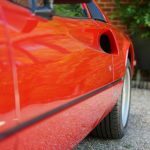 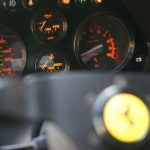 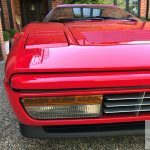 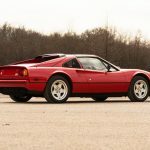 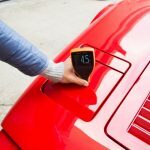 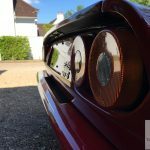 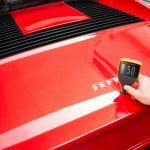 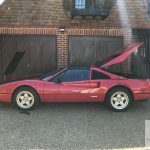 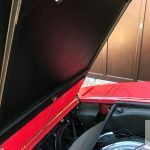 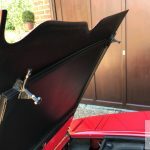 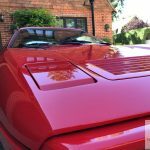 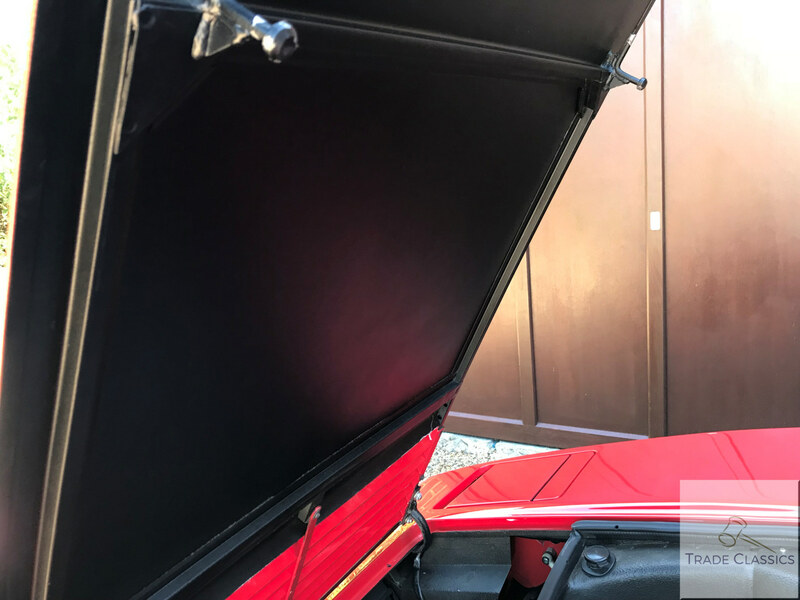 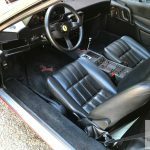 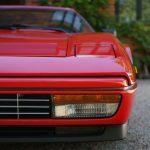 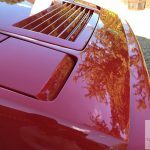 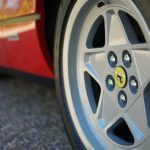 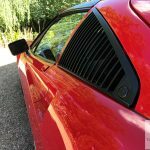 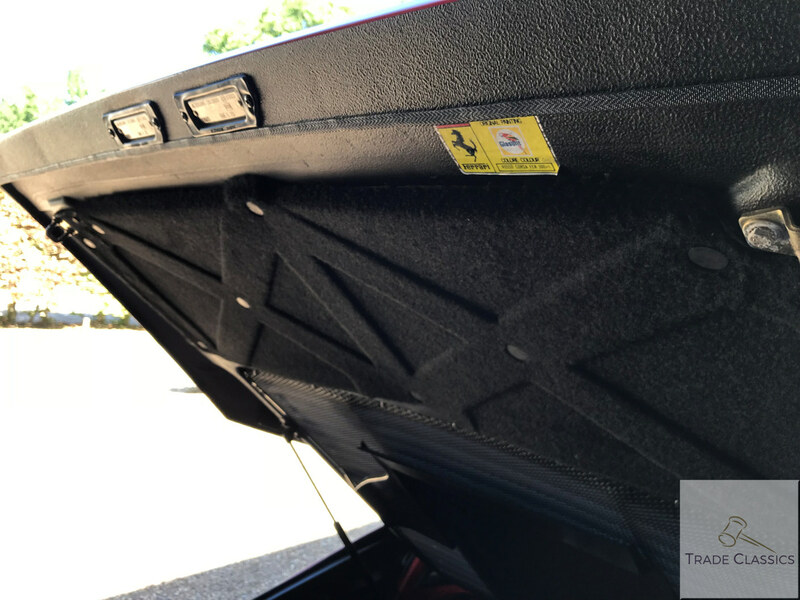 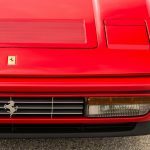 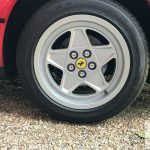 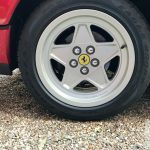 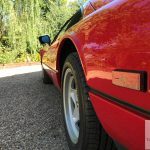 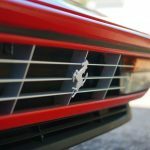 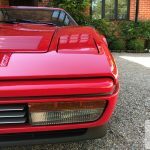 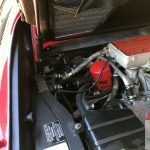 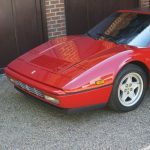 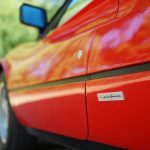 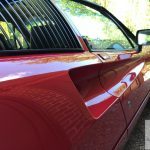 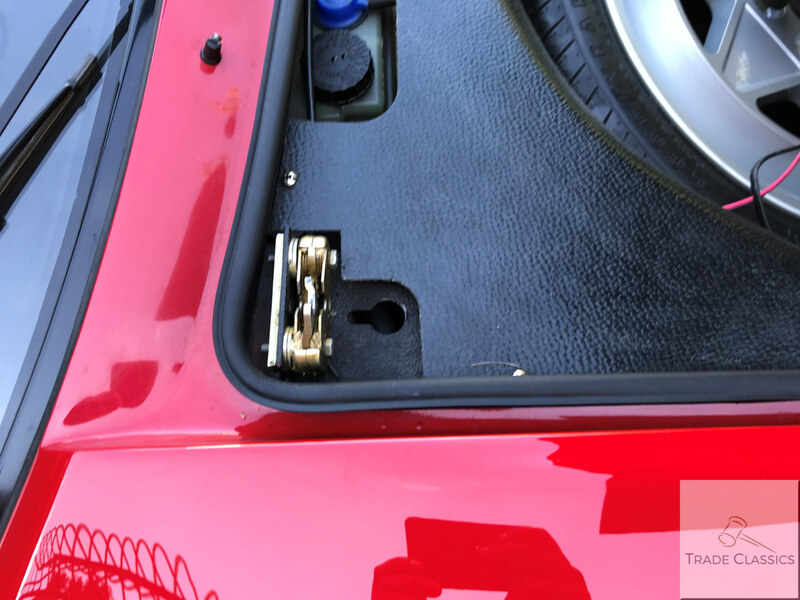 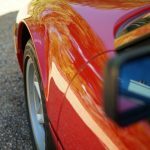 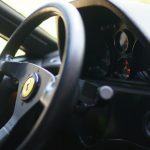 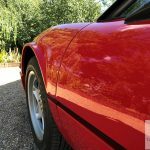 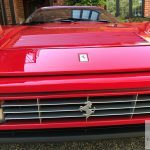 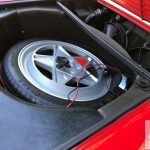 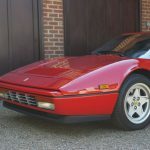 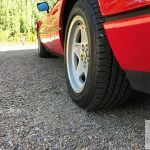 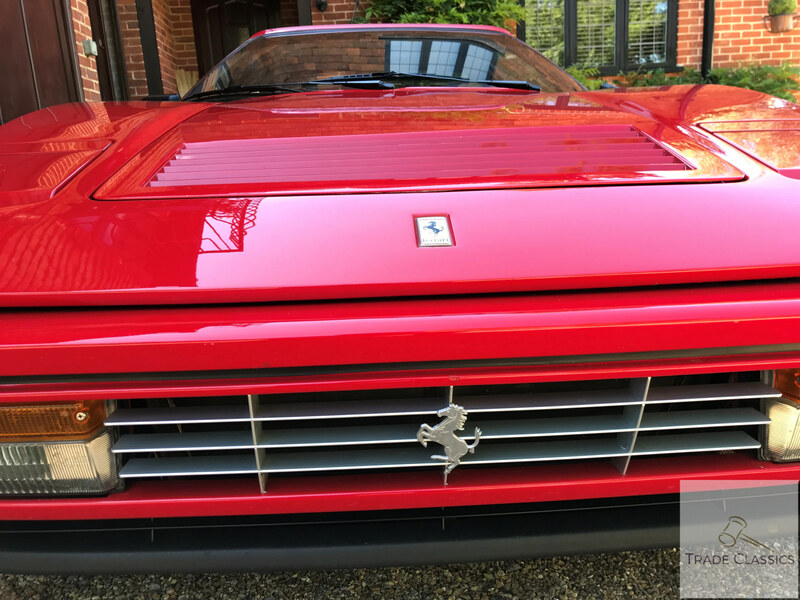 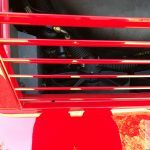 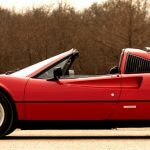 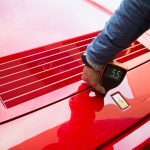 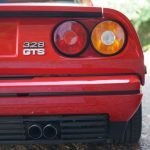 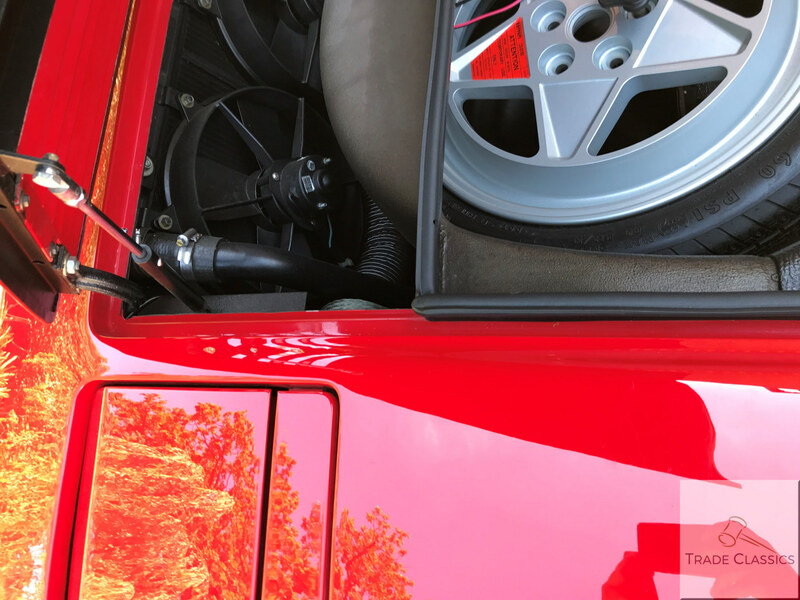 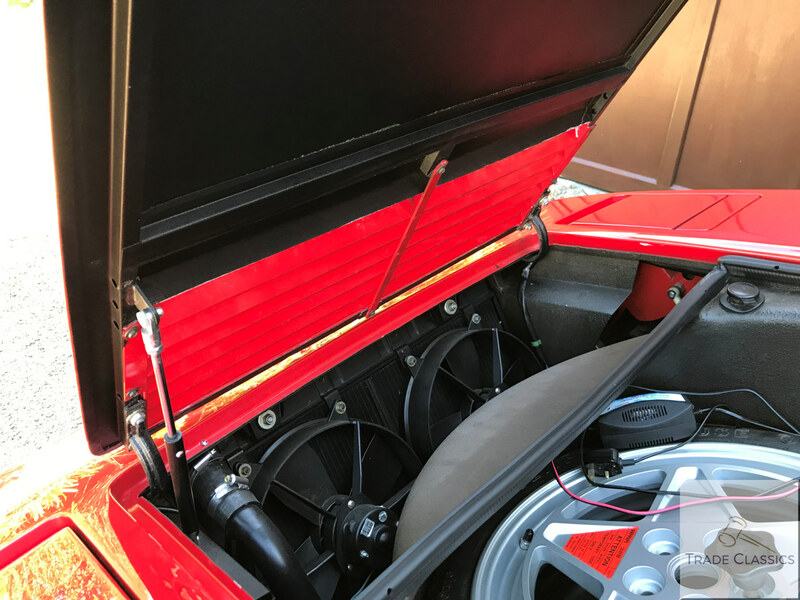 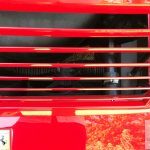 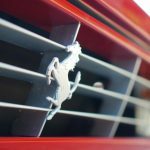 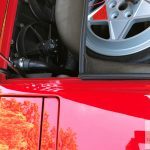 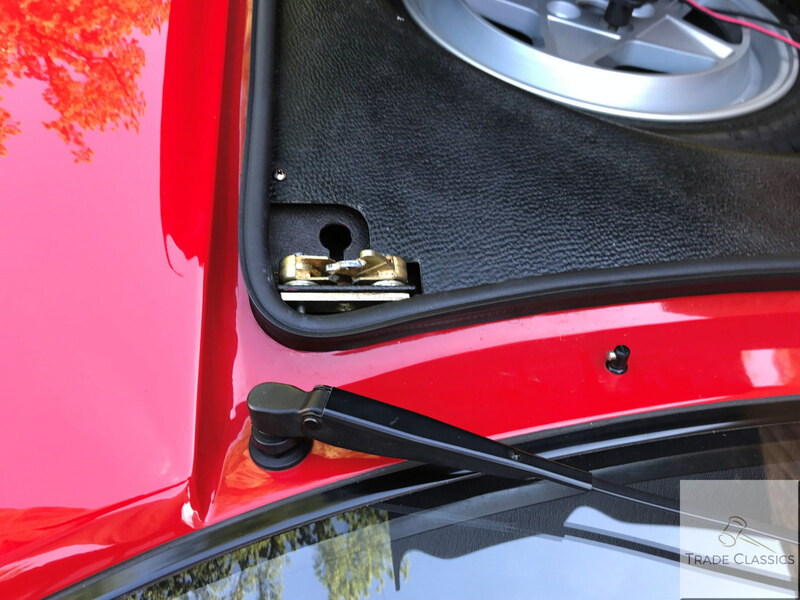 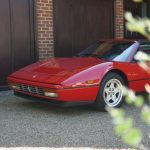 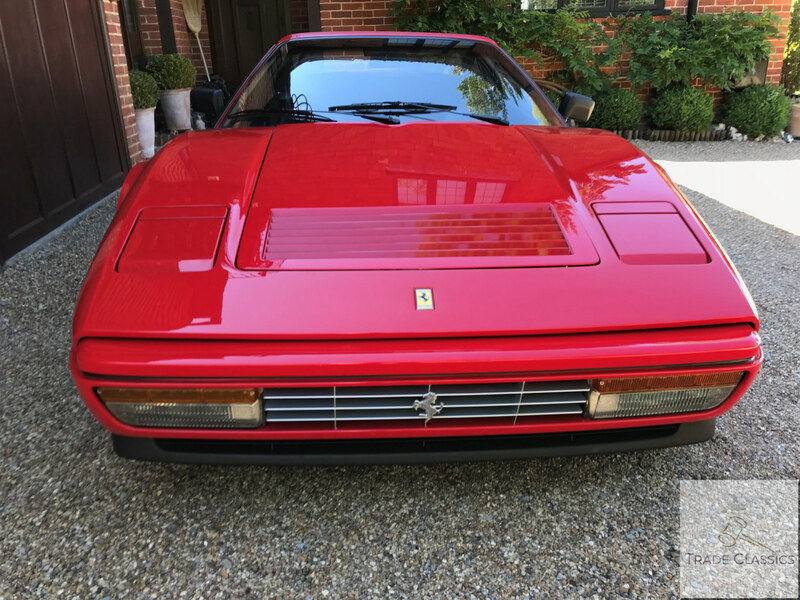 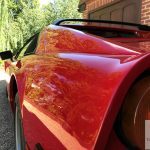 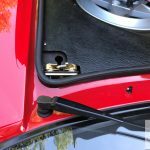 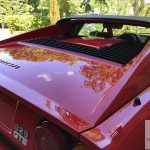 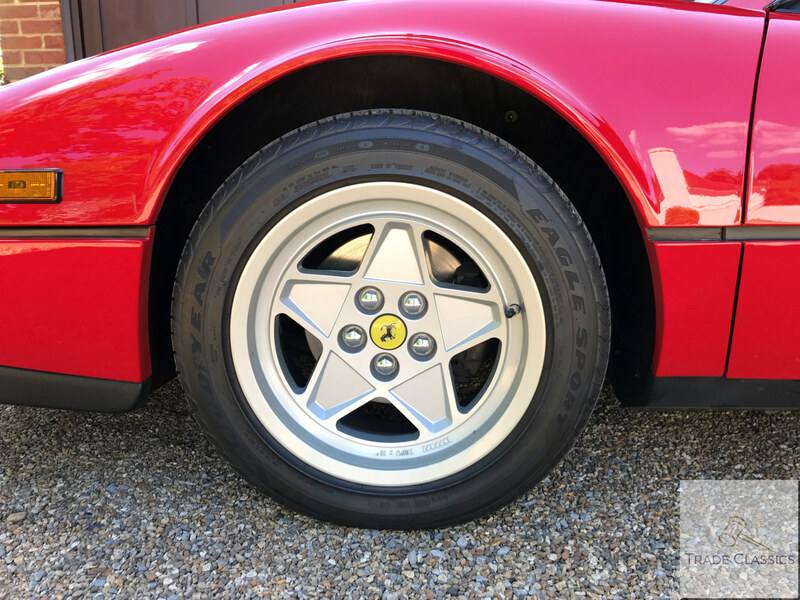 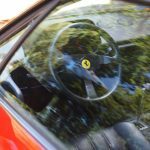 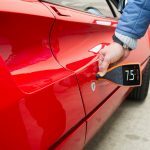 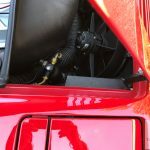 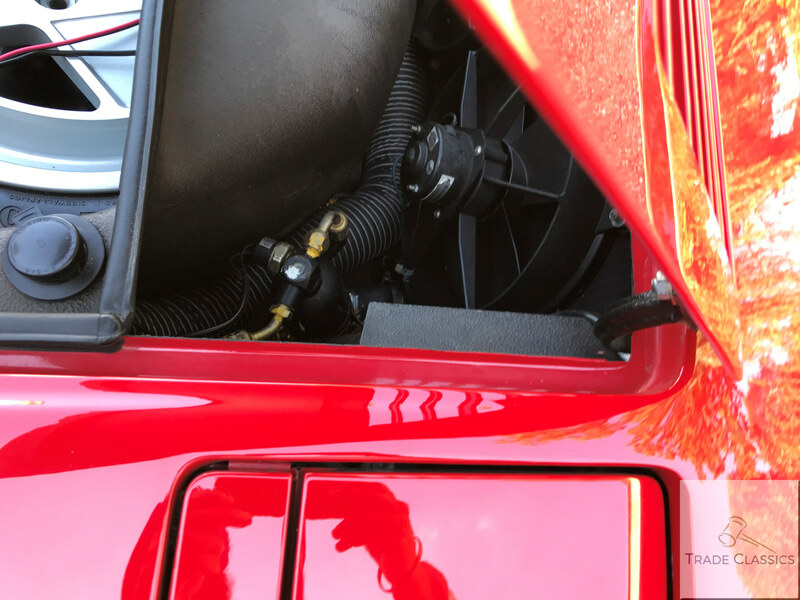 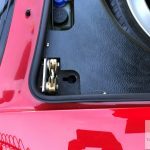 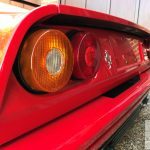 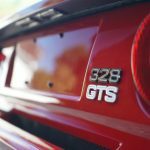 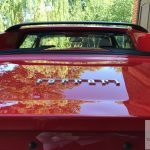 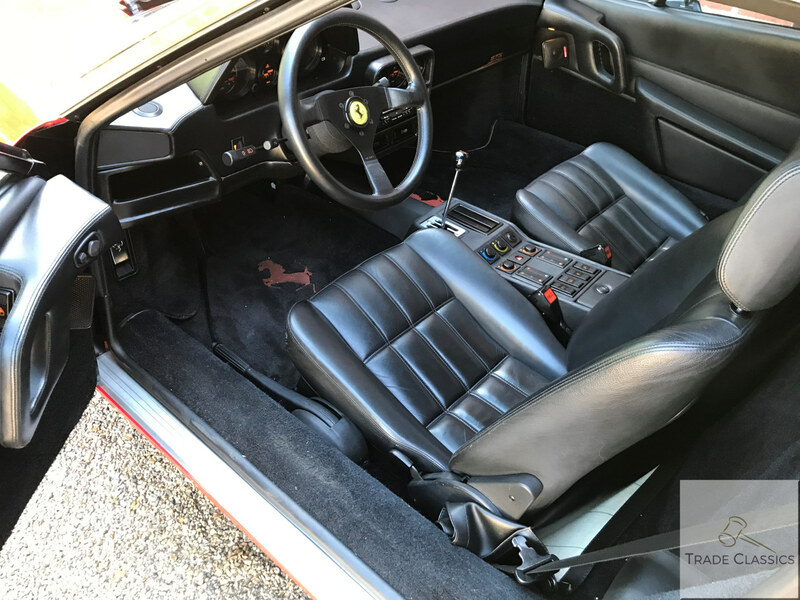 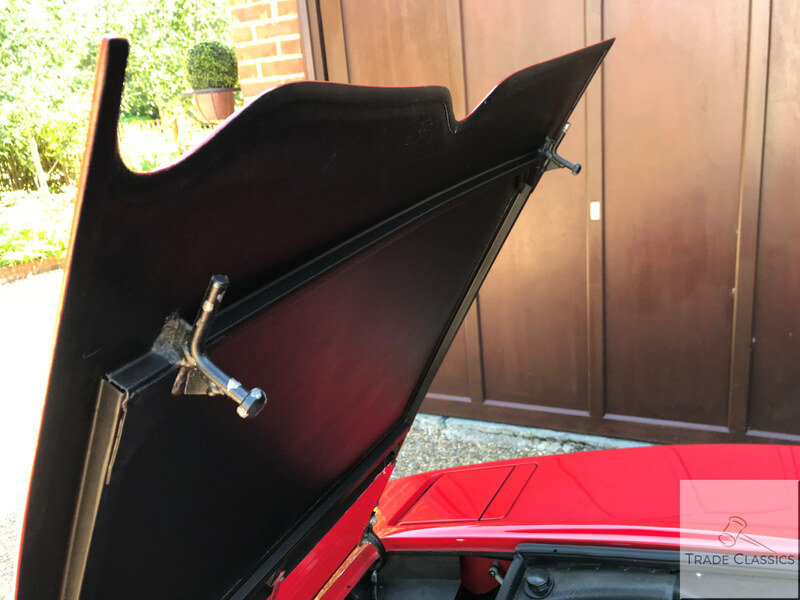 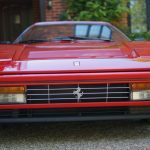 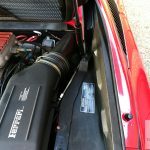 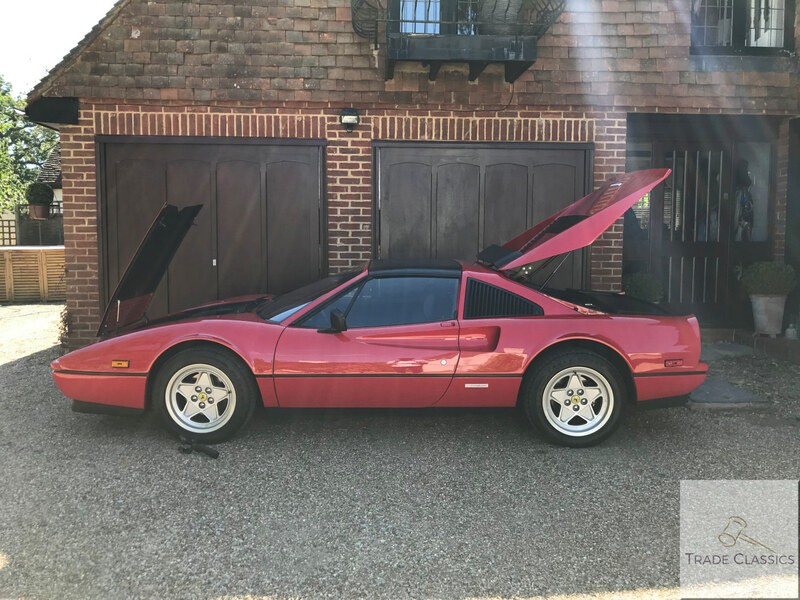 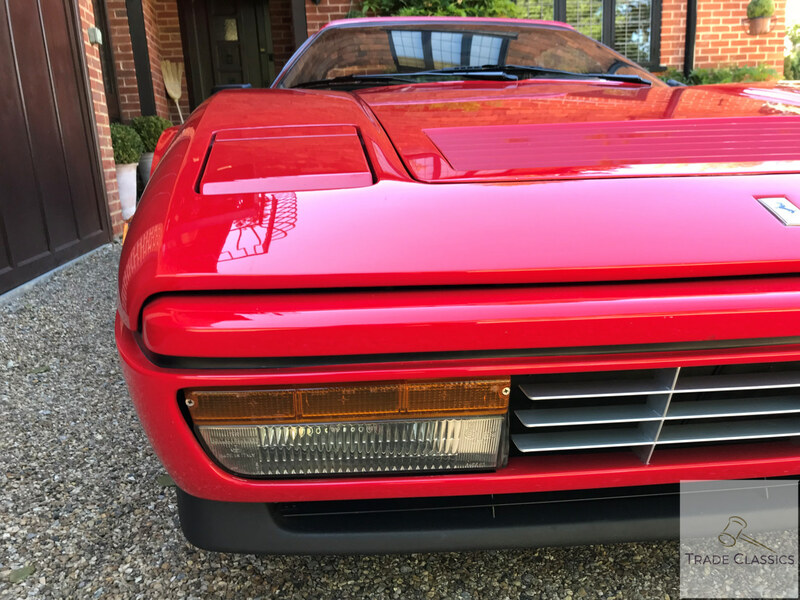 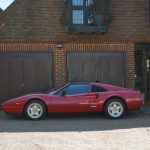 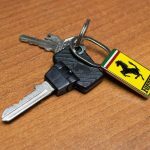 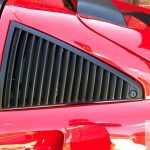 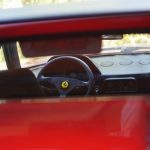 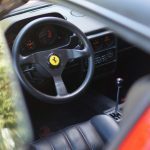 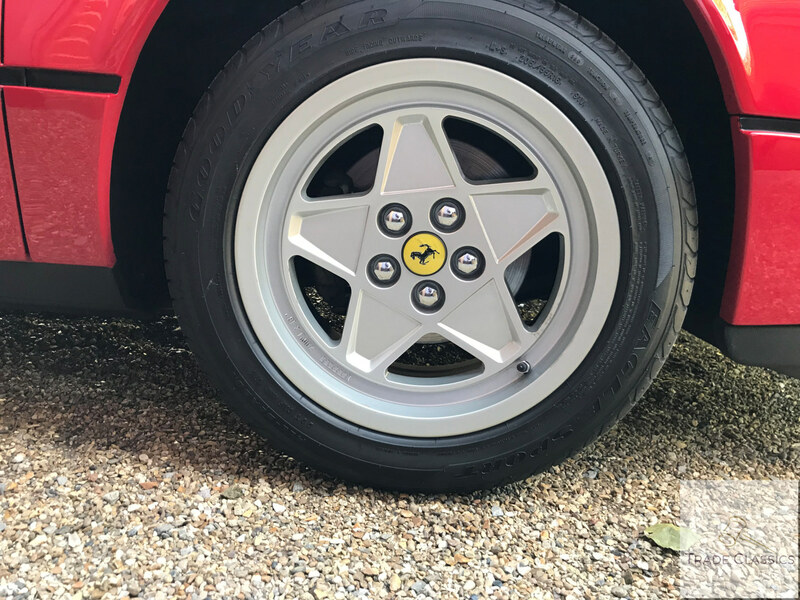 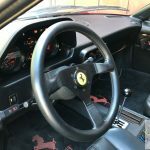 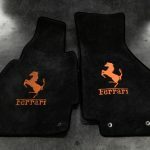 It wasn’t long until Gary scratched his itch for more cars in Canada, he has since bought a beautiful and early VW campervan, Porsche 911 ST, concours MGA and this Ferrari. 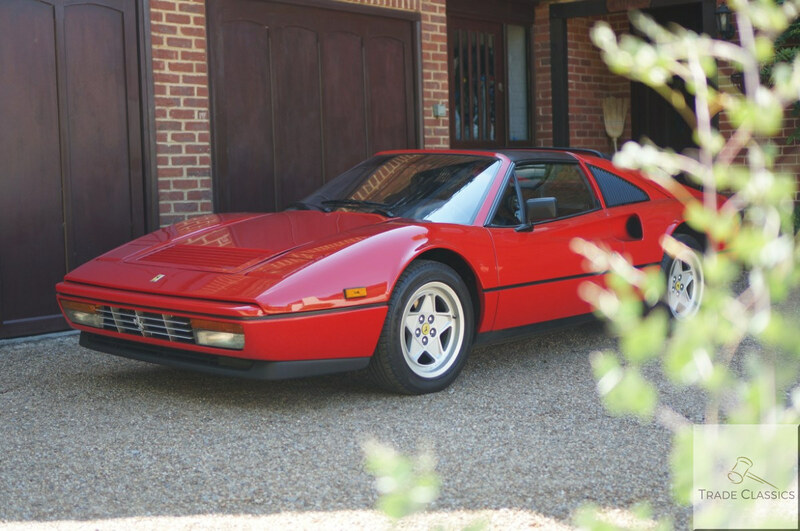 Gary has decided to sell the 328, and we are delighted to be handling the sale. 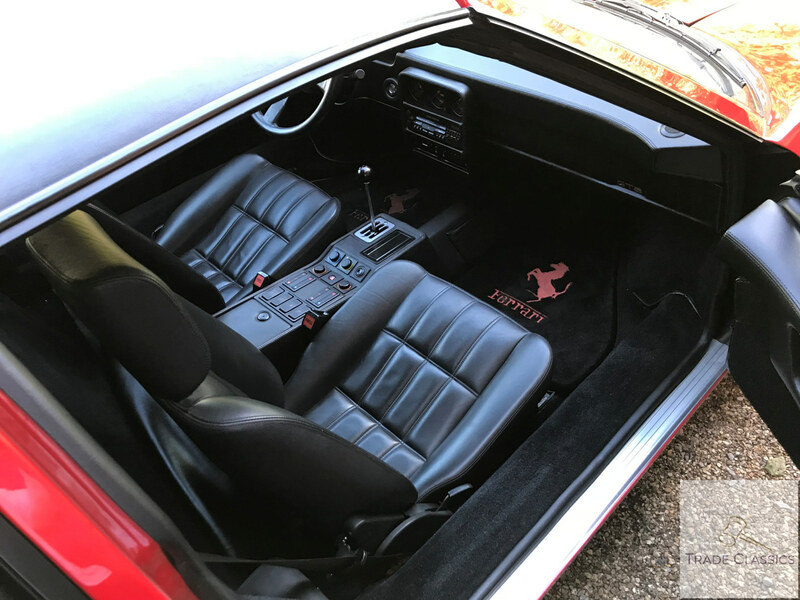 If the car doesn’t sell, Gary is looking forward to enjoying the car upon his return from Canada, with the car staying in storage until then. 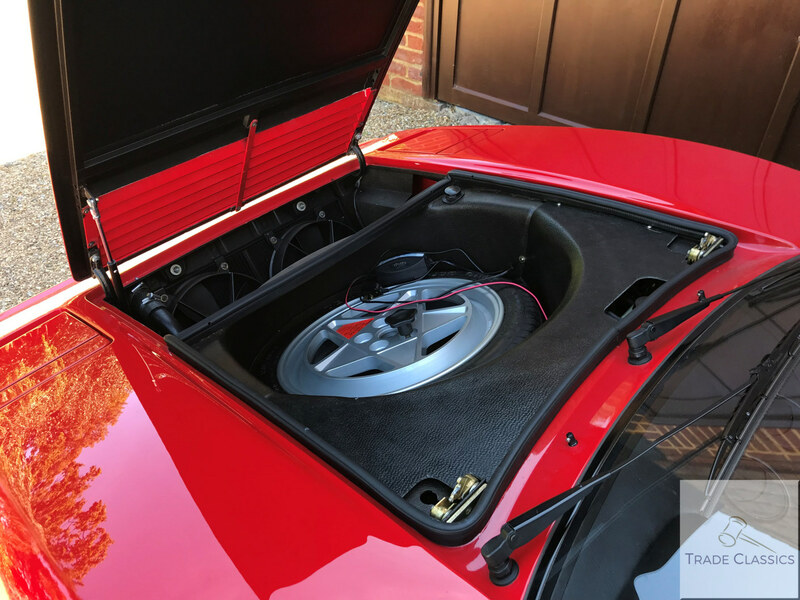 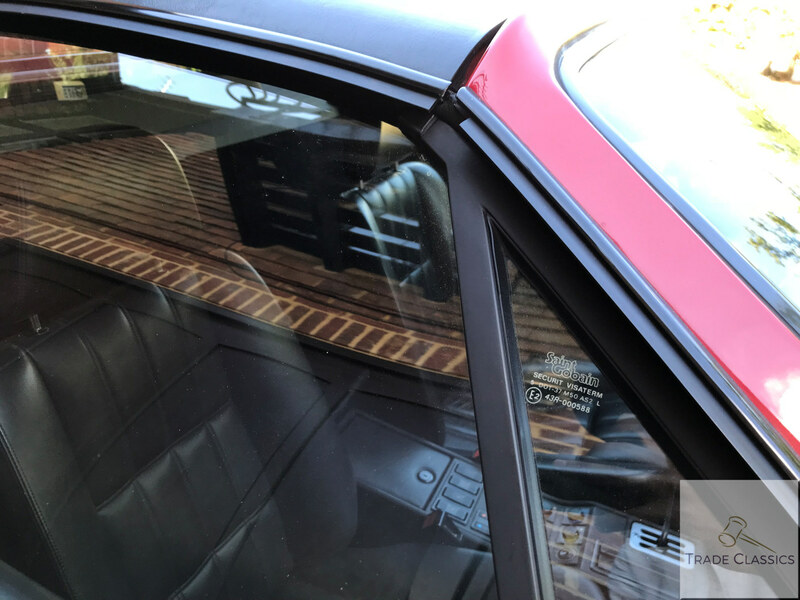 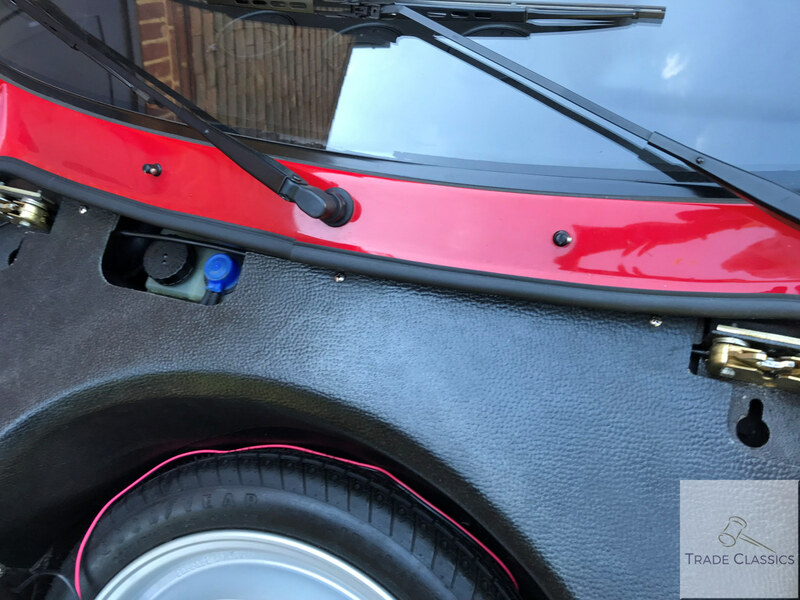 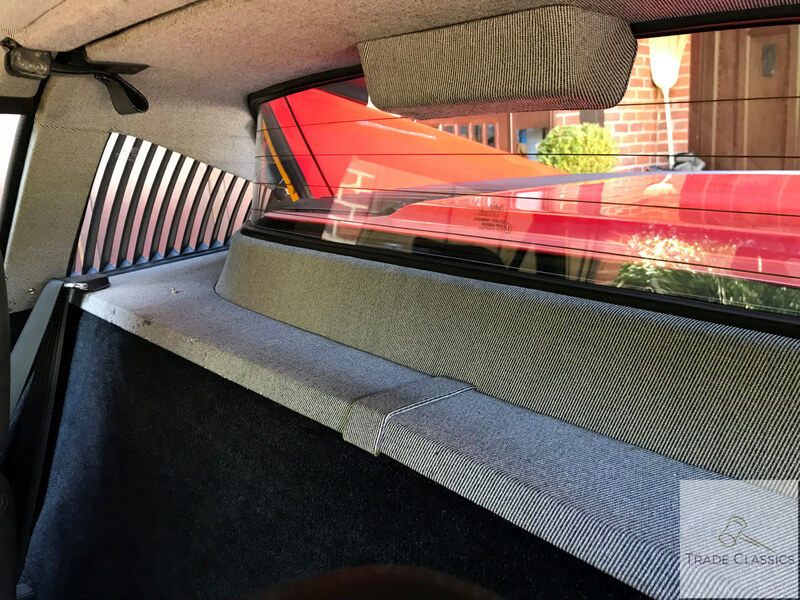 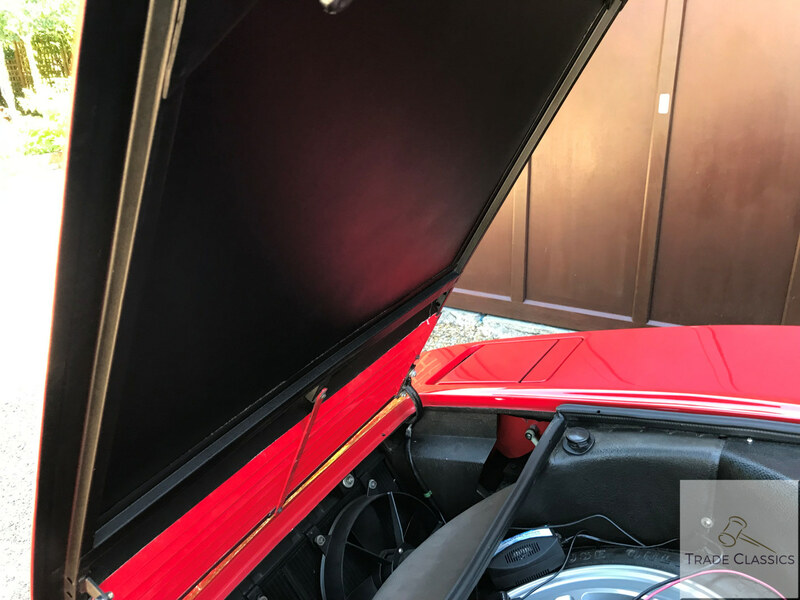 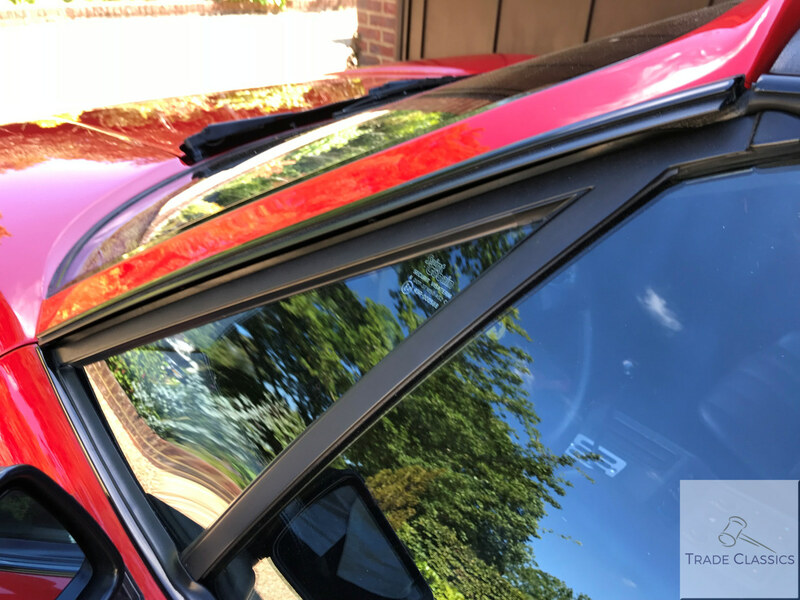 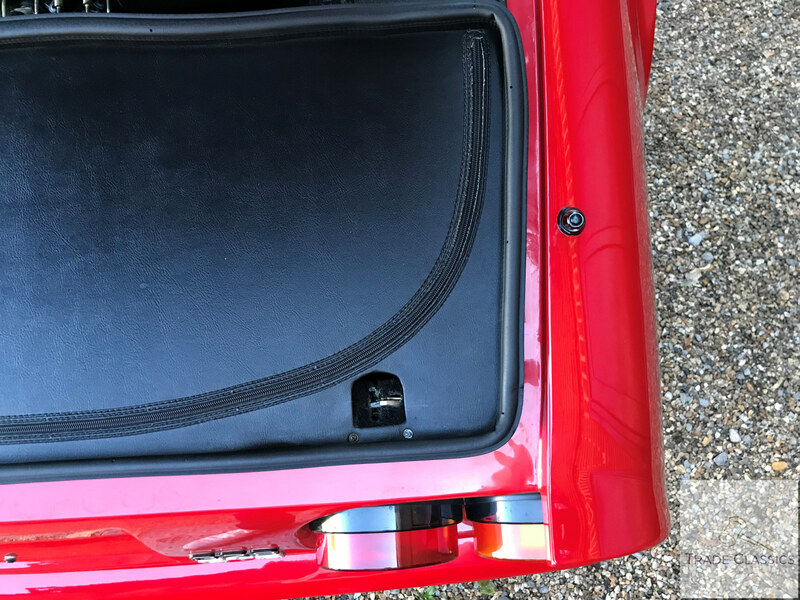 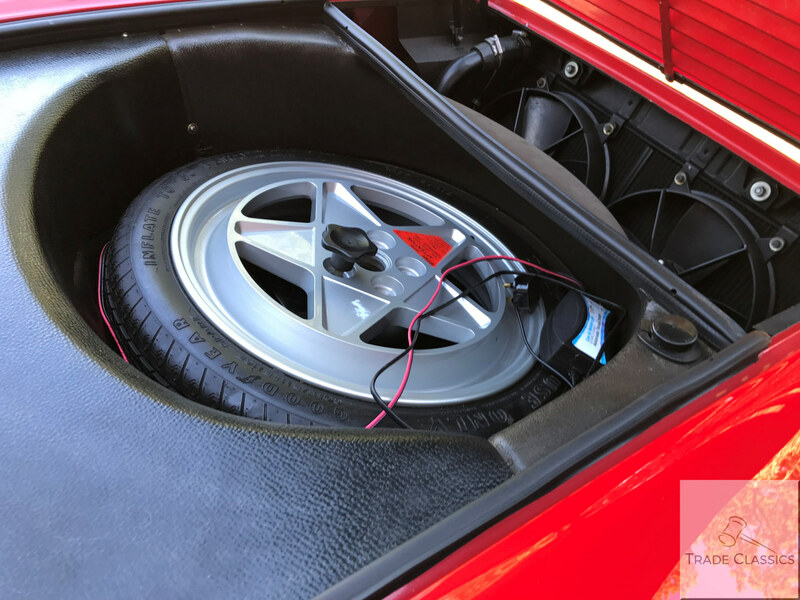 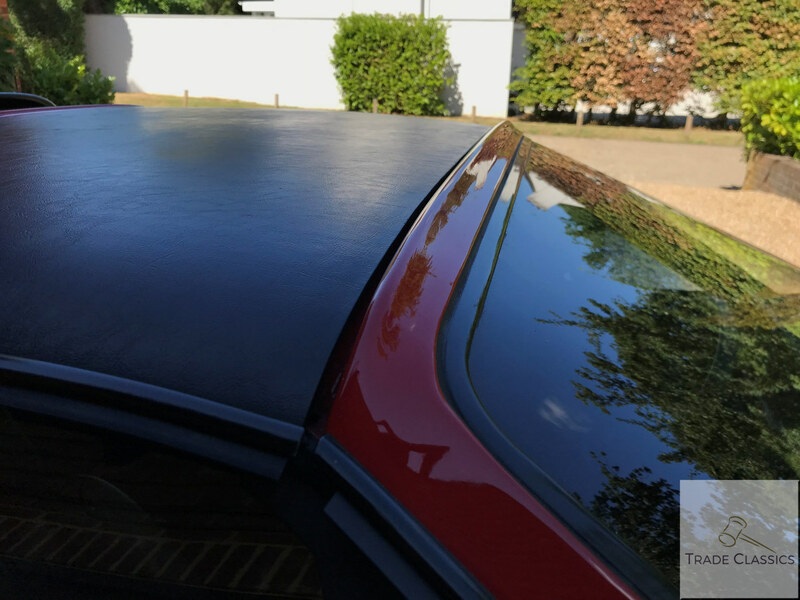 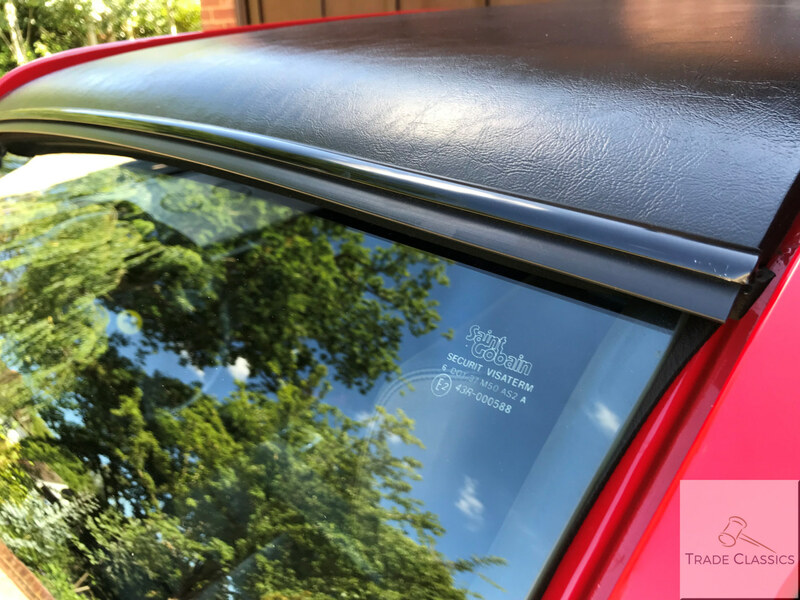 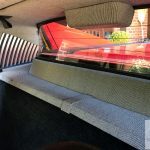 The car is stored near Guilford with Plans Performance, who have been looking after and managing the car on Gary’s behalf, and will be available for viewings at their storage facility. 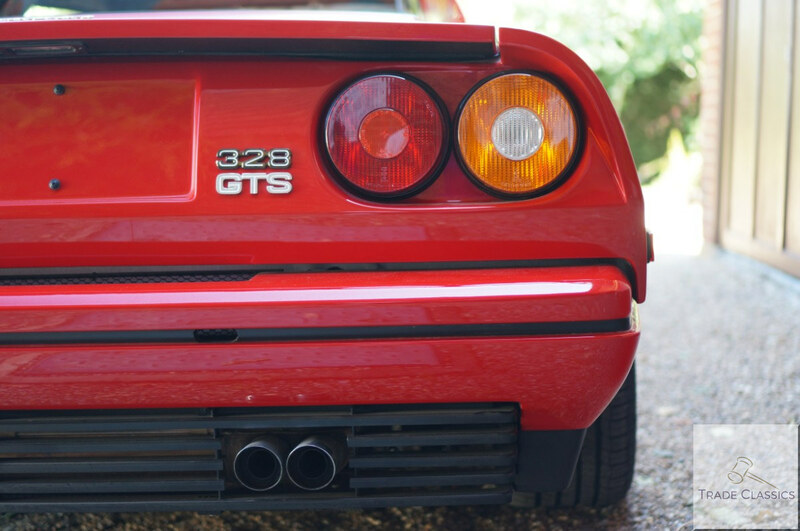 The 328 really is quite a striking car. 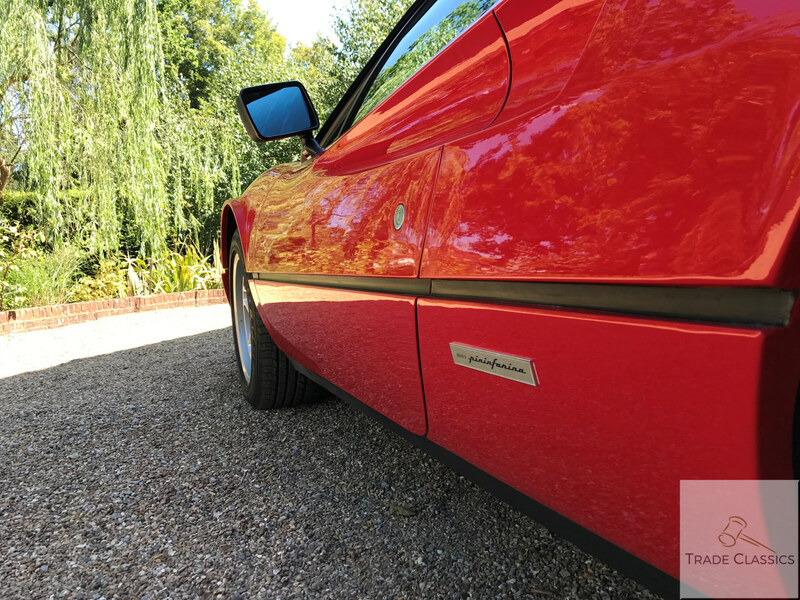 You can imagine that the designers at Pininfarina must have loved the opportunity and freedom they were afforded when penning these cars. 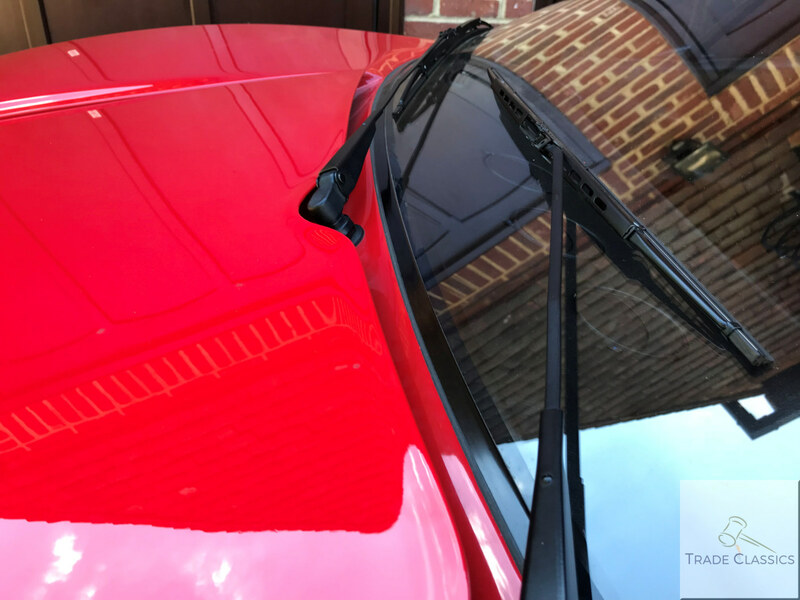 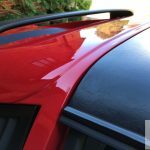 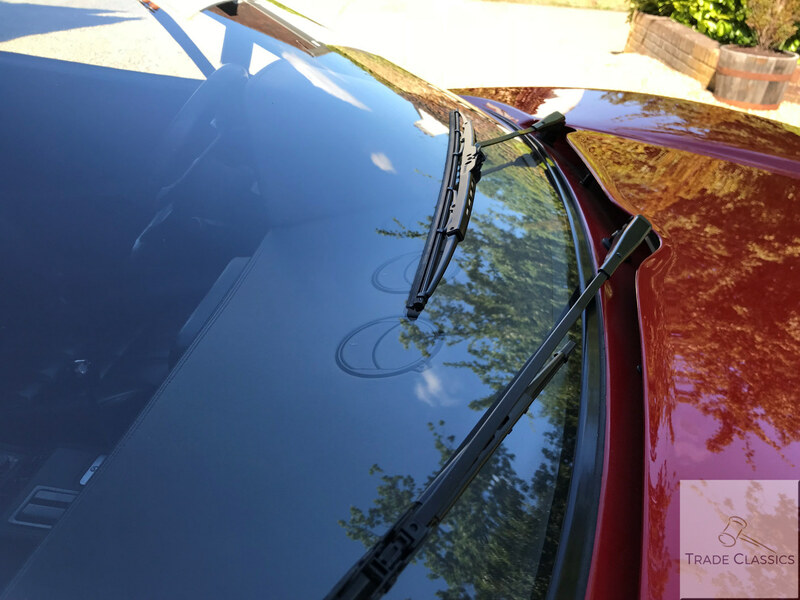 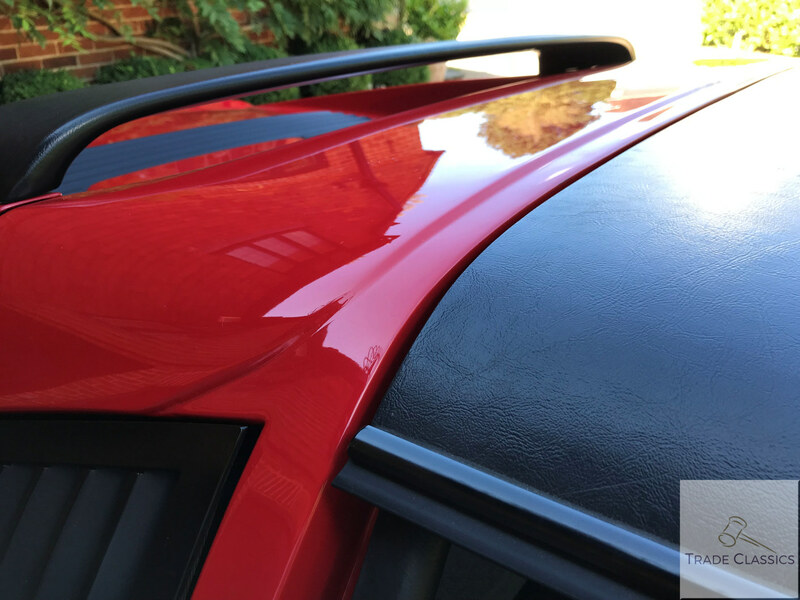 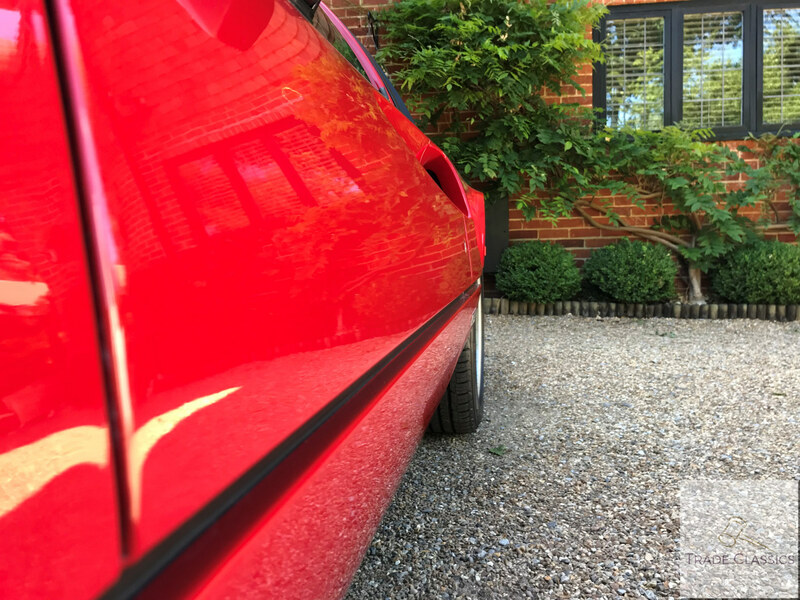 Just take a look at the lines and scoops on this example, as you look forward along the drivers side… something to behold. 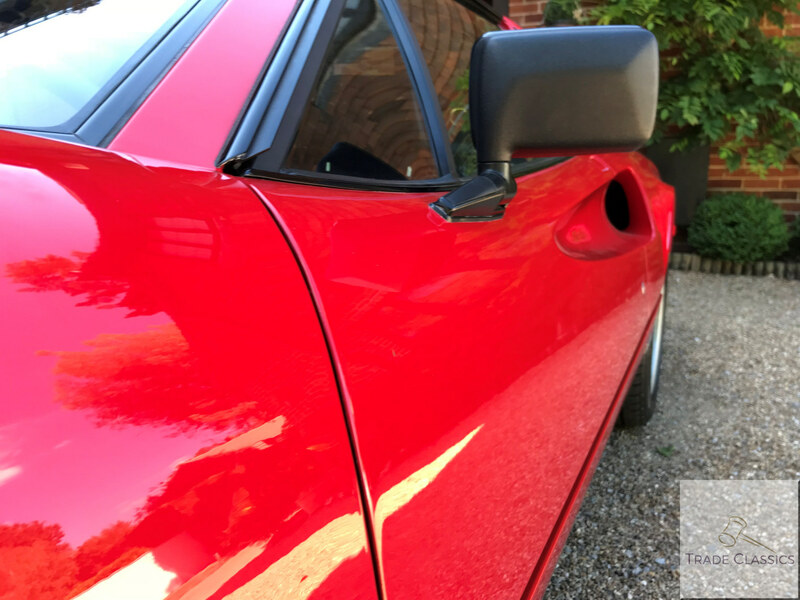 As you would expect with such a low mileage example, there are barely any imperfections in the bodywork. 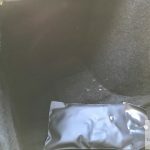 We have detailed anything observed below. 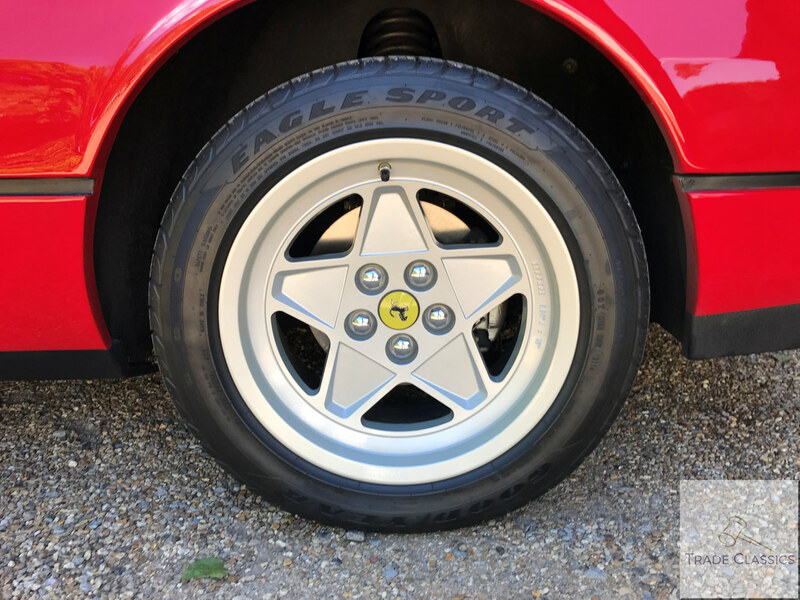 The car is sitting on Goodyear tyres, wrapped on the original 7 and 8 inch 5 star alloys. 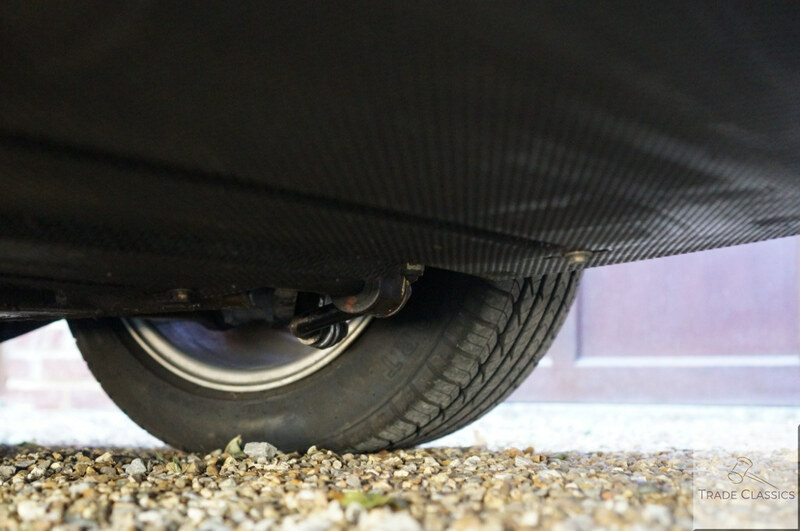 The alloys across the car are completely unmarked, as can be seen in the videos and photographs. 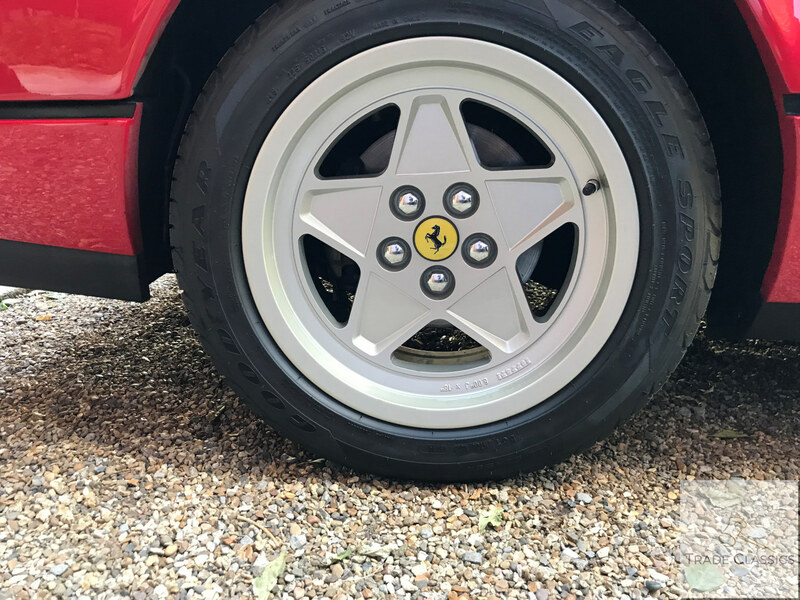 You’ll notice these are the flat wheels, not domed, as this car is the more desirable pre-ABS variant. 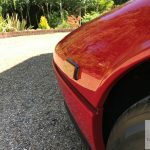 The bodywork across the car is immaculate. 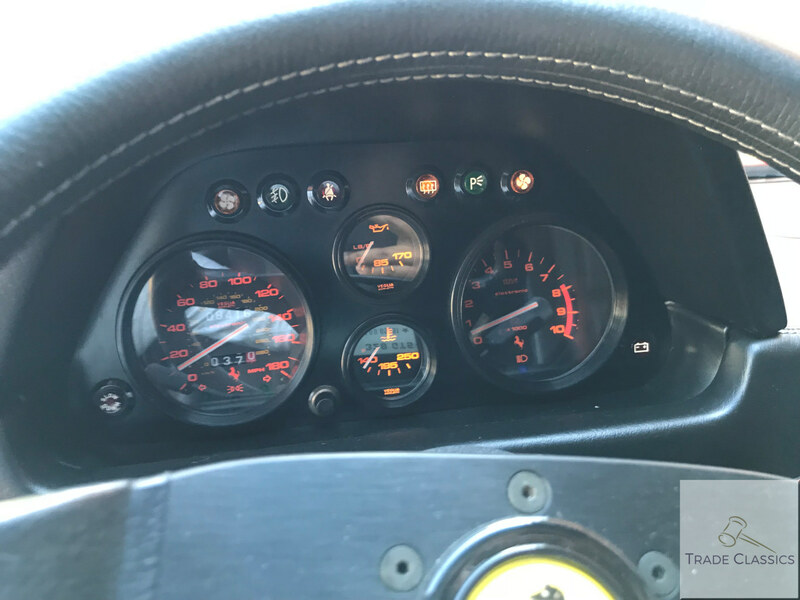 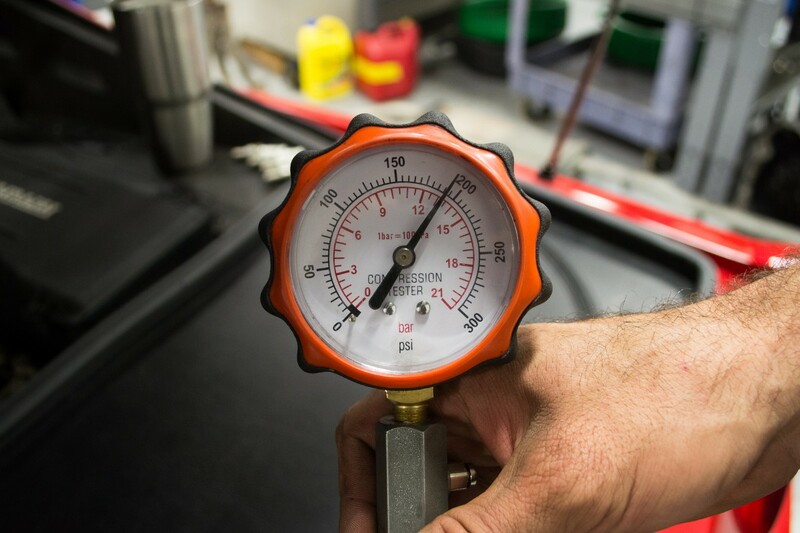 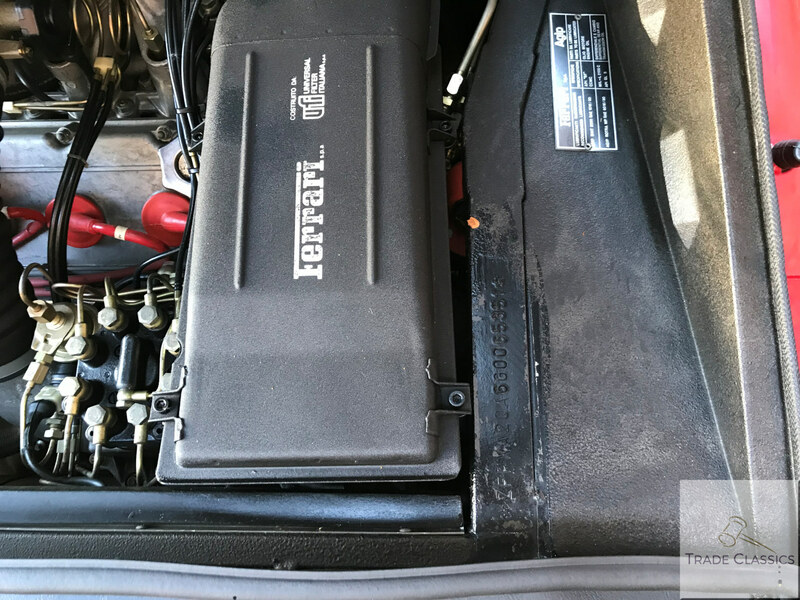 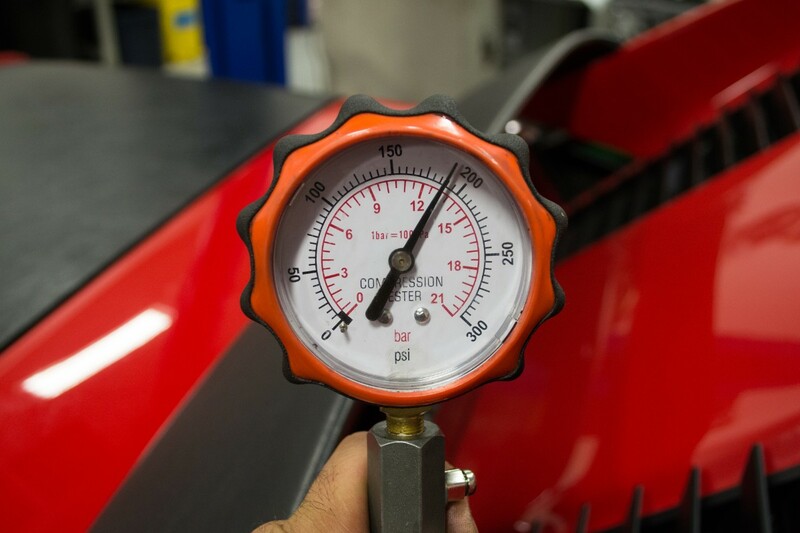 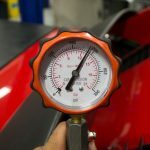 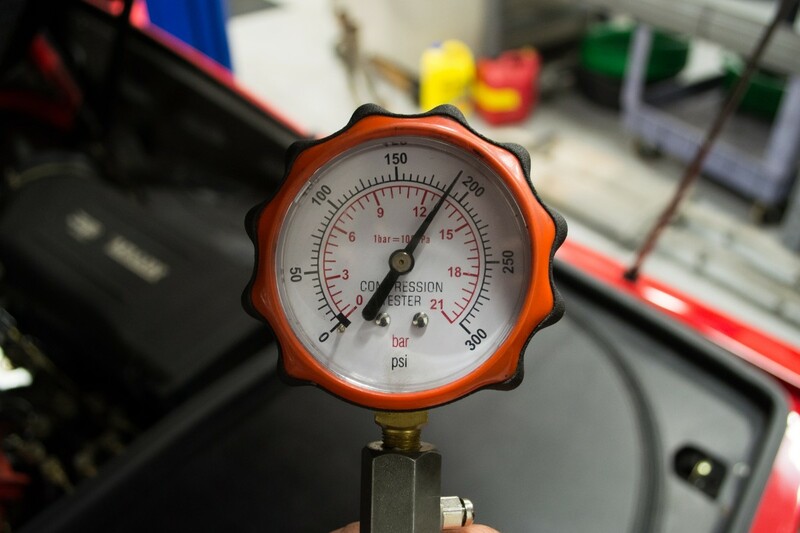 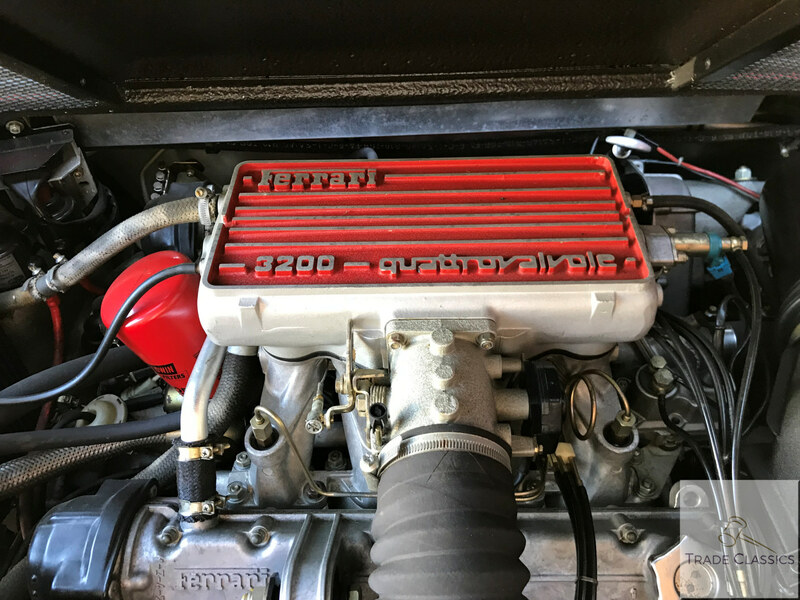 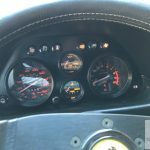 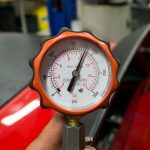 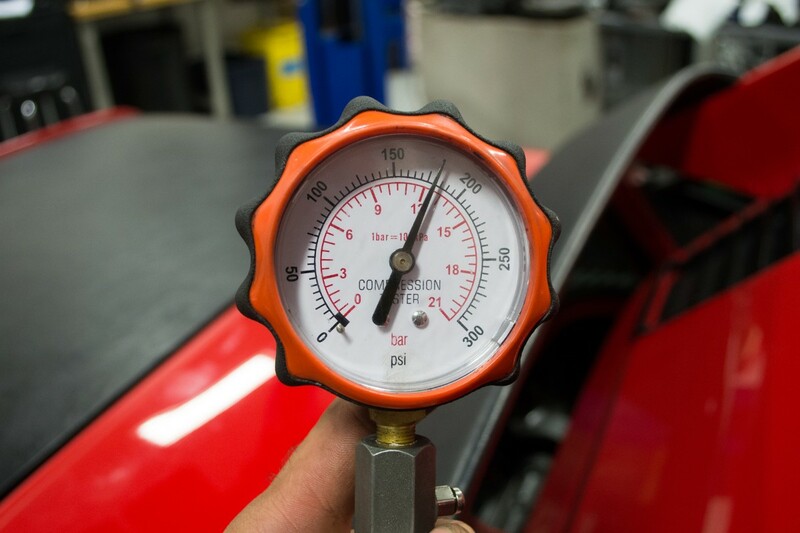 You wouldn’t expect anything less on a car like this Ferrari that has only been driven just over 8,000 miles. 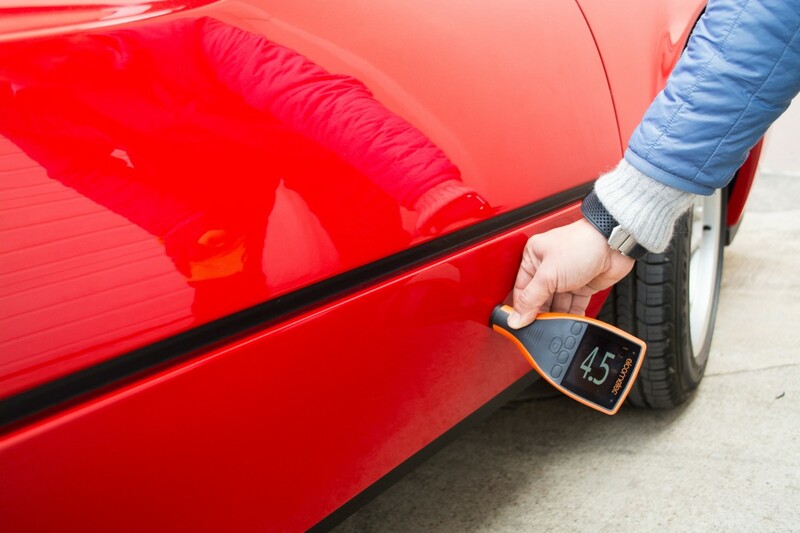 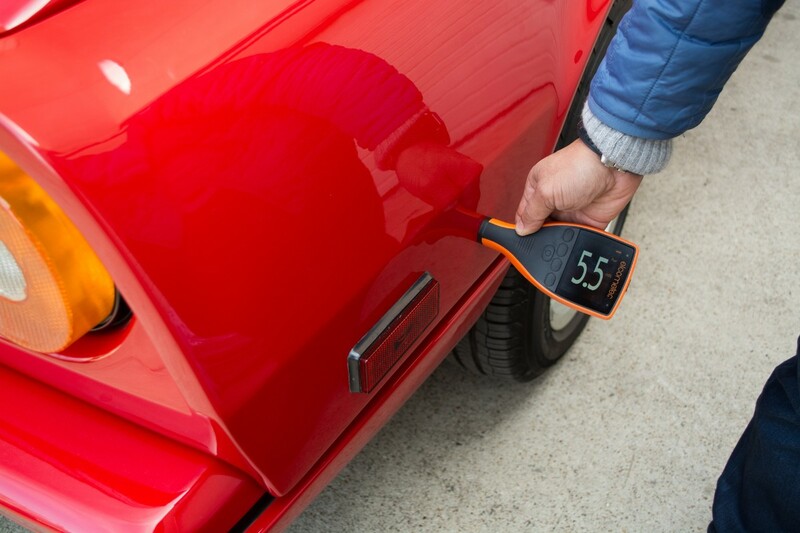 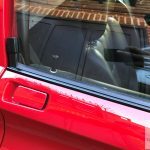 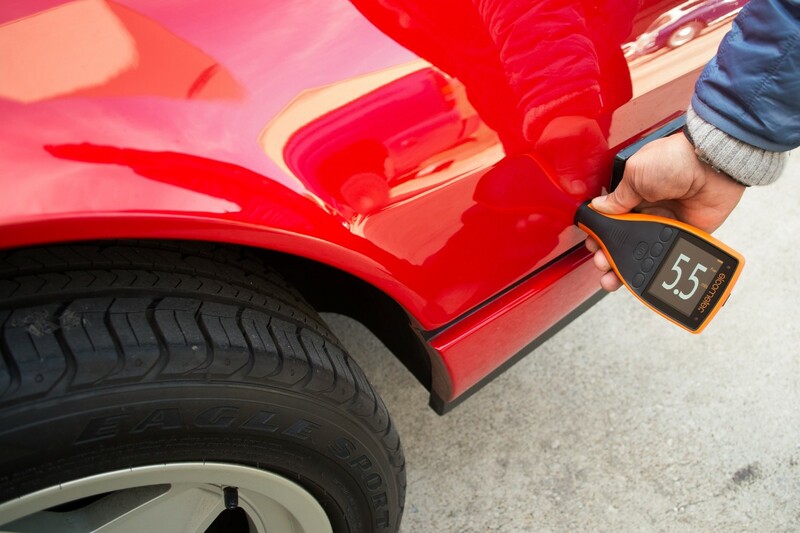 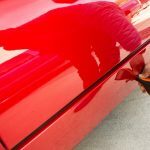 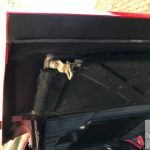 The only blemish is a small dent on the boot, likely caused by someone closing the boot. 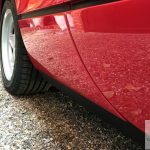 Gary has commission it to be taken out by a dent removal specialist, leaving the bodywork in the great condition you would expect. 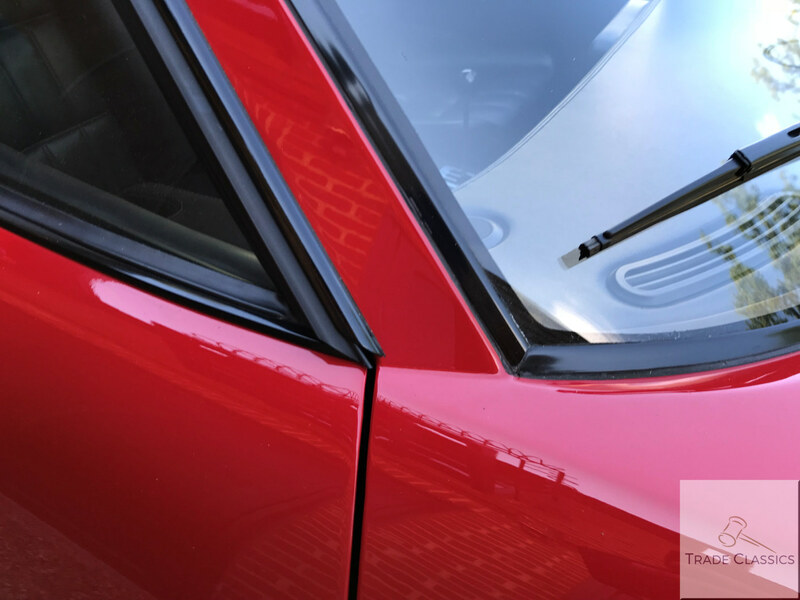 The shut-lines and panel gaps across the car can be seen to be even throughout in our videos and photographs. 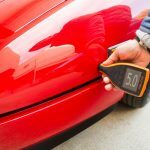 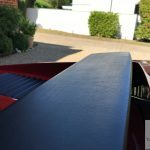 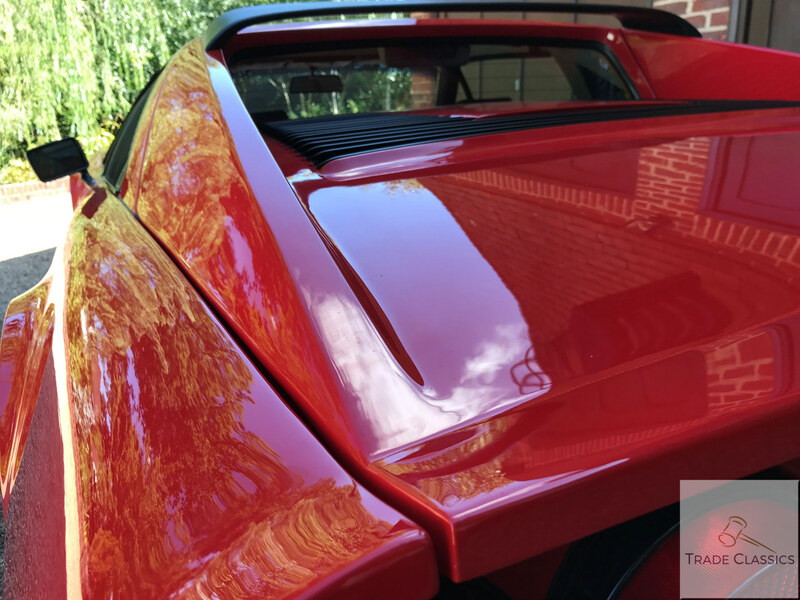 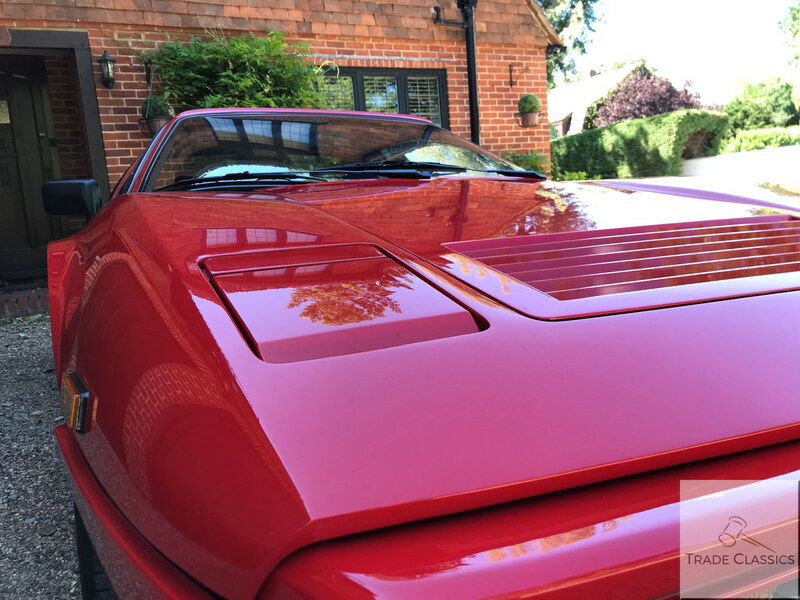 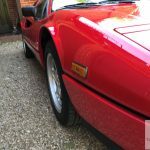 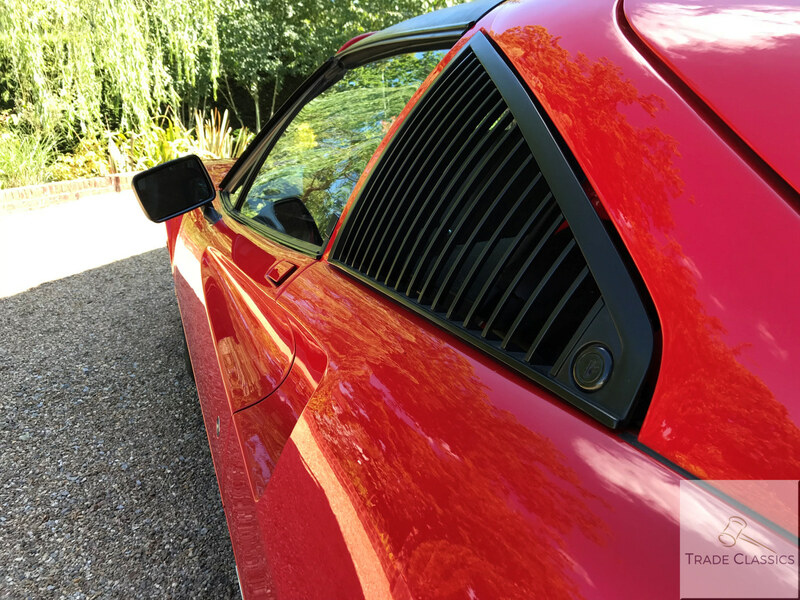 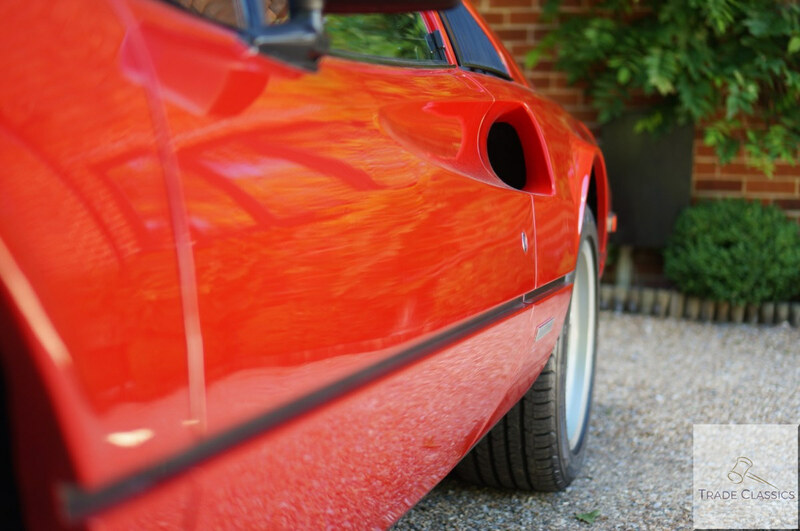 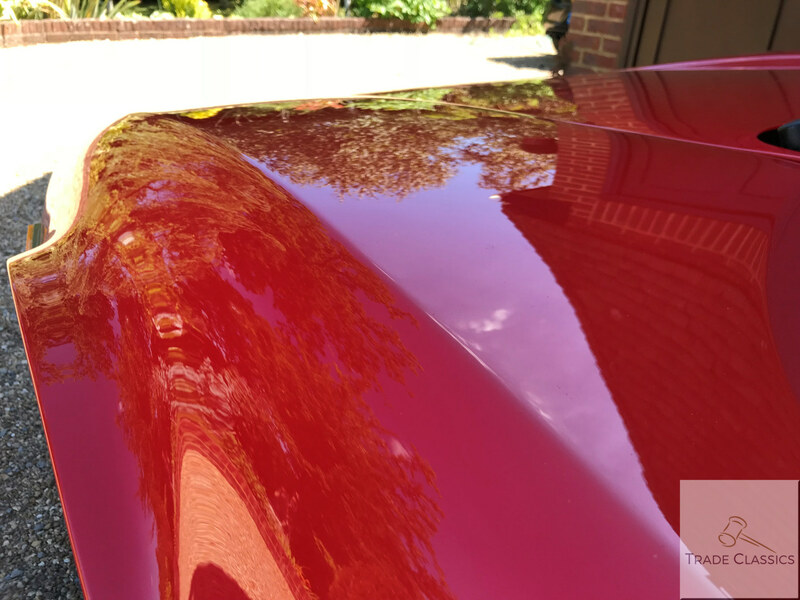 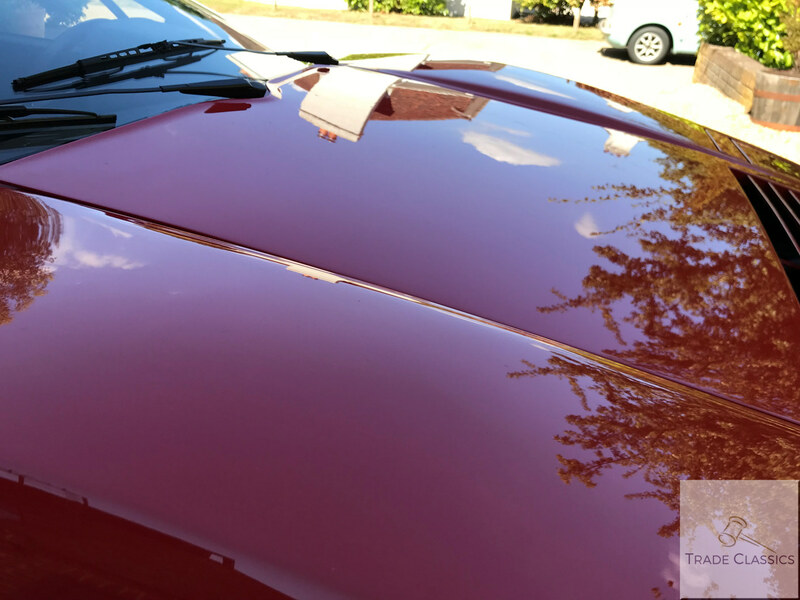 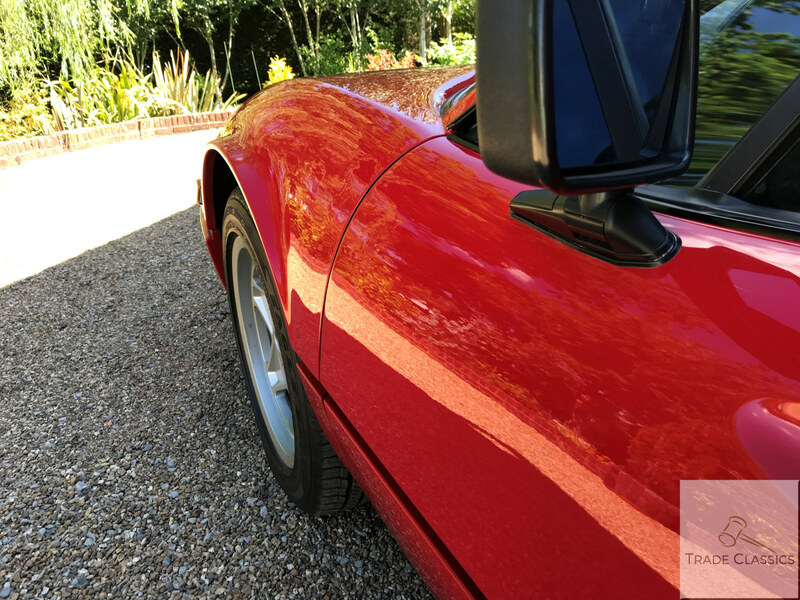 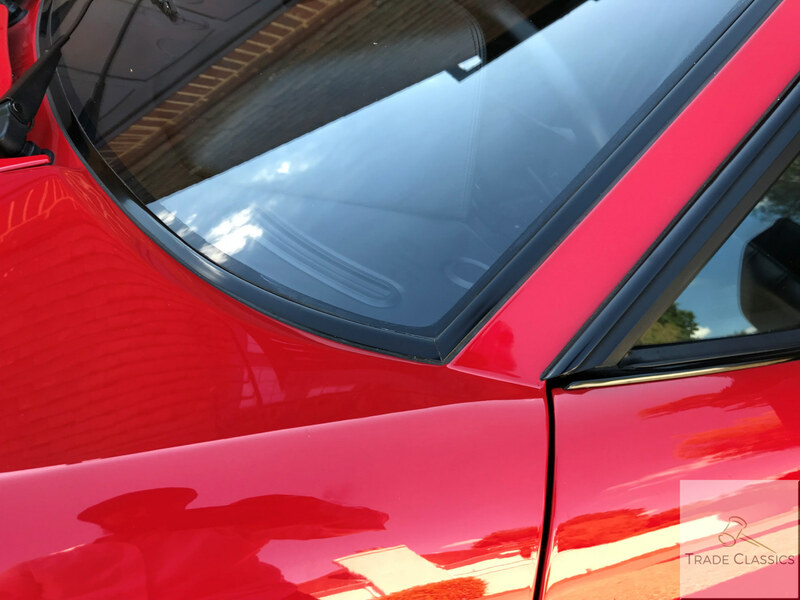 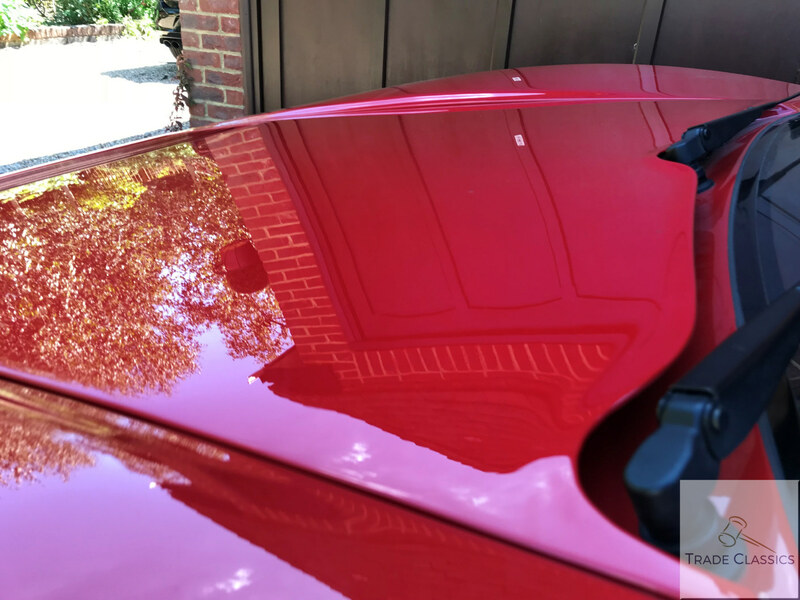 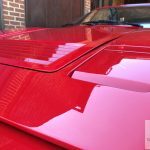 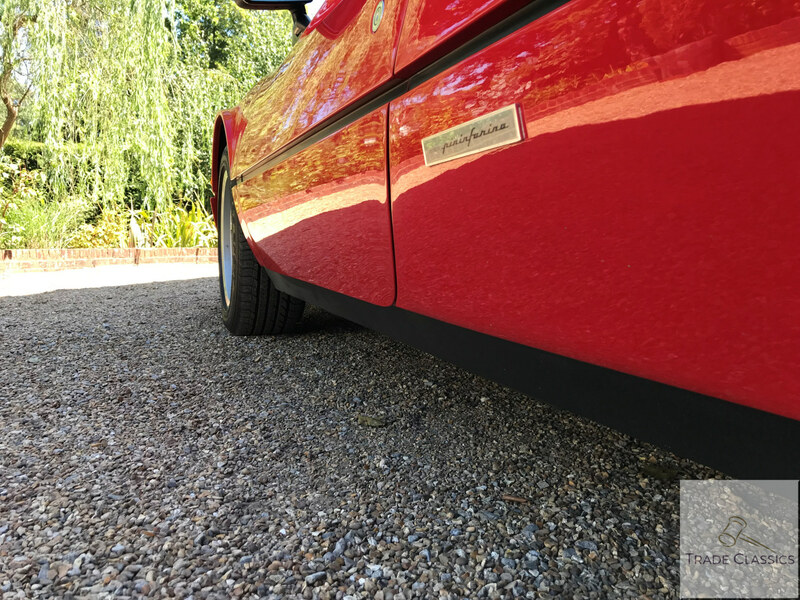 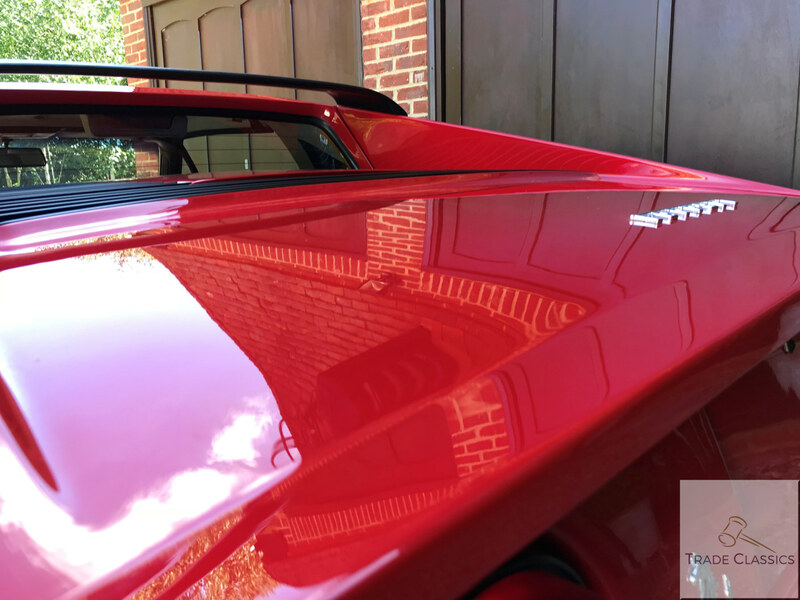 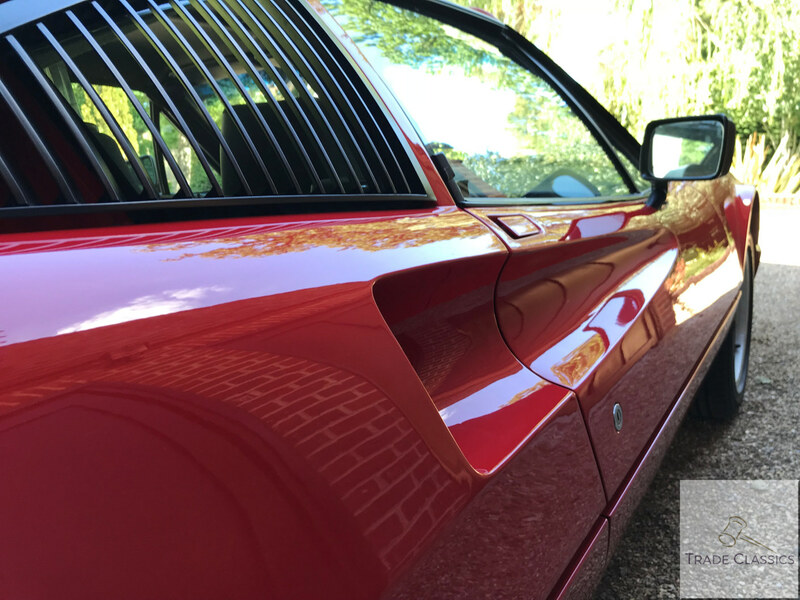 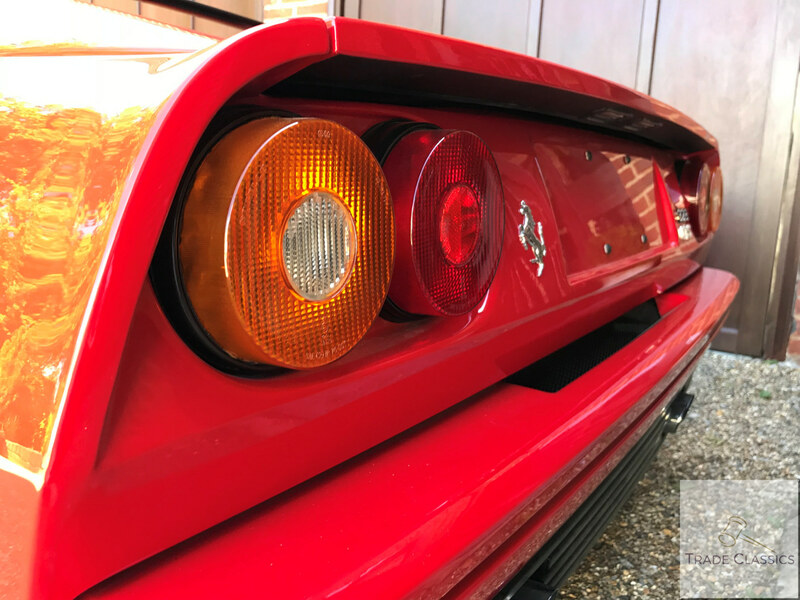 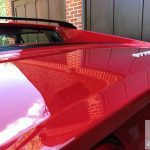 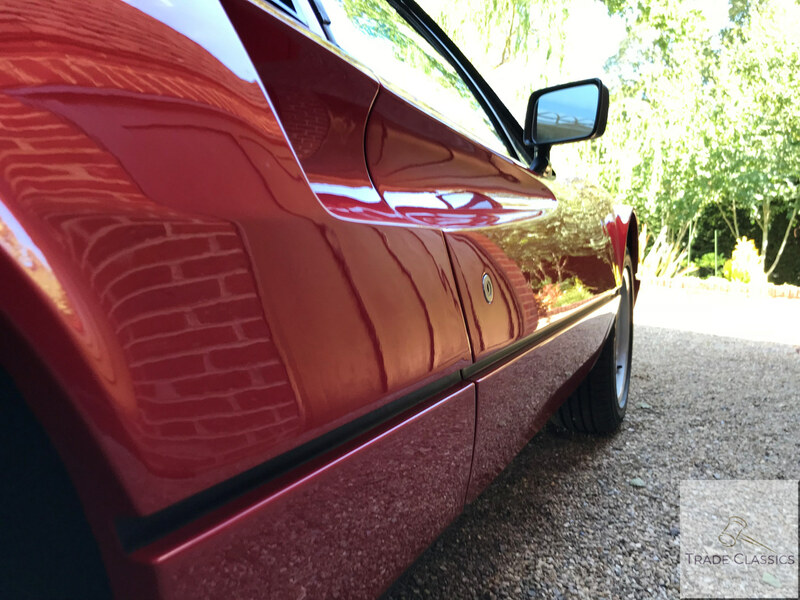 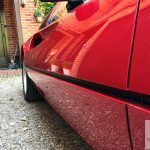 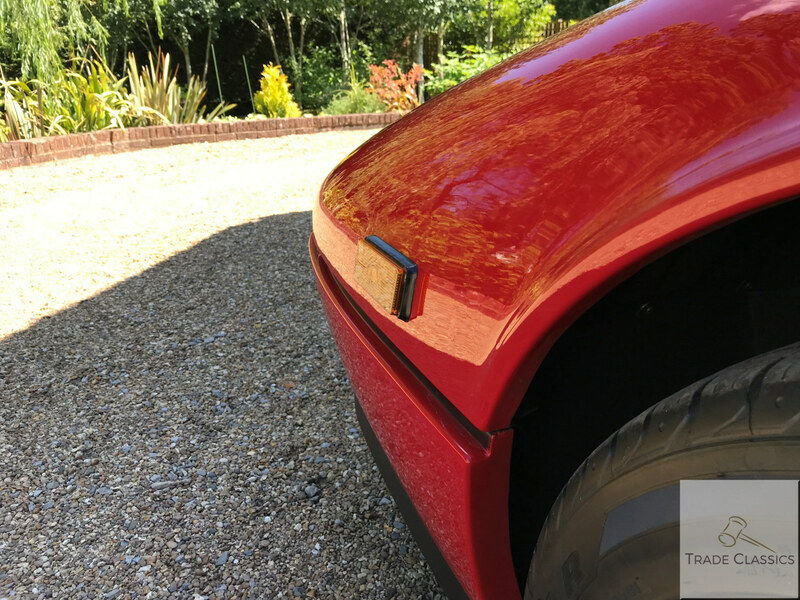 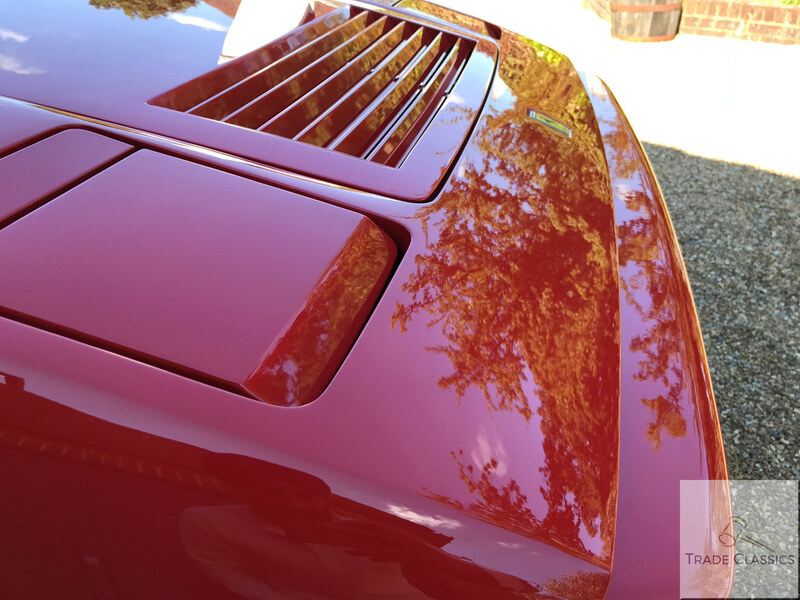 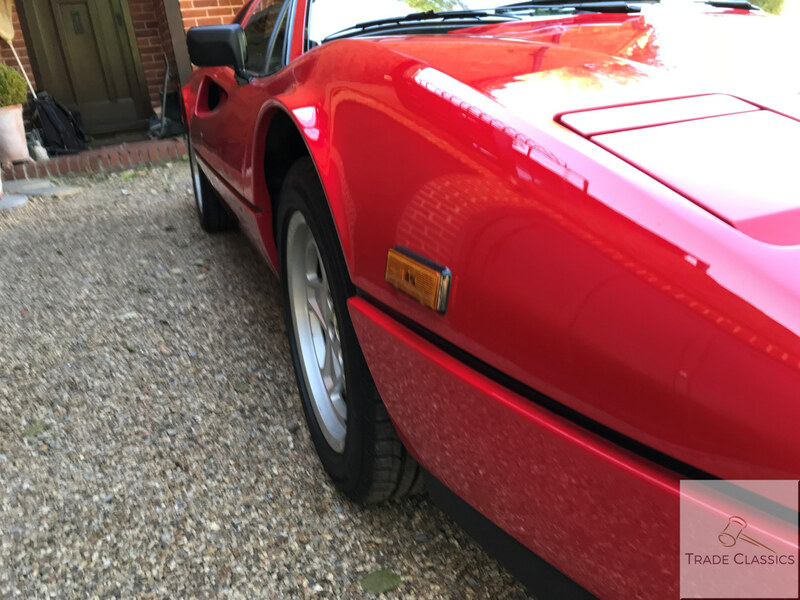 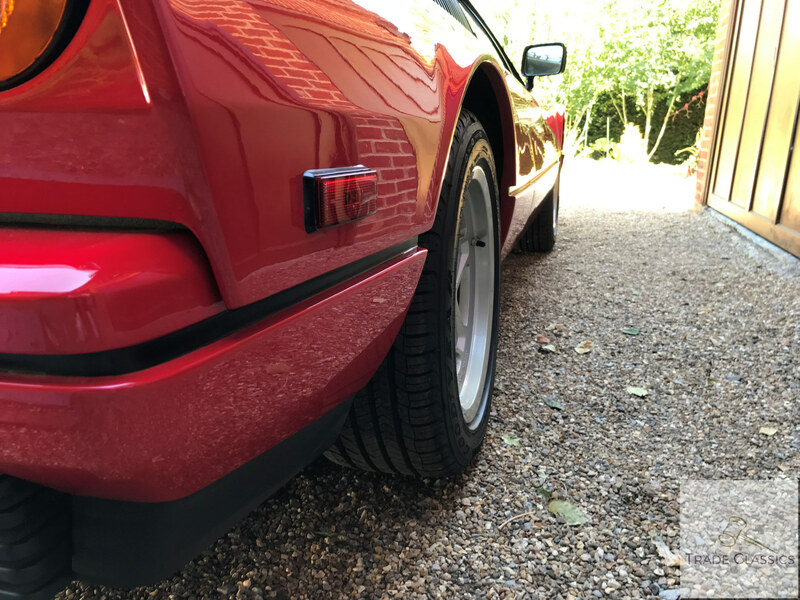 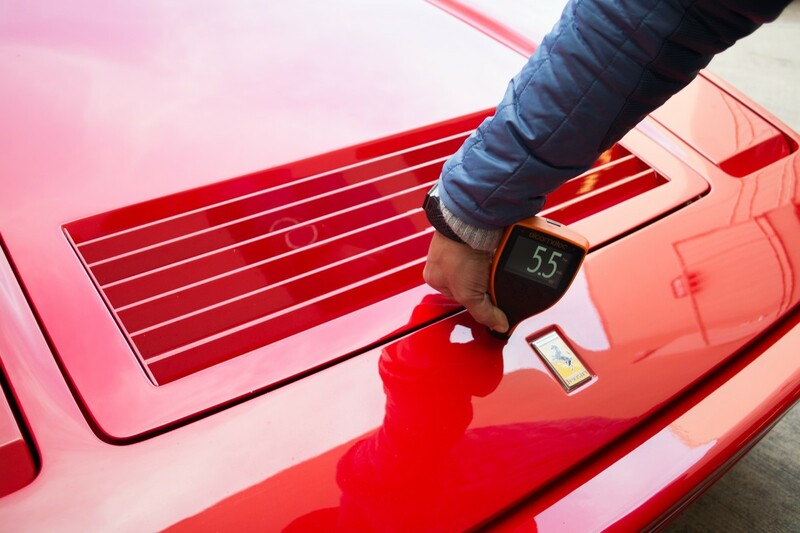 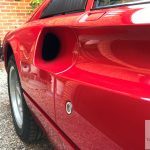 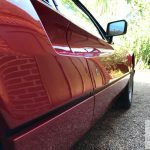 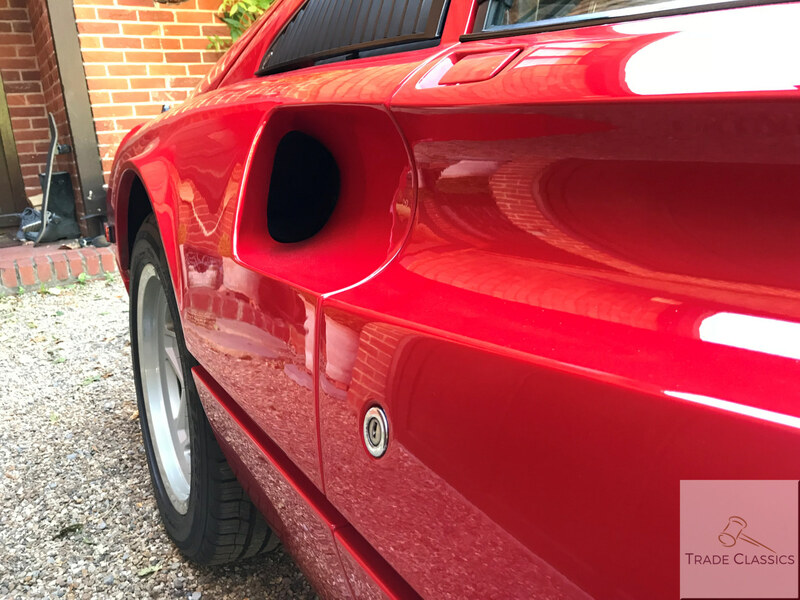 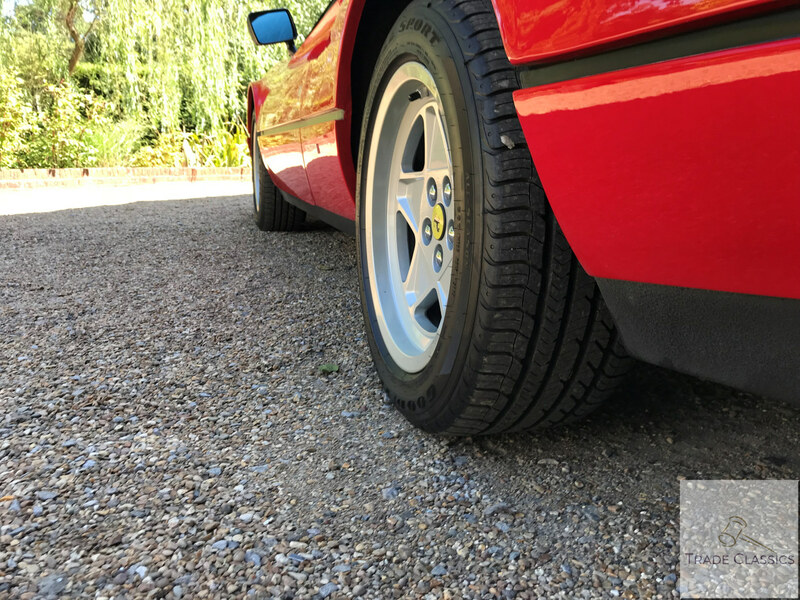 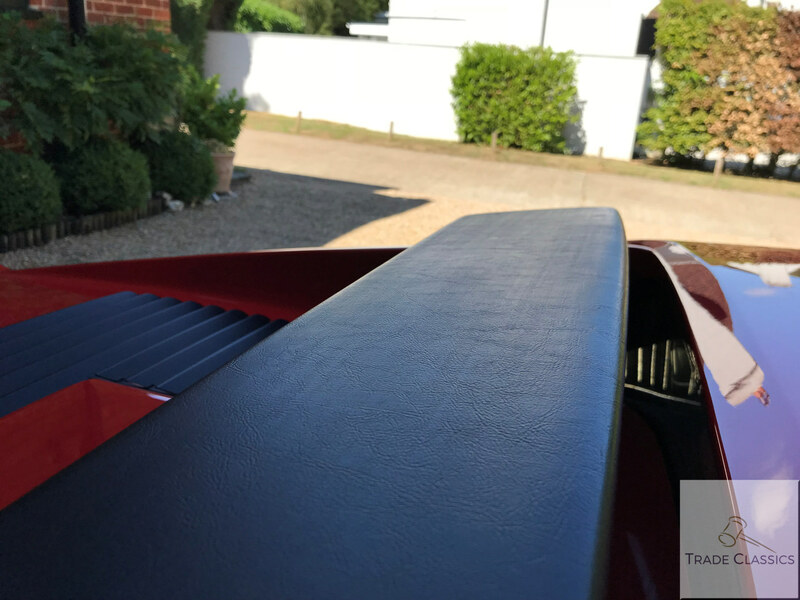 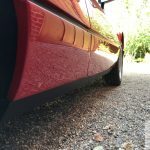 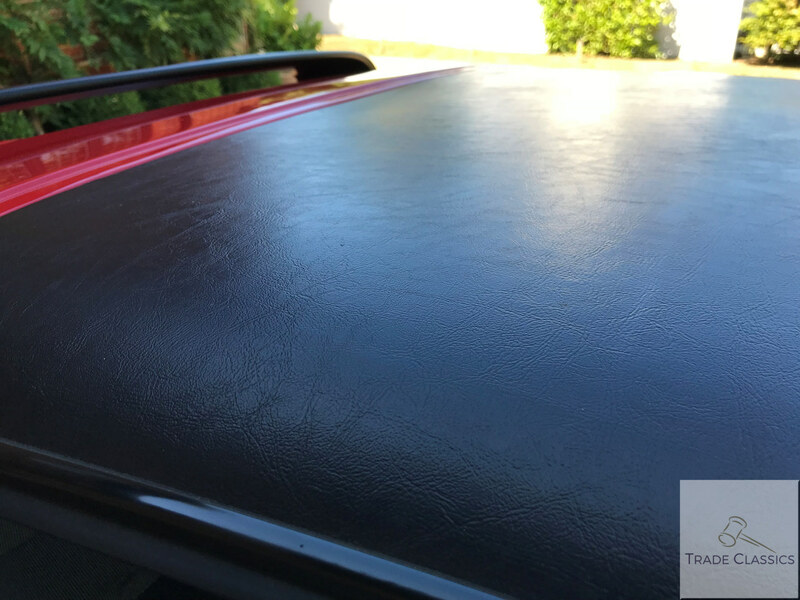 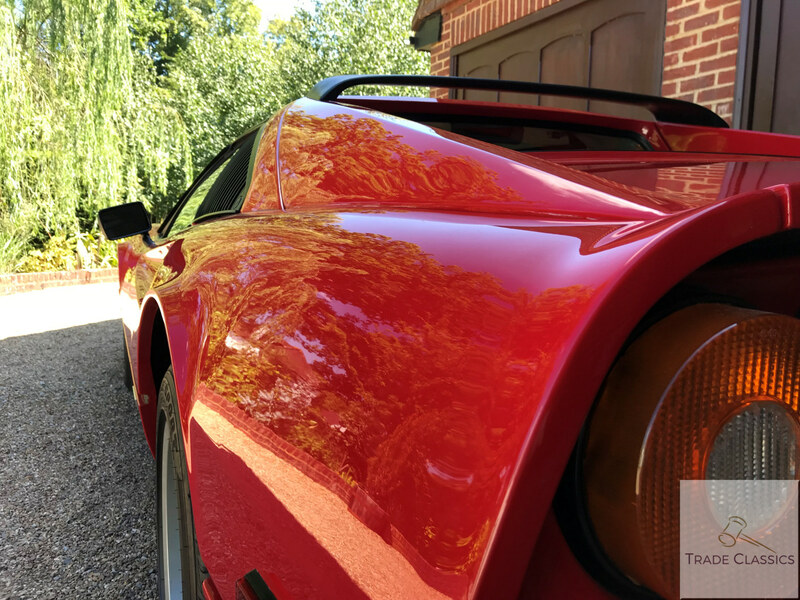 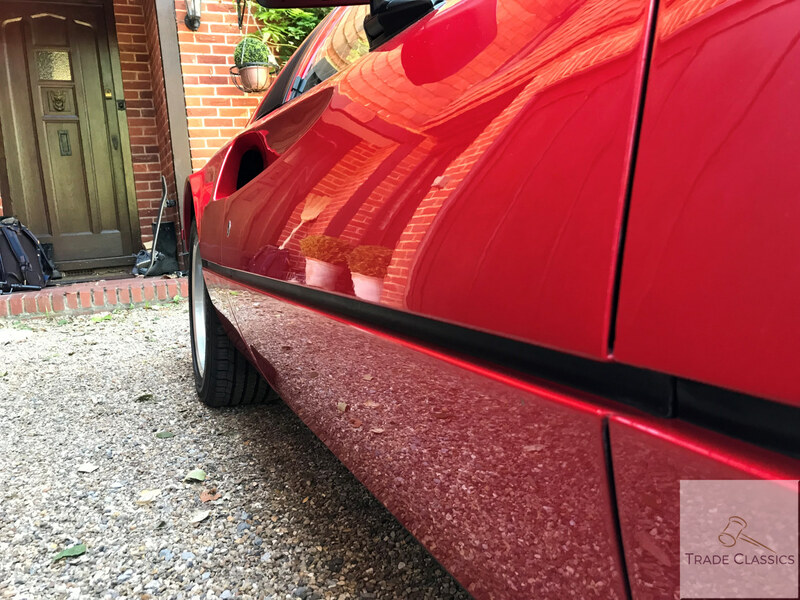 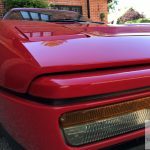 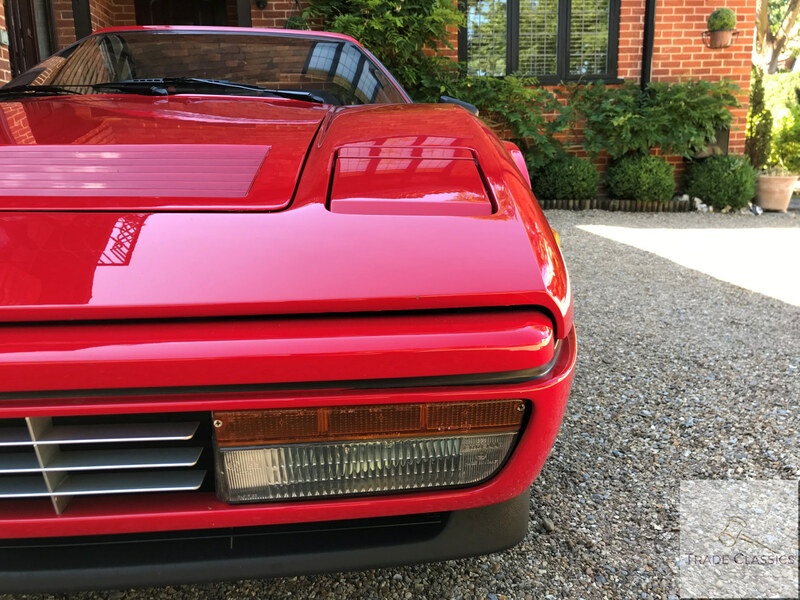 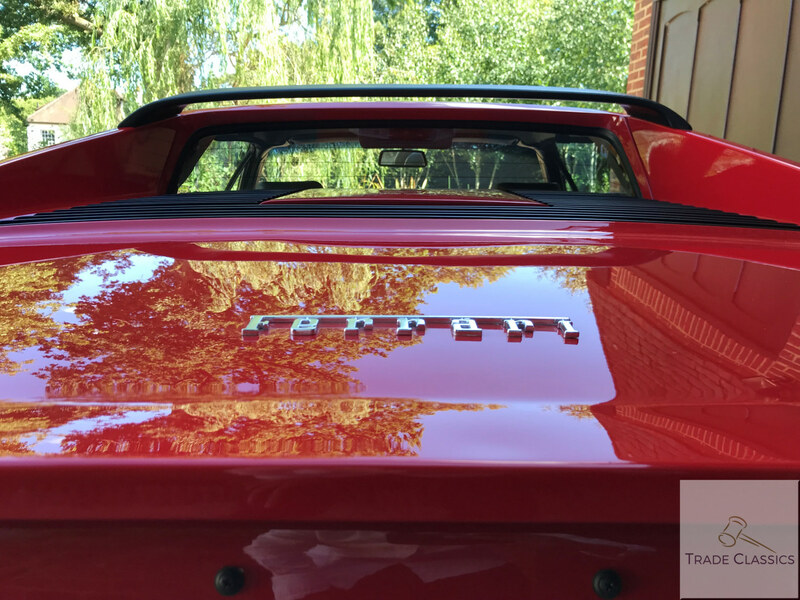 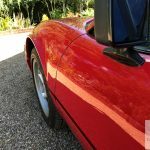 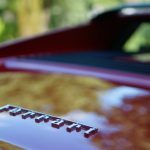 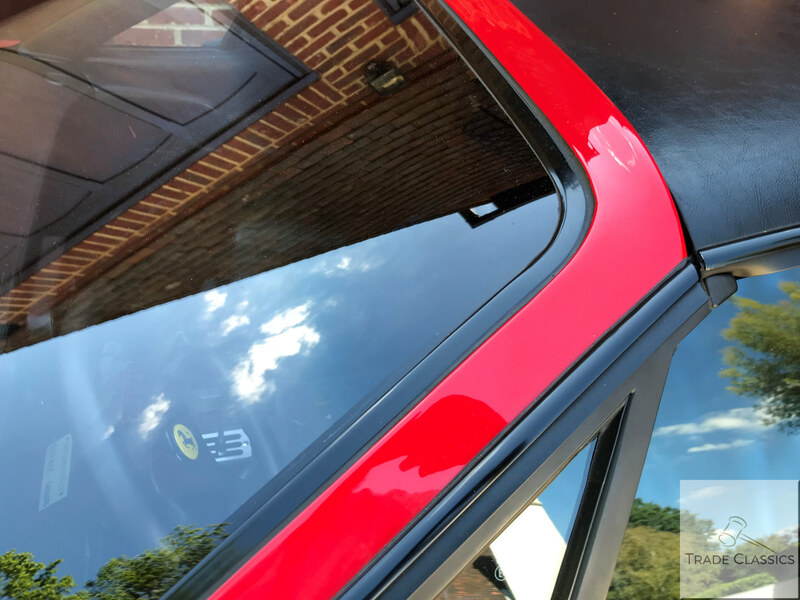 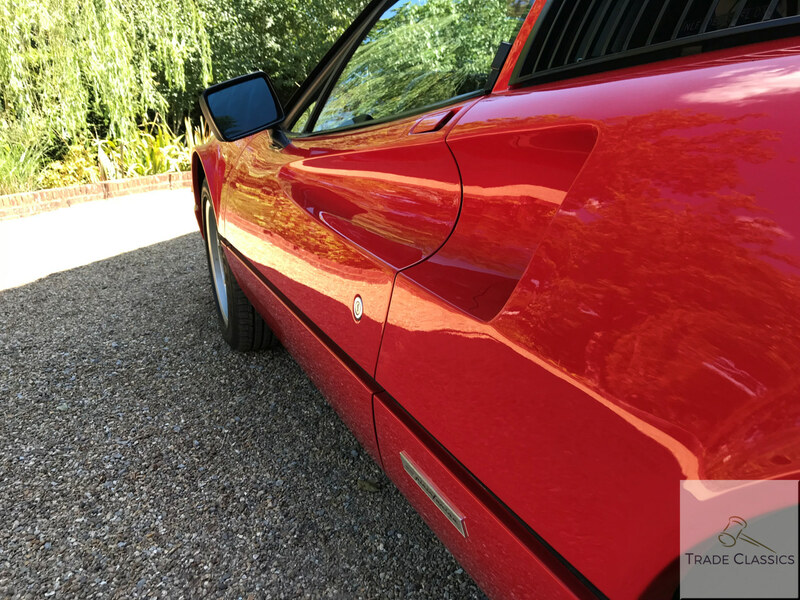 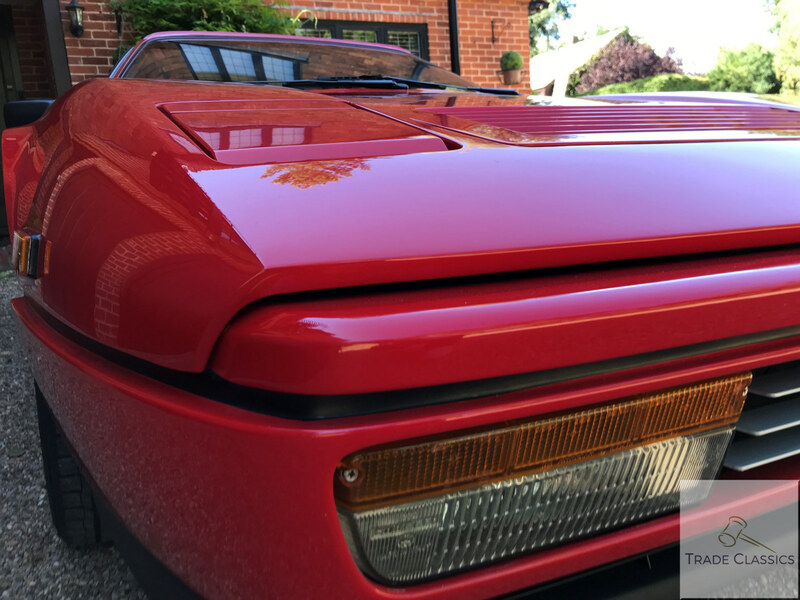 All original paintwork on this Ferrari, as can be observed in the paint depth pictures. 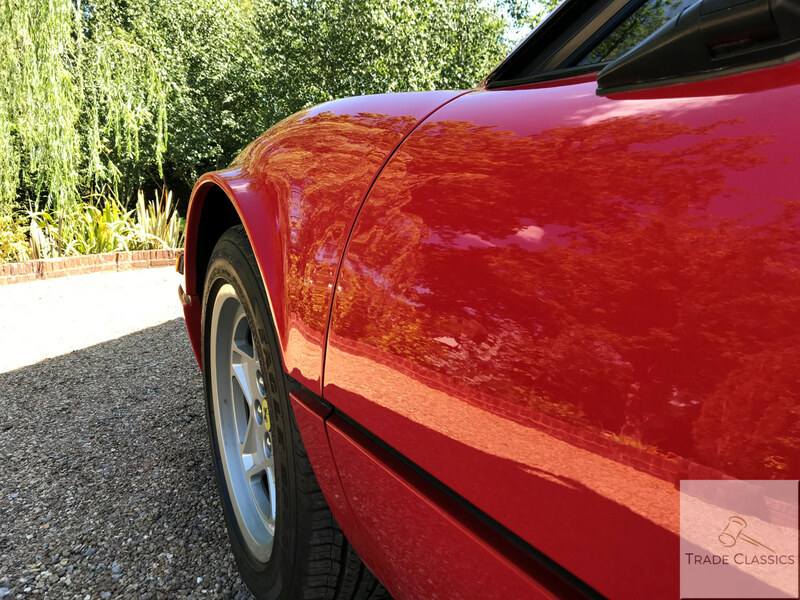 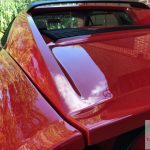 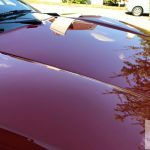 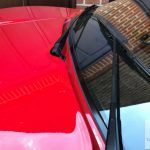 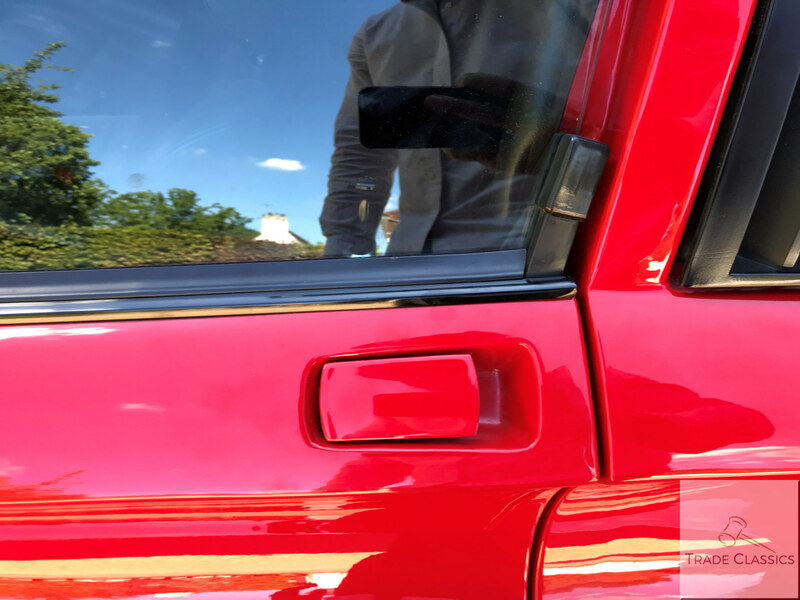 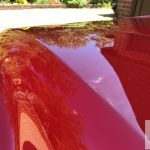 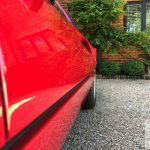 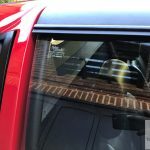 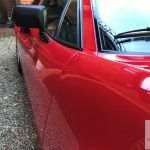 The colour across the car is as a result even, and the paint is in amazing condition with the car obviously having been dry stored in a garage, out of the sunlight. 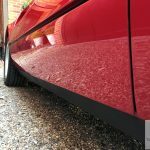 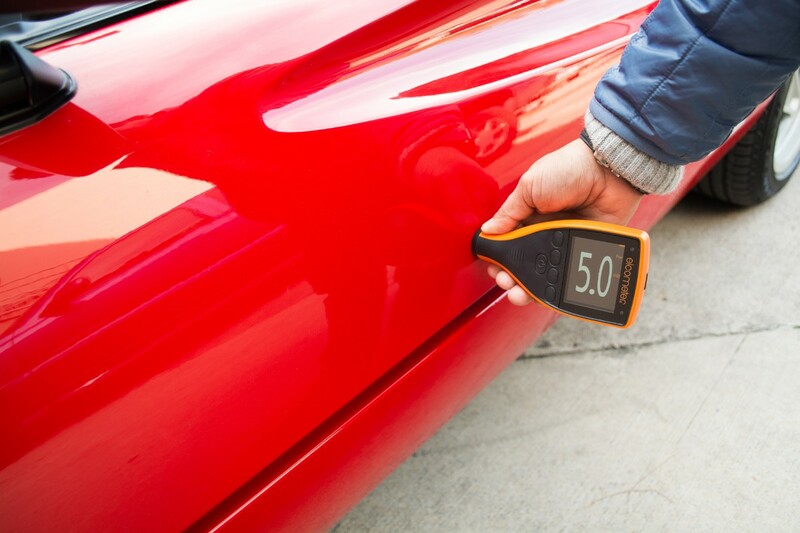 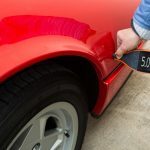 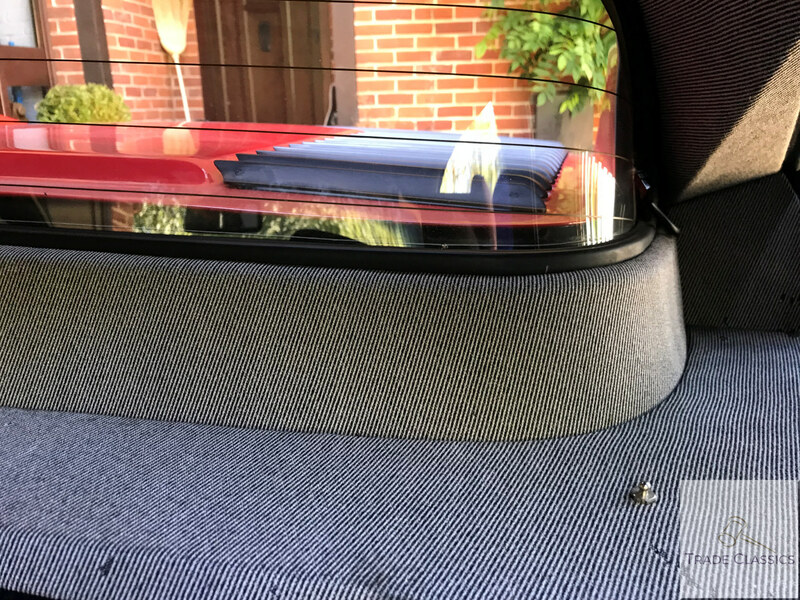 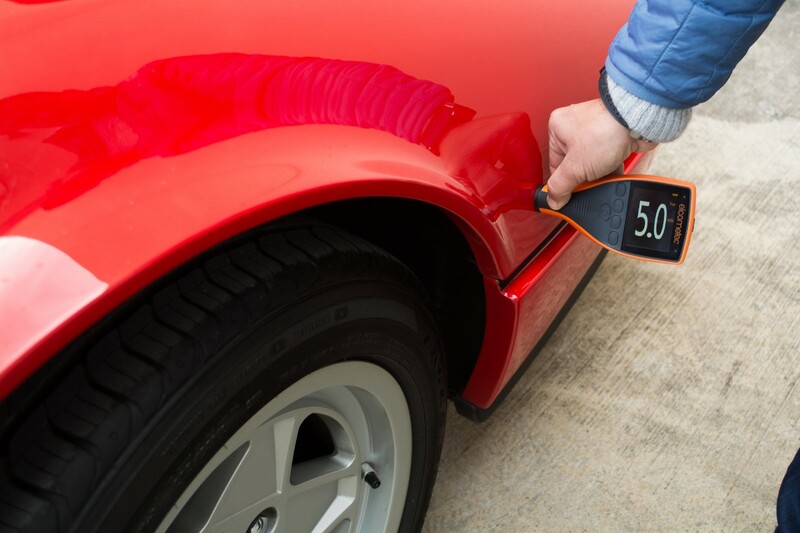 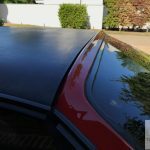 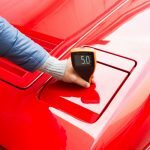 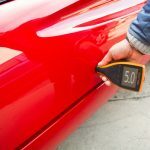 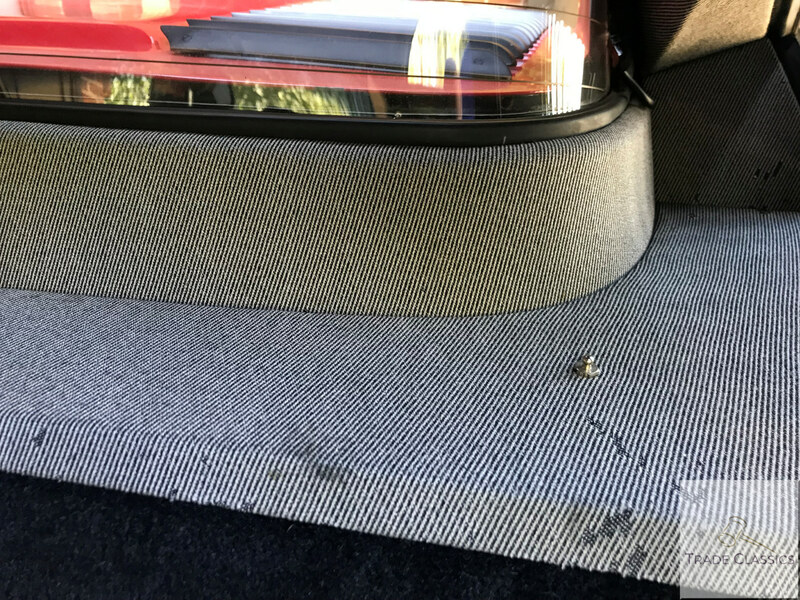 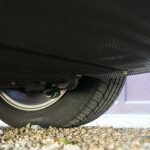 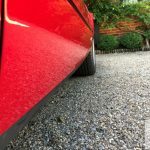 There are a few stone-chips on the front of the car some of which have been touched up, and this tiny wear is expected with the low mileage usage. 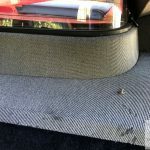 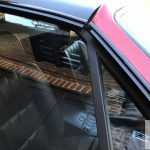 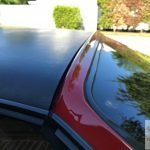 All the glass and trim across the car are is in great condition. 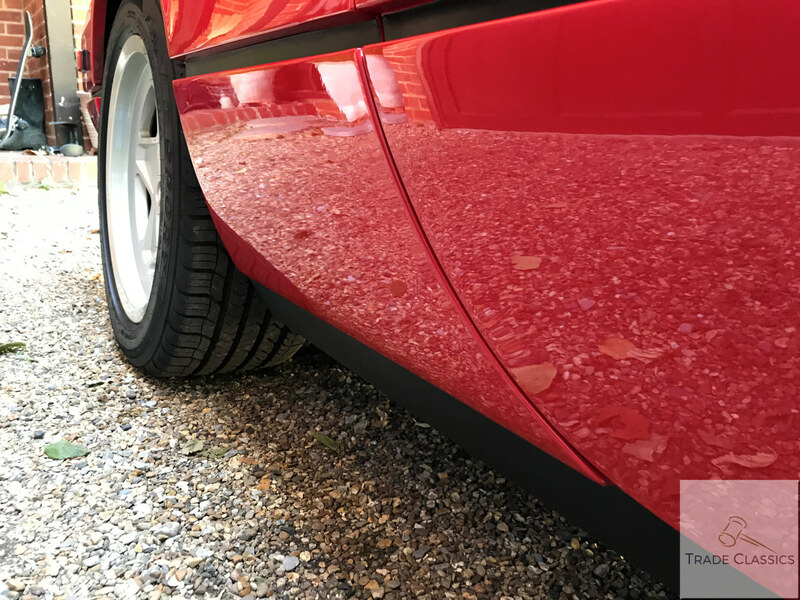 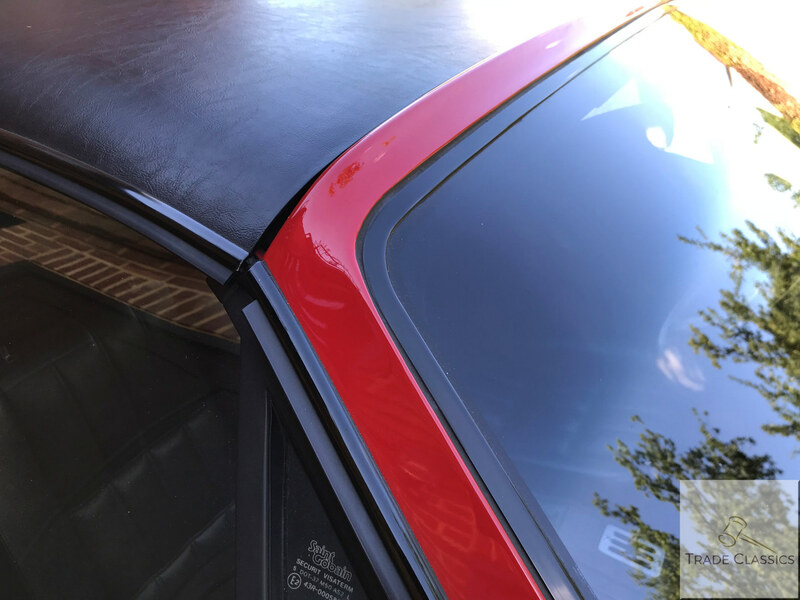 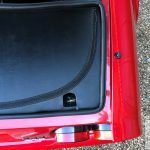 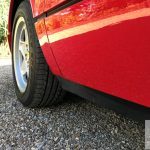 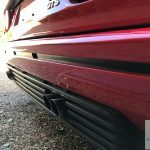 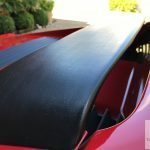 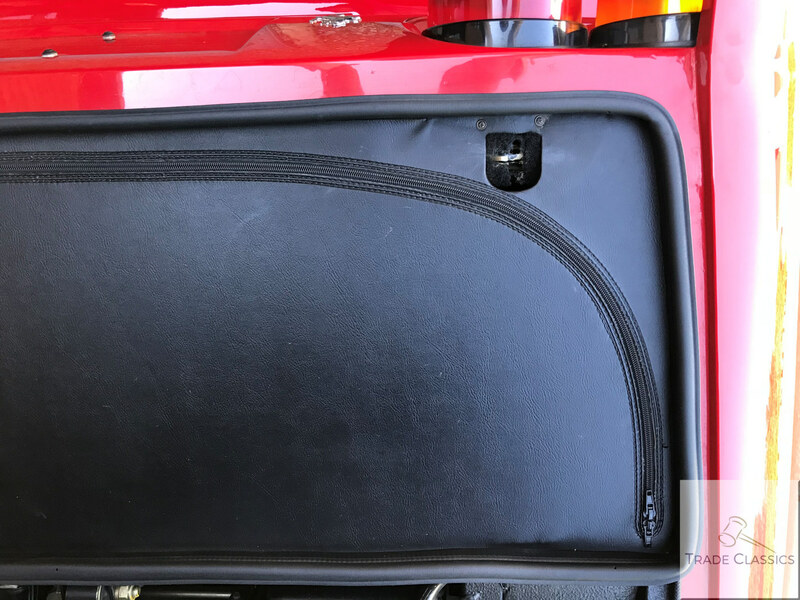 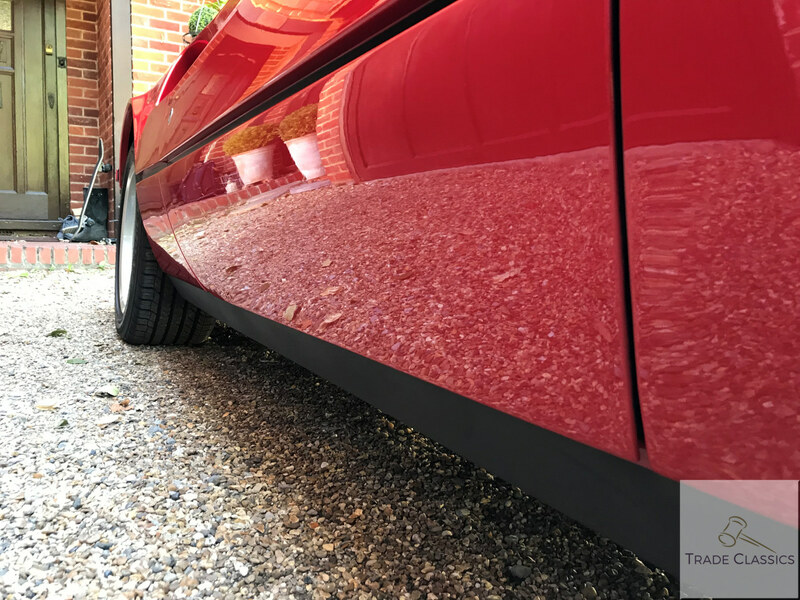 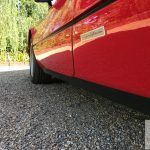 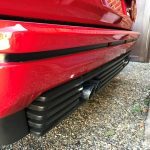 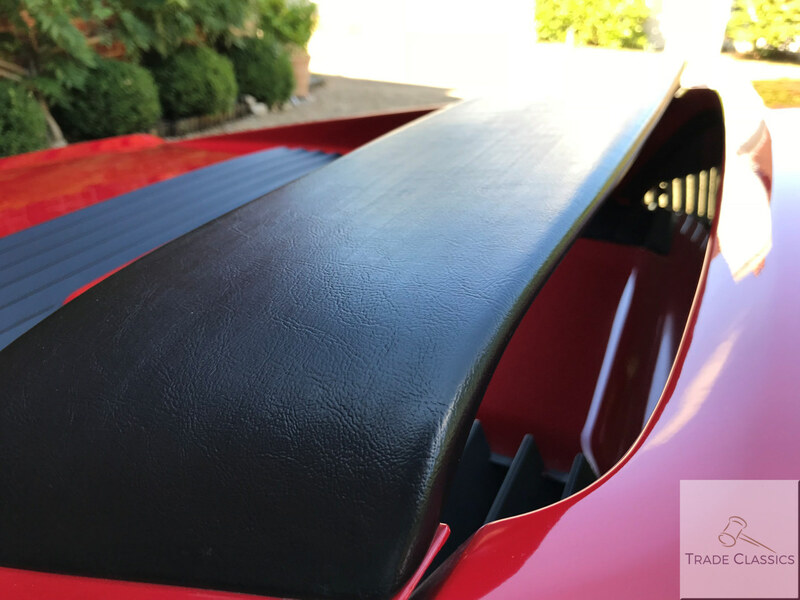 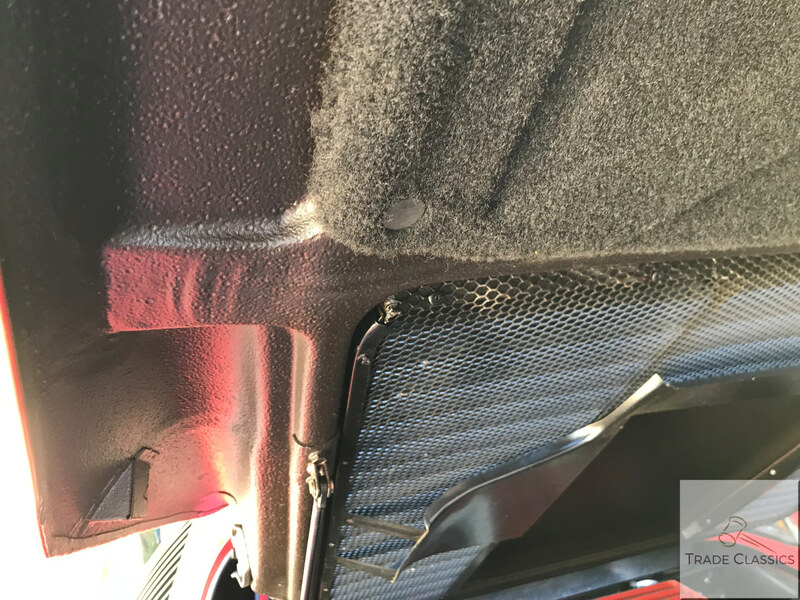 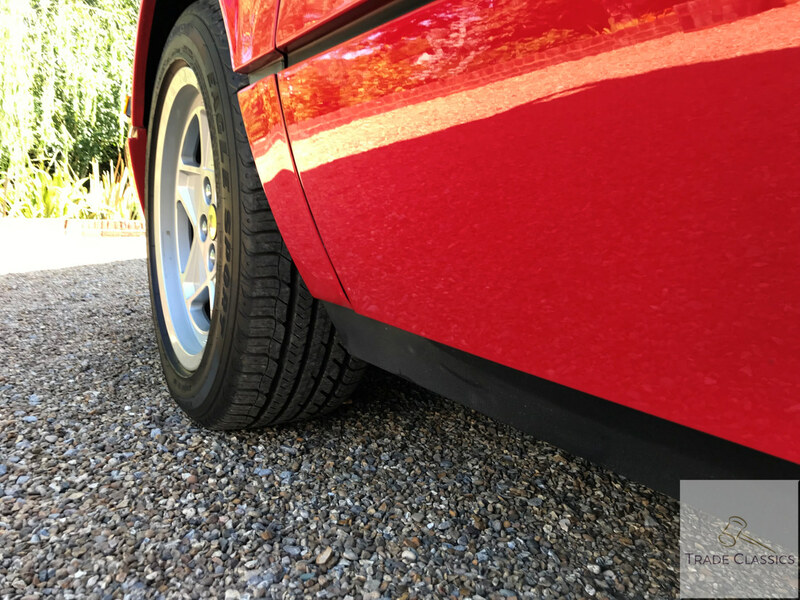 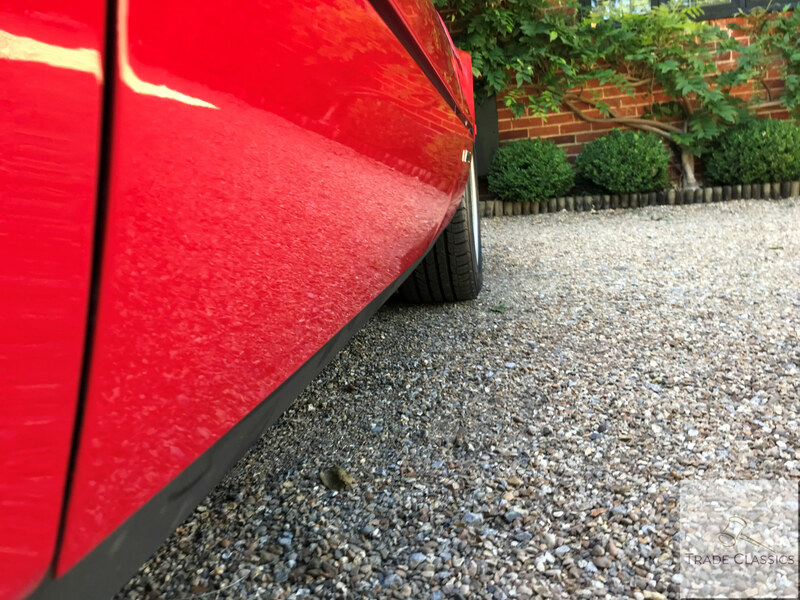 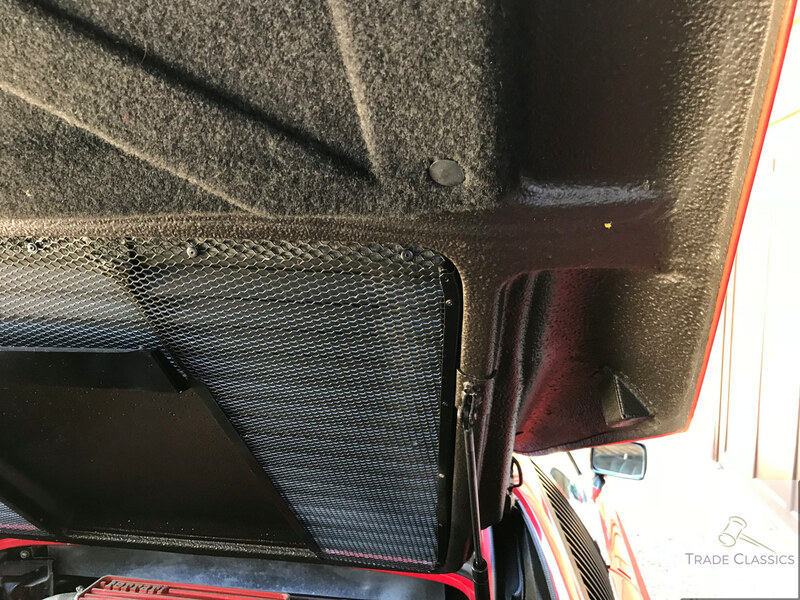 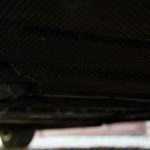 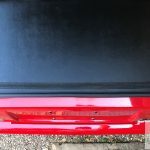 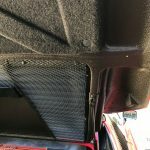 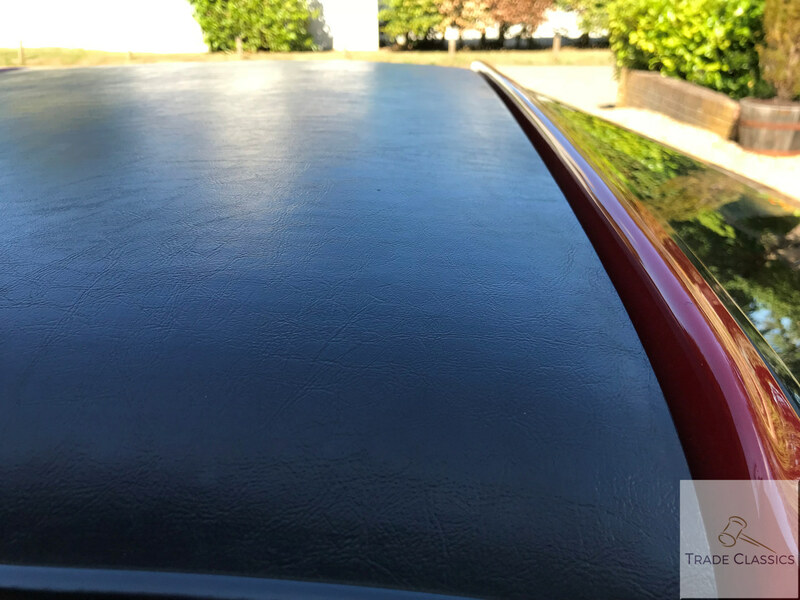 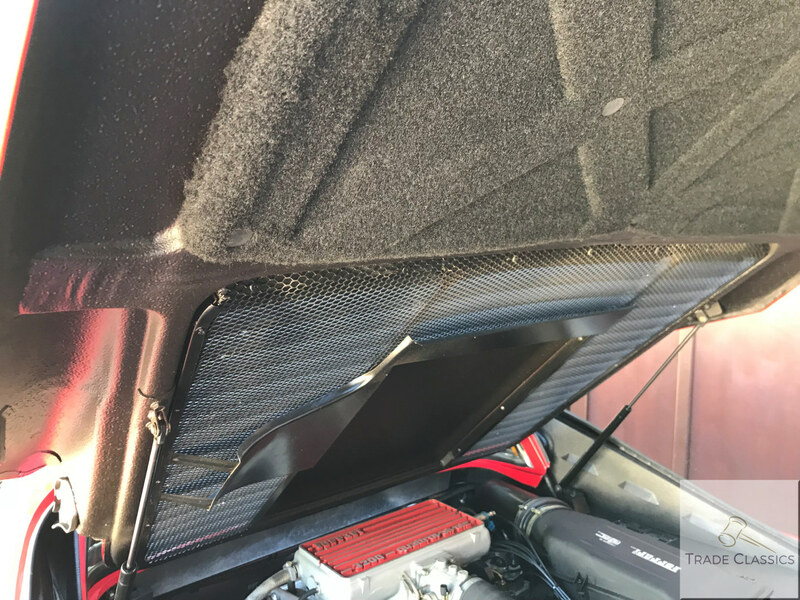 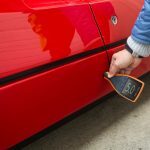 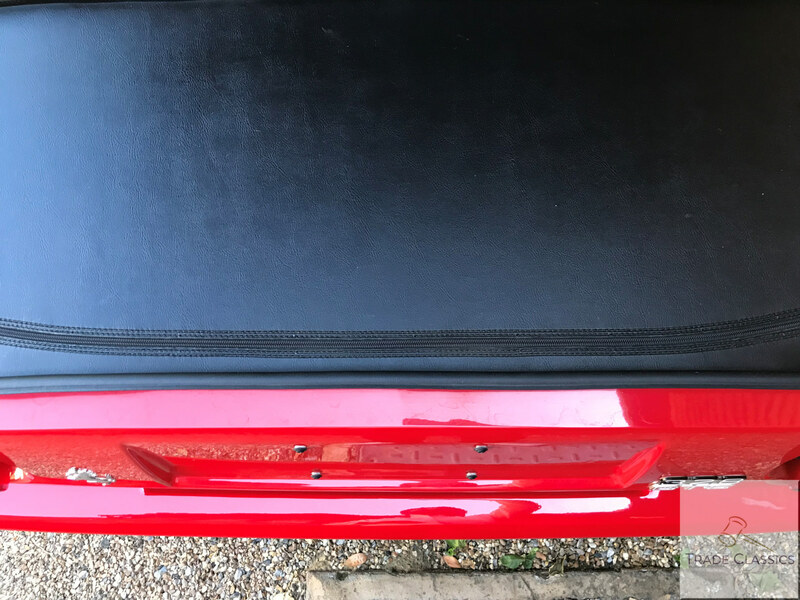 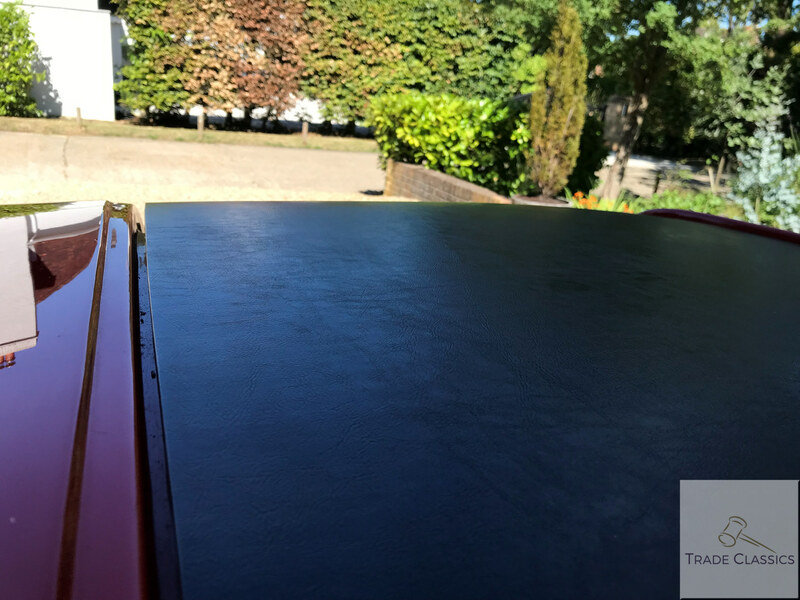 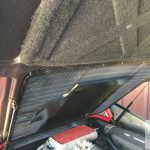 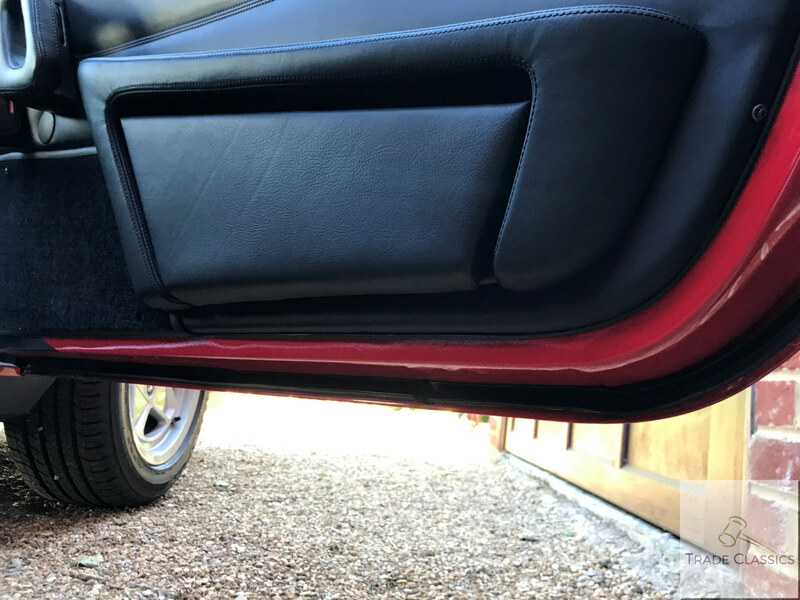 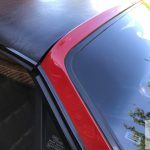 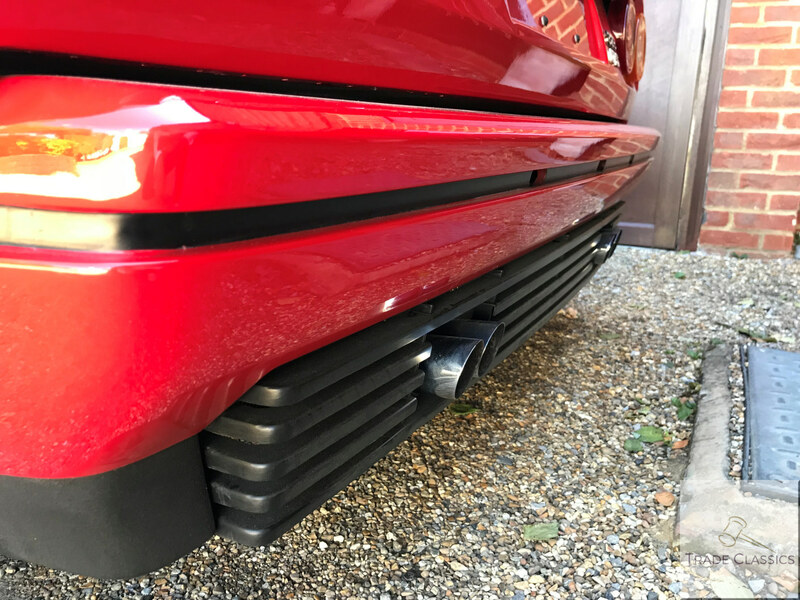 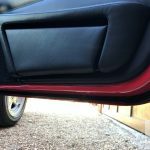 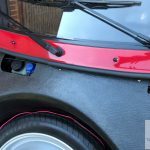 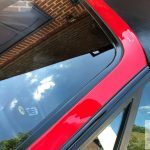 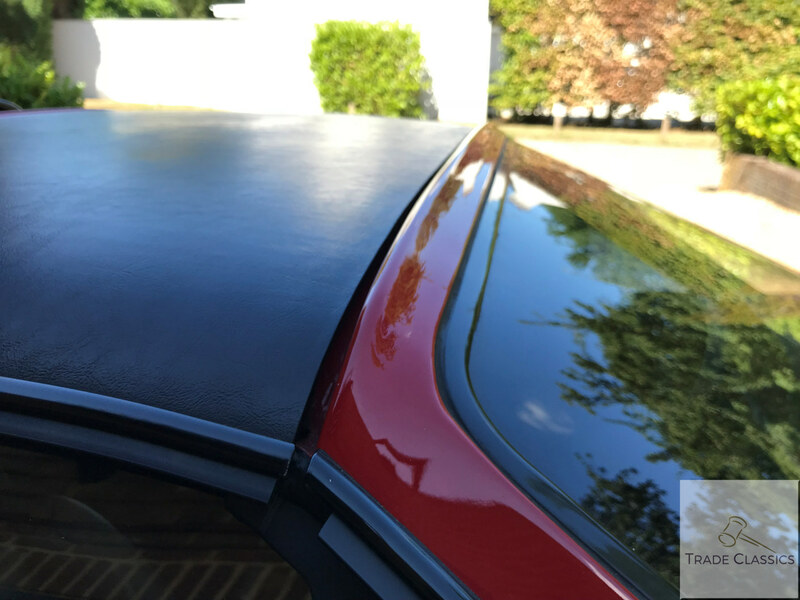 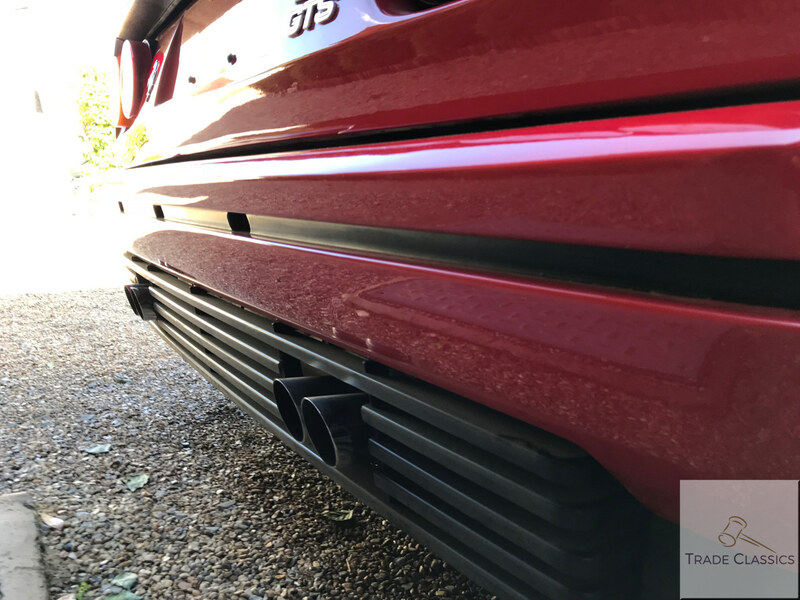 No fading or scratching was observed, the rubber front black splitter as an example has no markings on it at all observed when we saw the car. 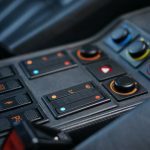 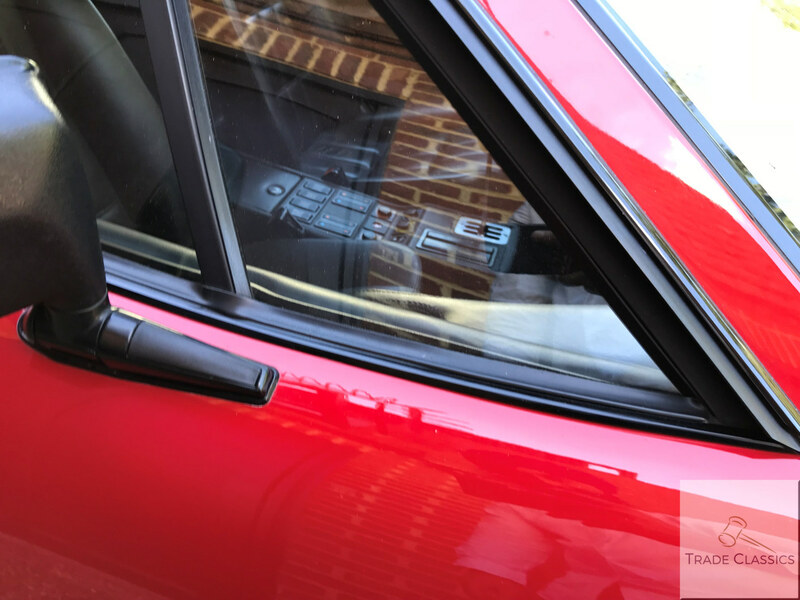 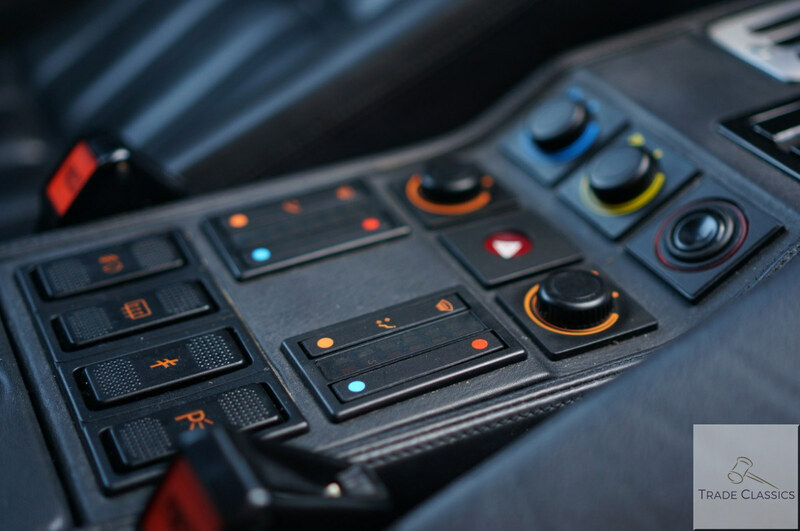 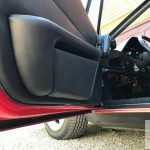 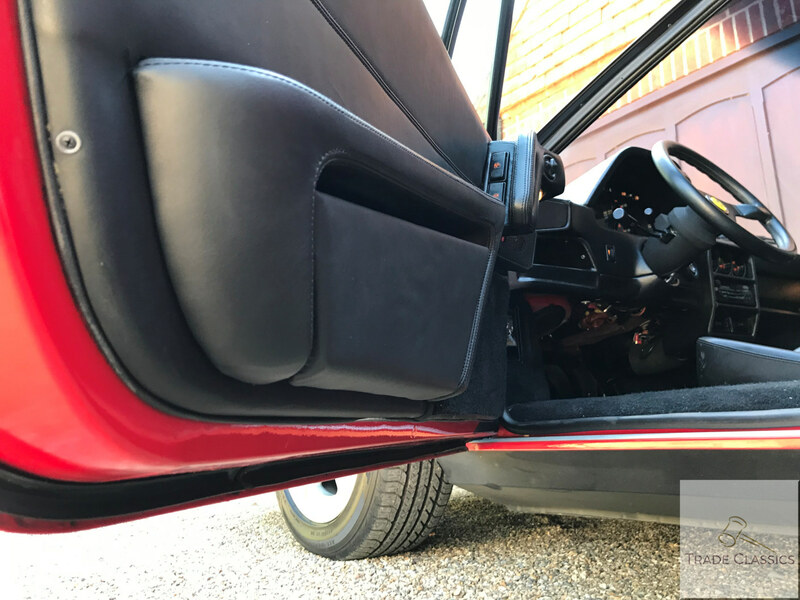 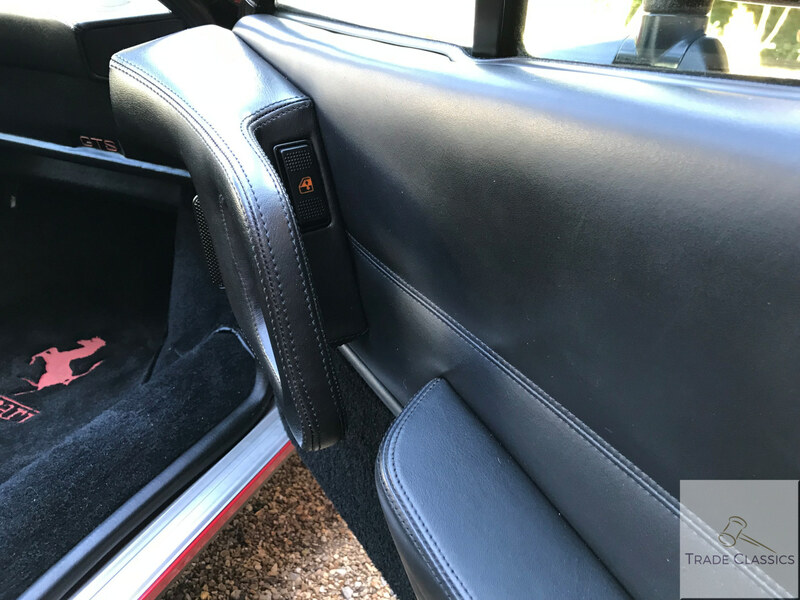 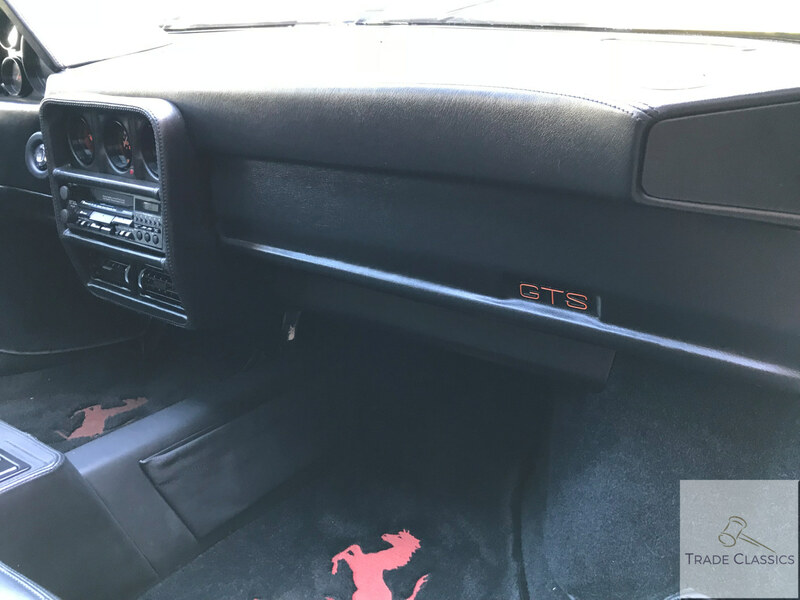 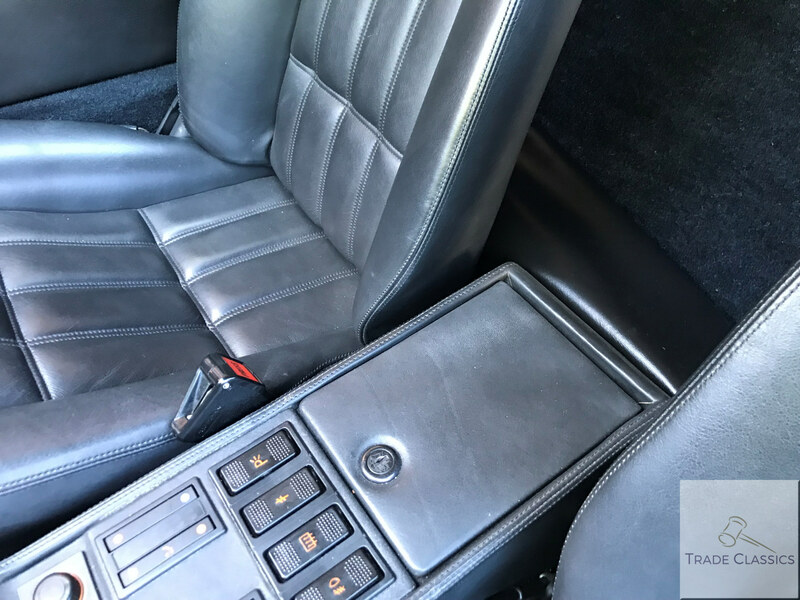 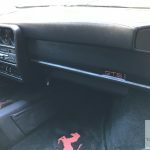 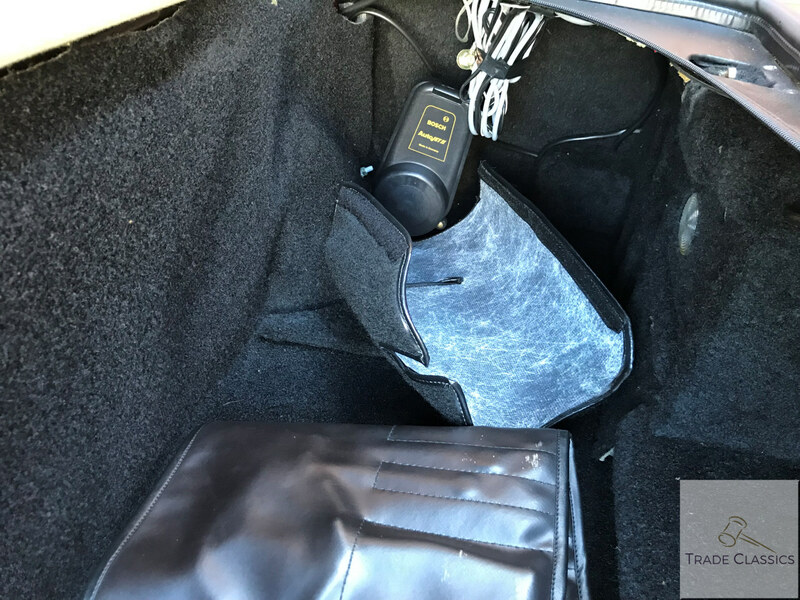 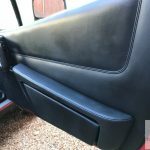 The interior on the 328 GTSi featured some differences and upgrades from the 308 including new modern switch gear and new style door cards. 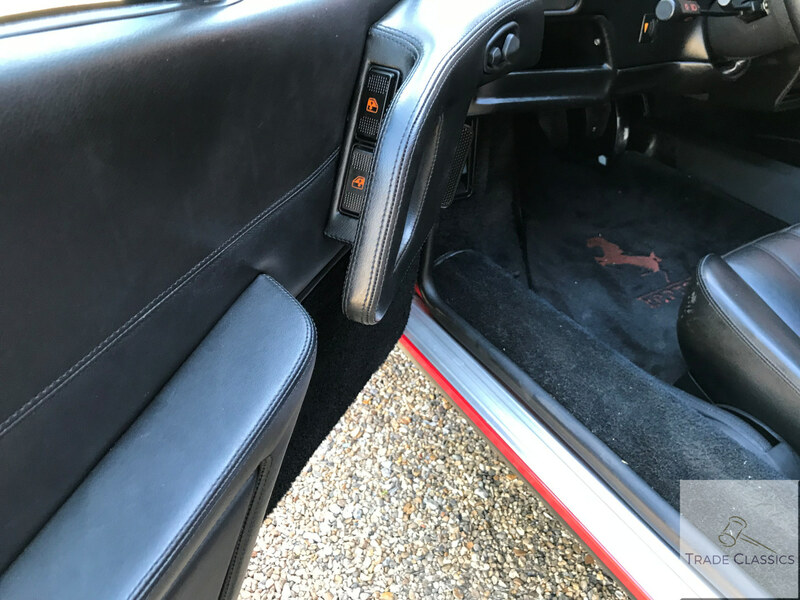 This example has an almost perfect interior, as described below. 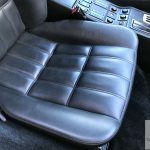 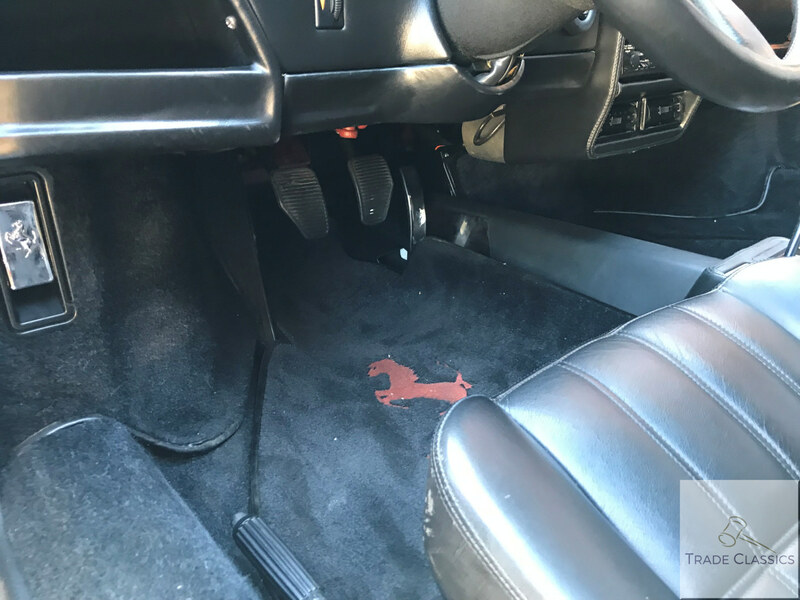 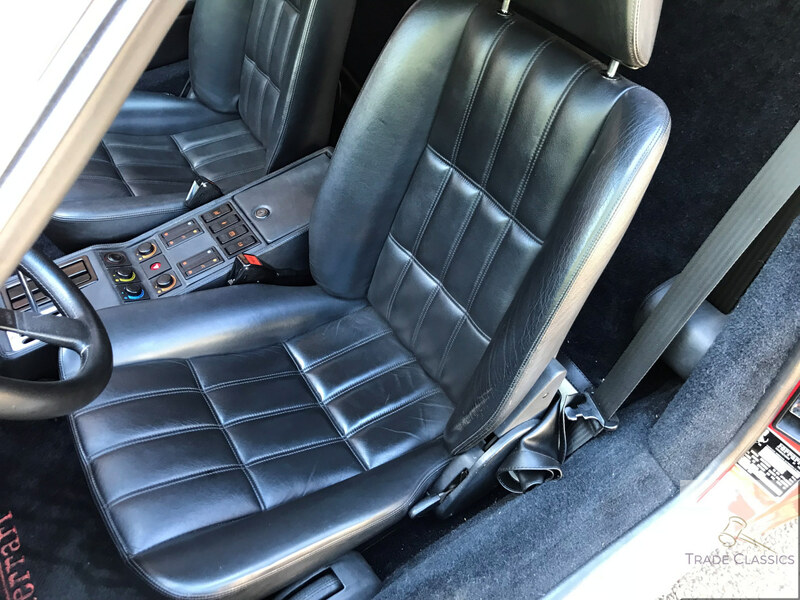 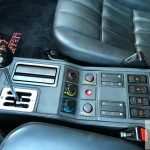 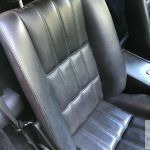 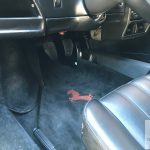 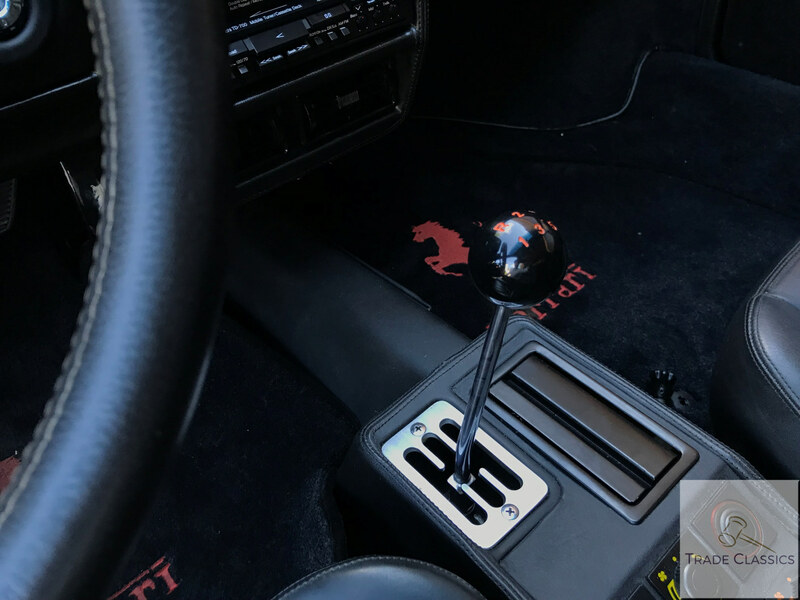 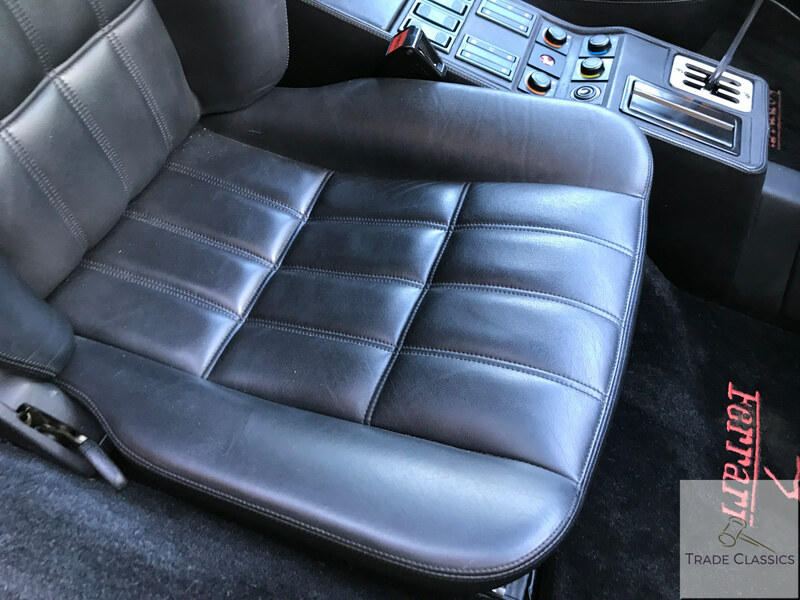 Finished in black leather and black carpeting, the interior again is in almost time-warp condition. 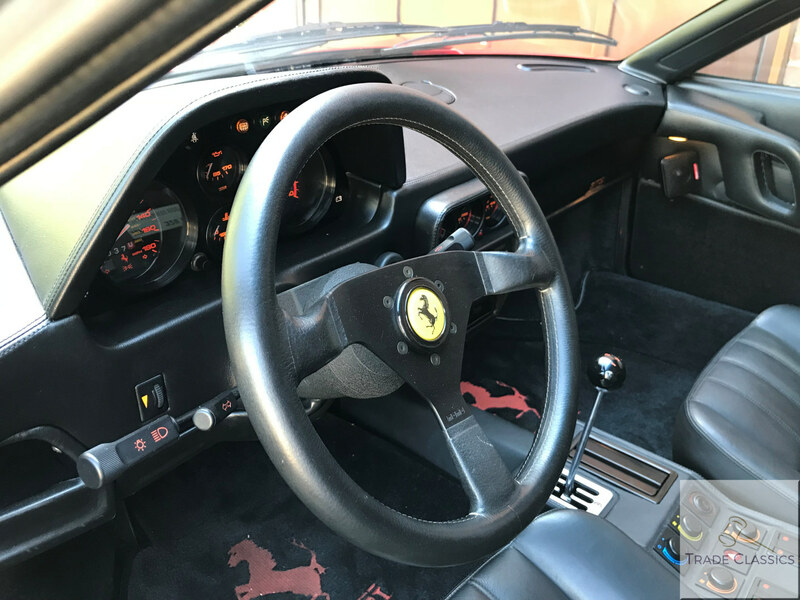 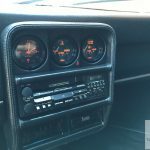 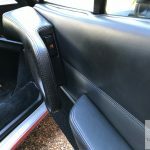 You’ll see from the video that the interior looks stunning, dark and deep black throughout, there is very little to report back on as you would expect given the mileage. 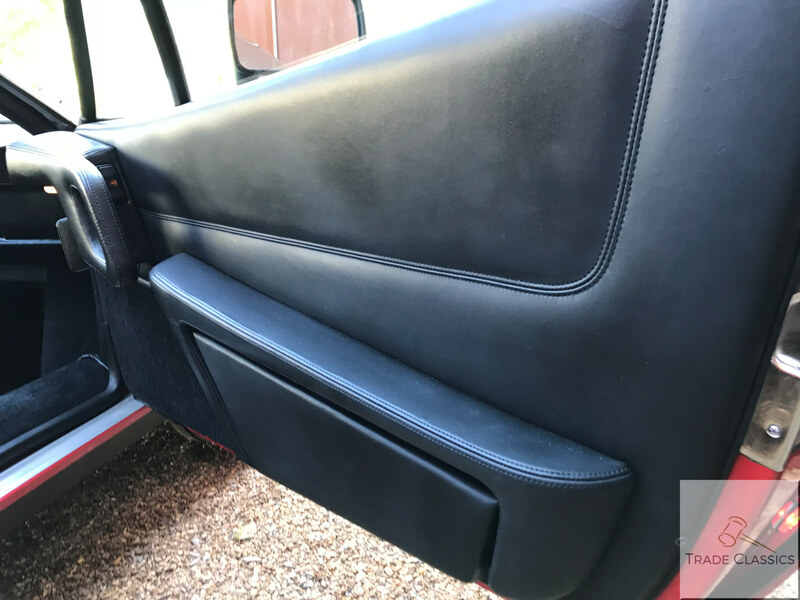 There is some very slight wear on the drivers left back bolster, nothing that a bit of leather treatment can’t resolve. 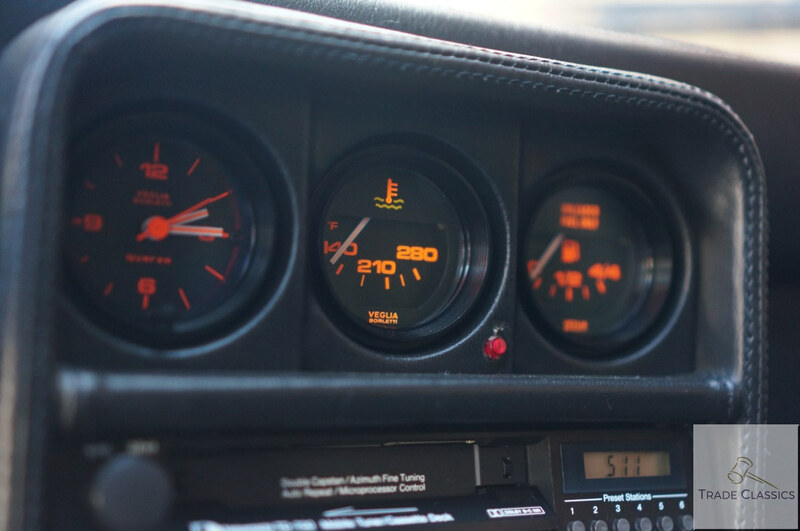 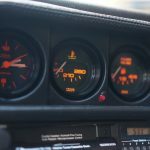 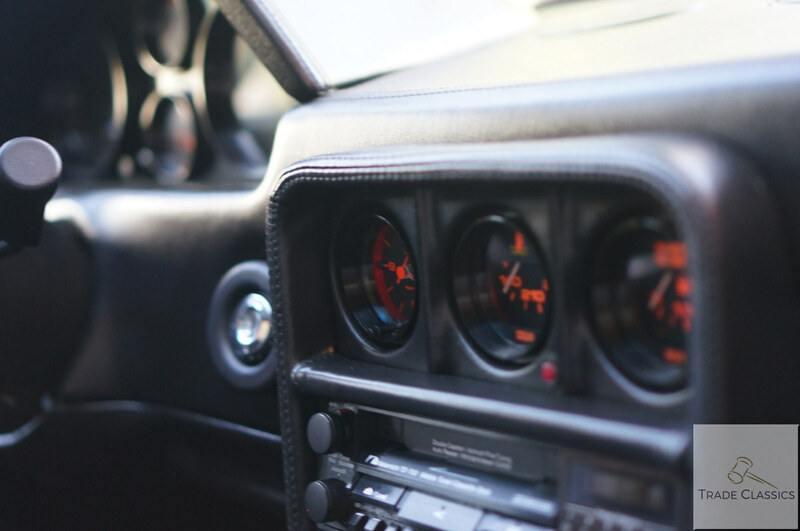 All of the gauges work as they should, on this very striking and driver focused dash. 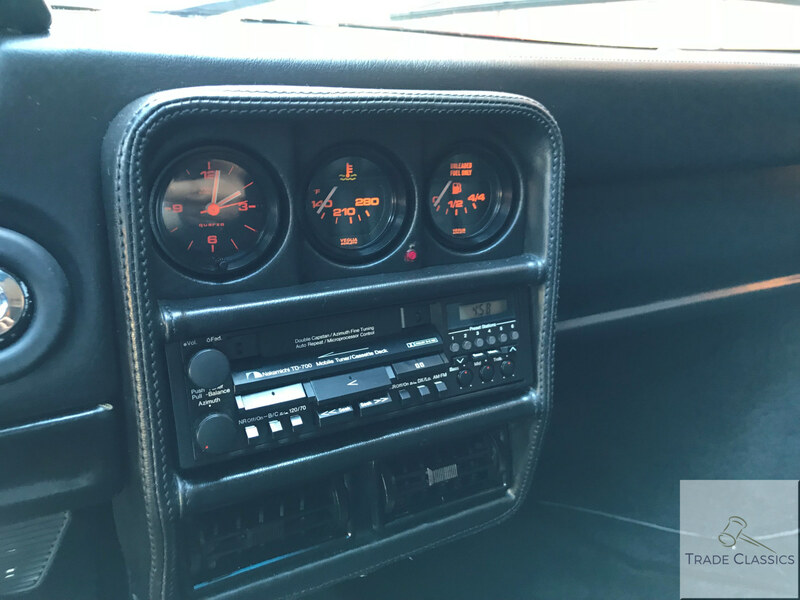 The rest of the dash is also in time-warp condition, no markings or issues. 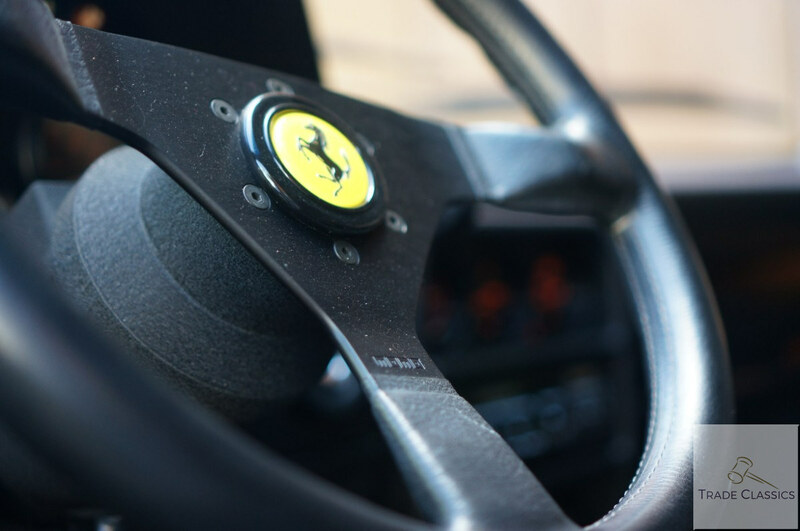 The Momo steering wheel and gear stick are in very good condition. 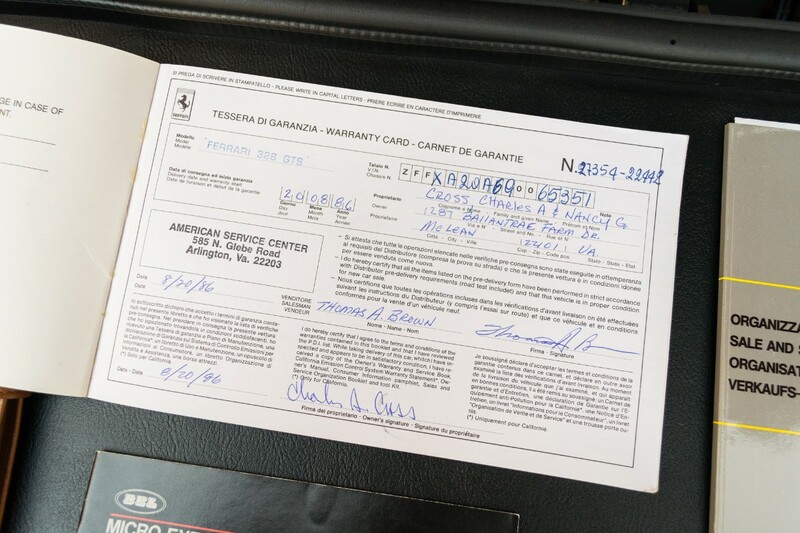 No markings observed. 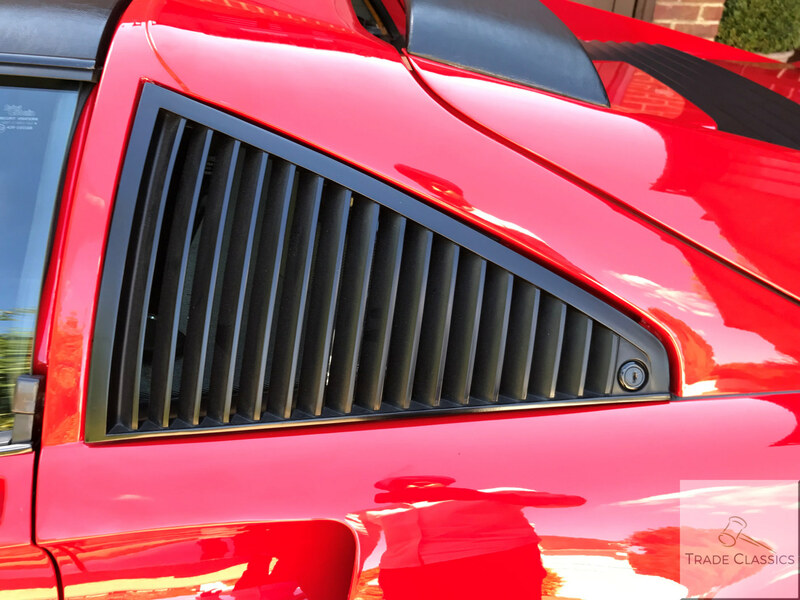 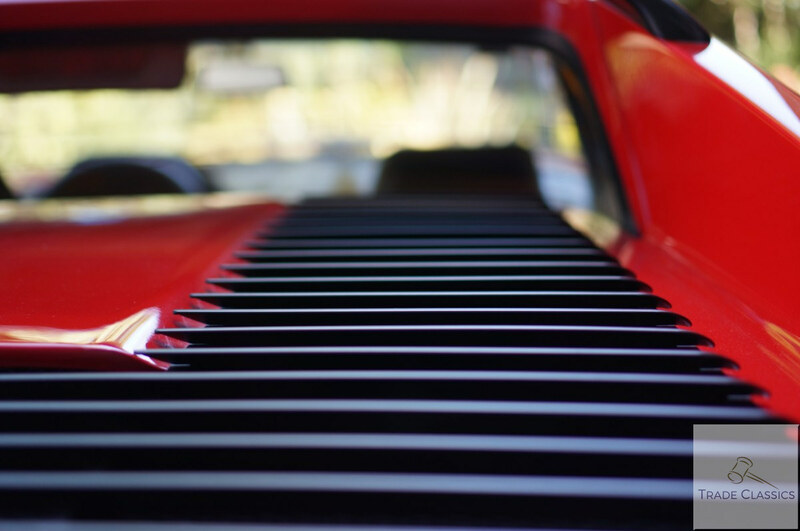 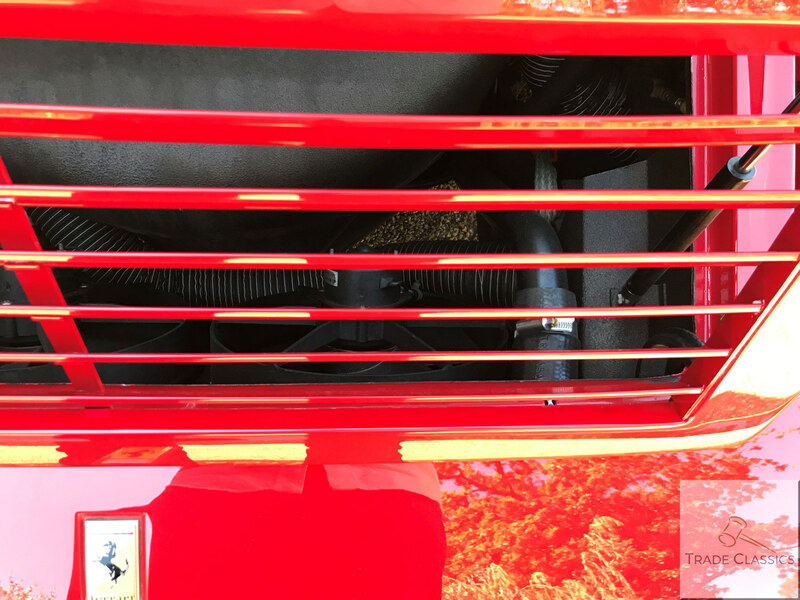 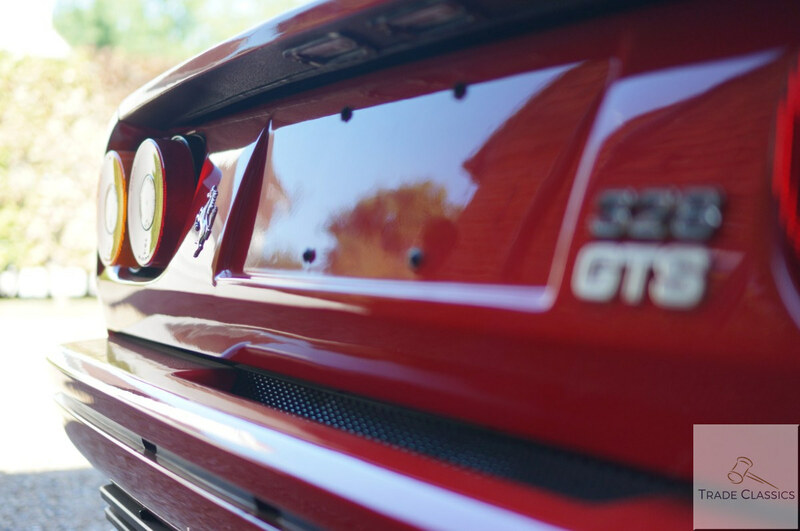 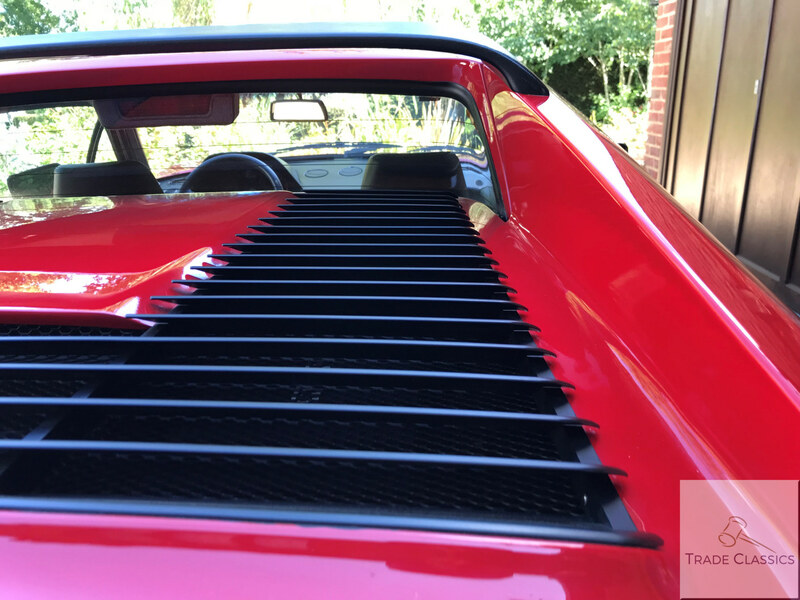 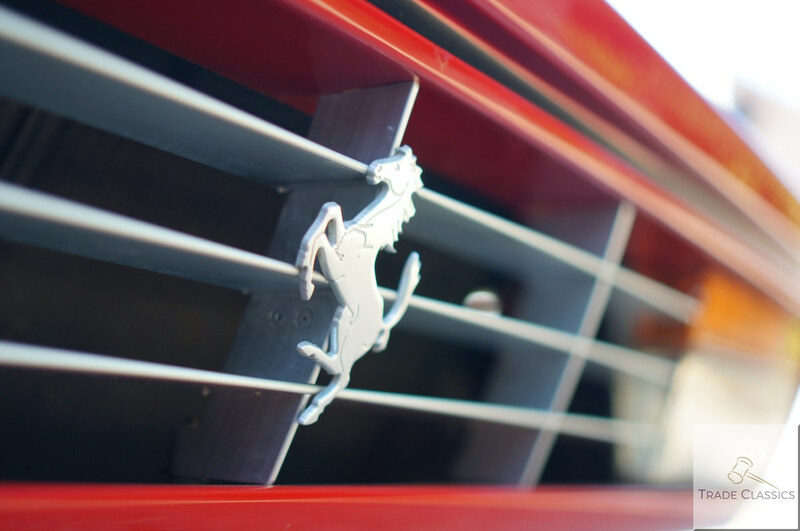 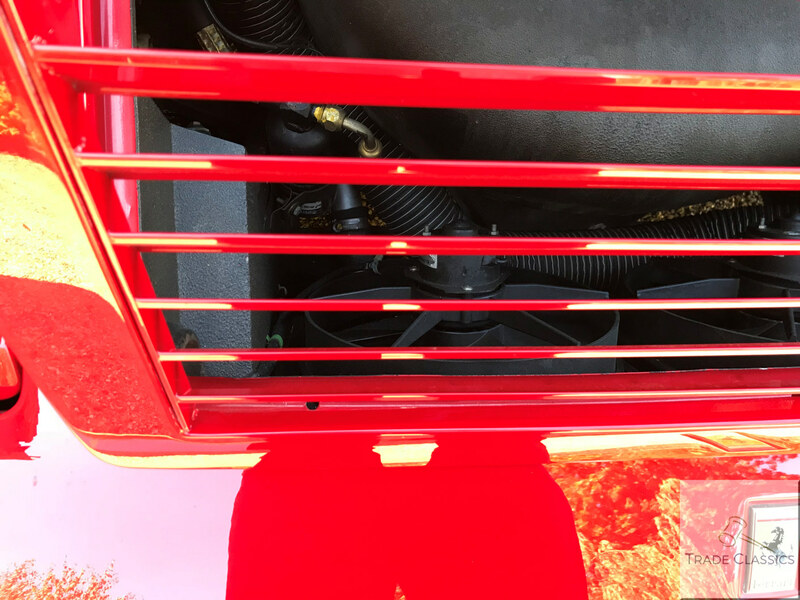 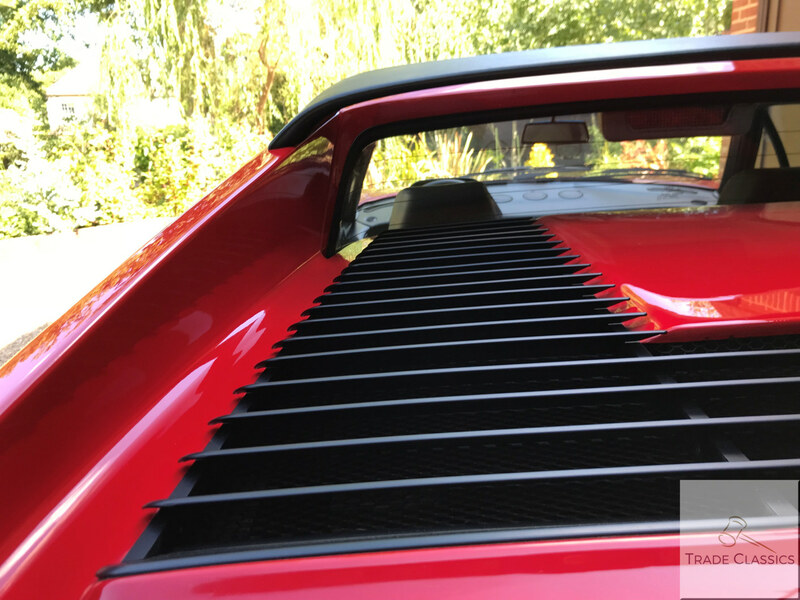 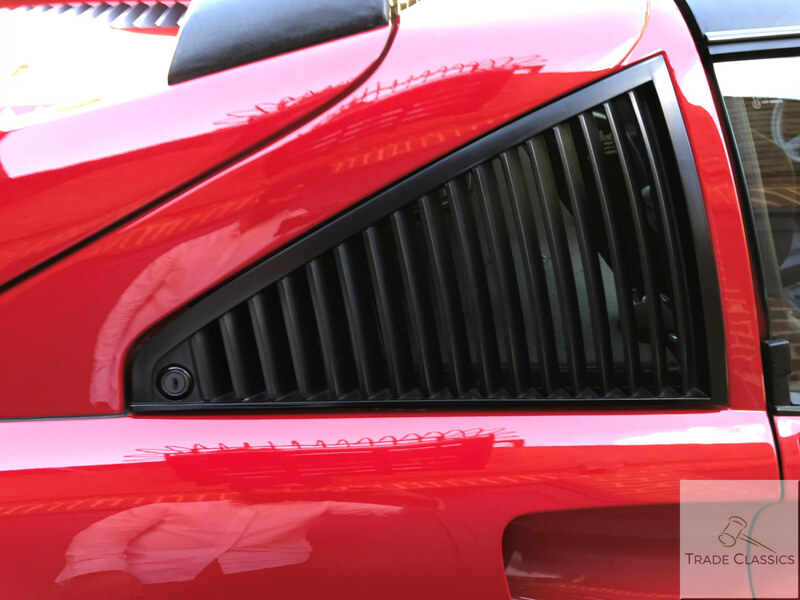 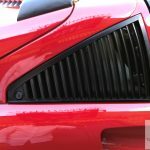 The steel gated gear surround shining bright and unblemished too, iconic with Ferraris of the era. 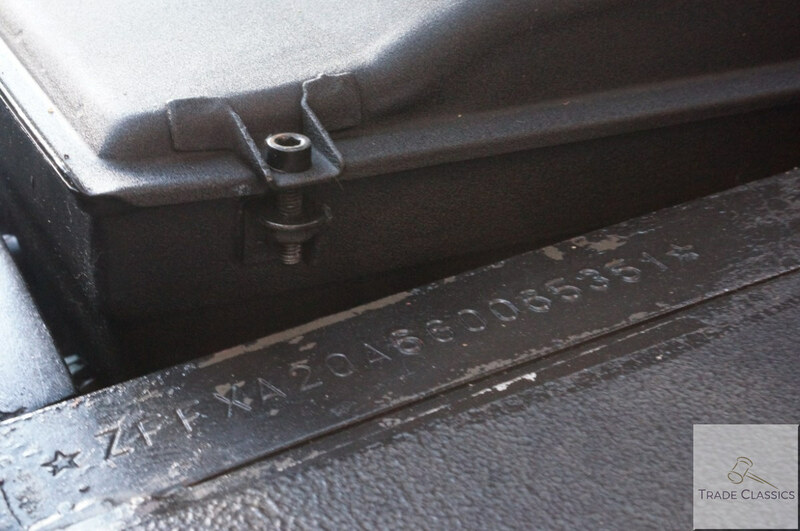 As the car hasn’t been registered in the UK yet, we did not take the car on our usual run. 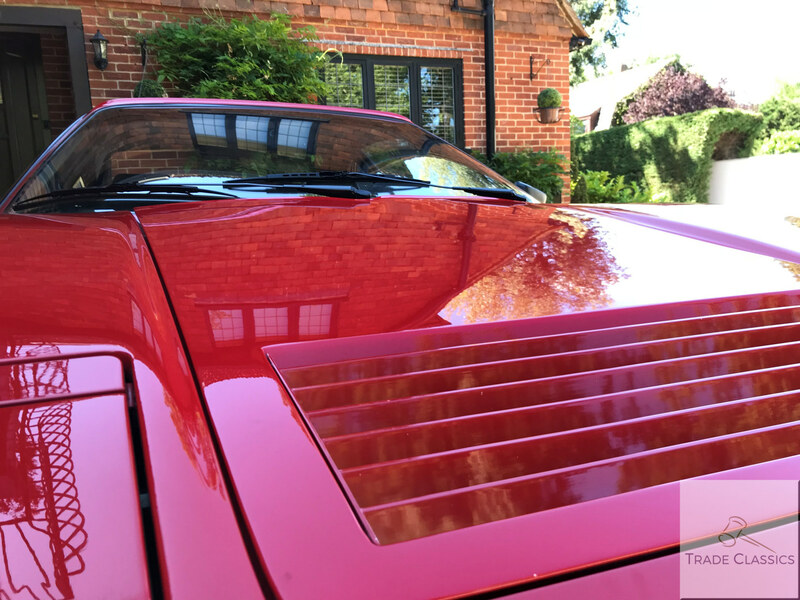 We did however do our normal cold start video, and have some detail from the owner Gary. 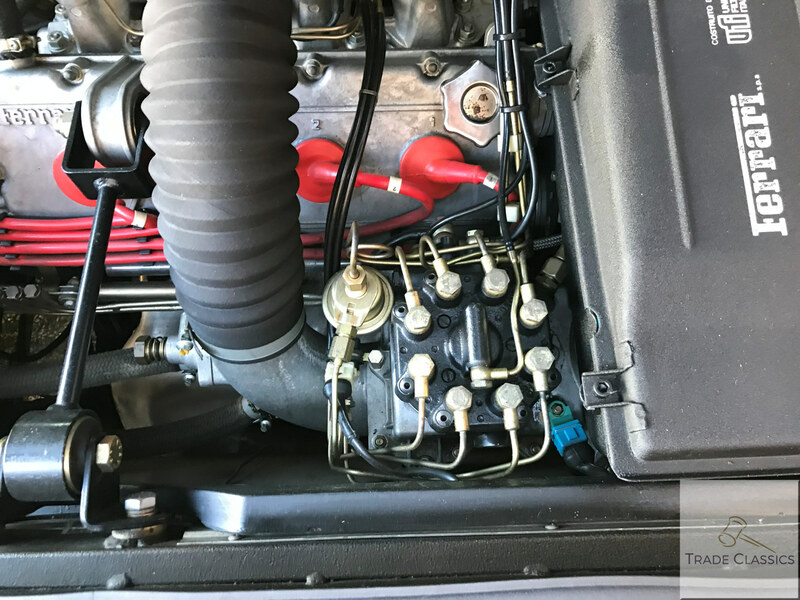 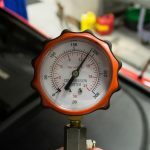 The engine started strongly from cold, as can be observed in our video, with no blue smoke issues and it idled smoothly from cold. 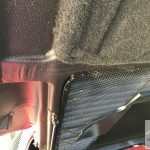 Gary tells us that the car goes through the gears with no issues. 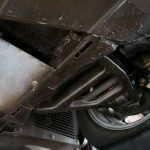 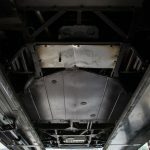 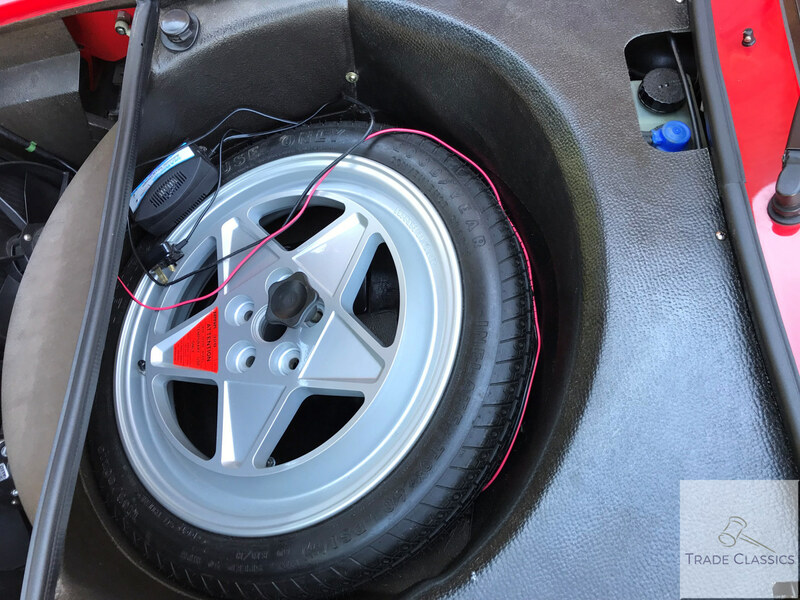 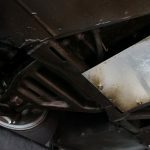 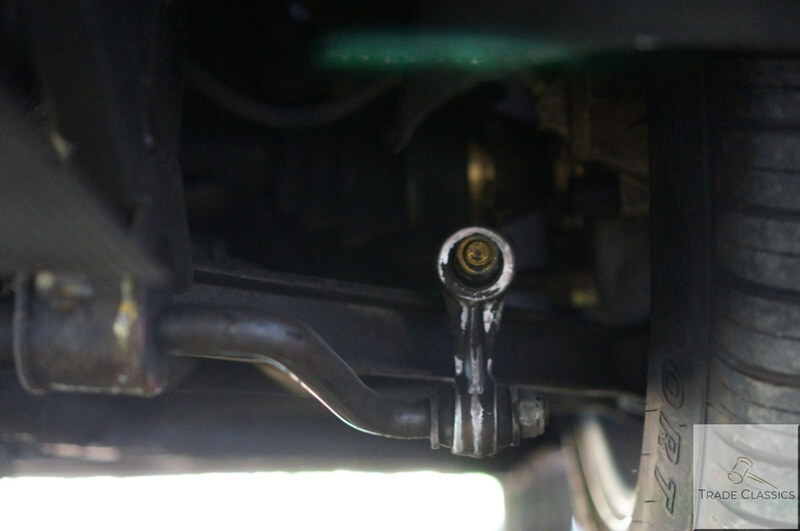 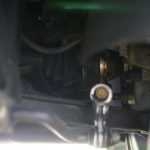 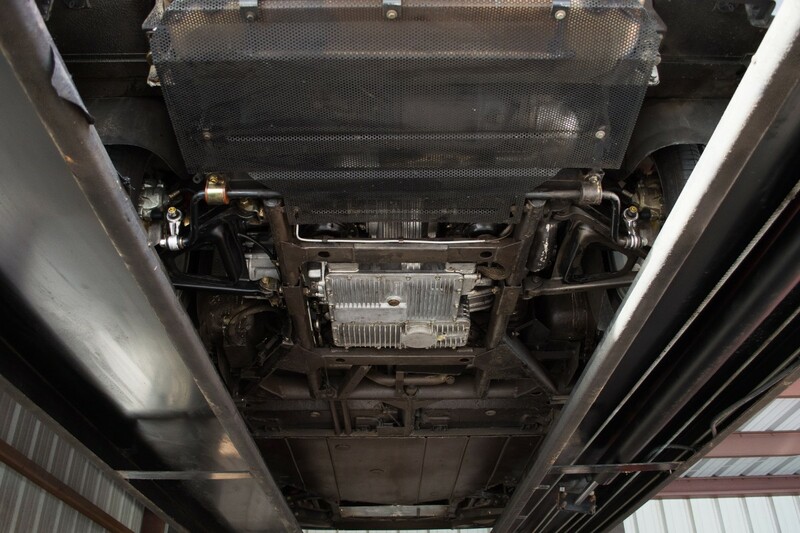 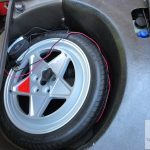 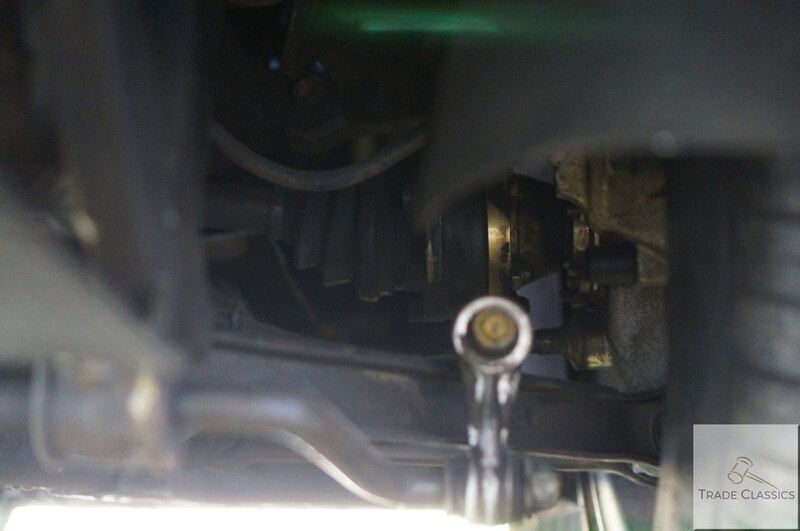 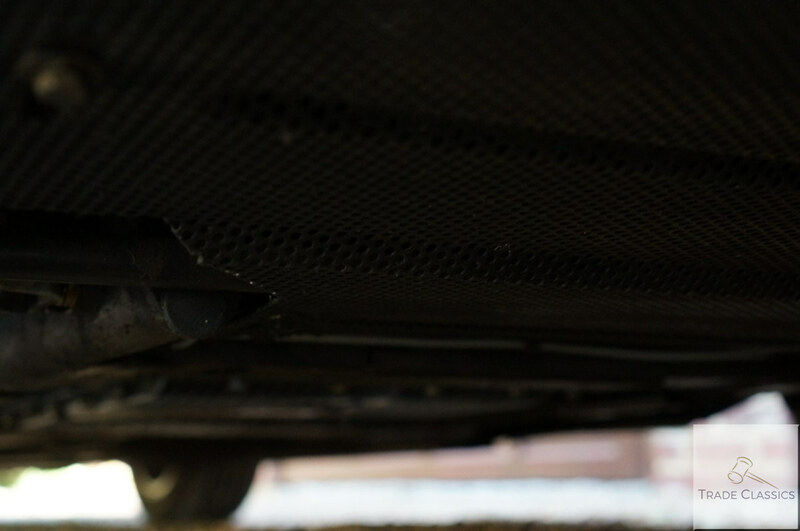 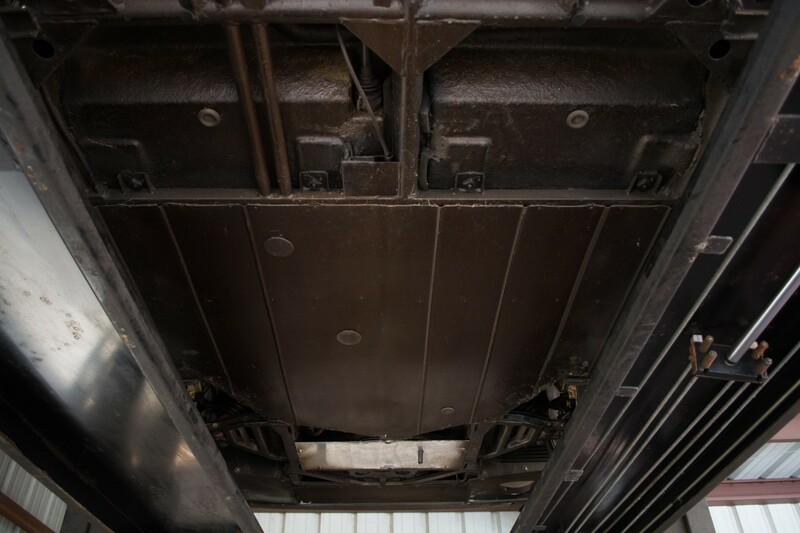 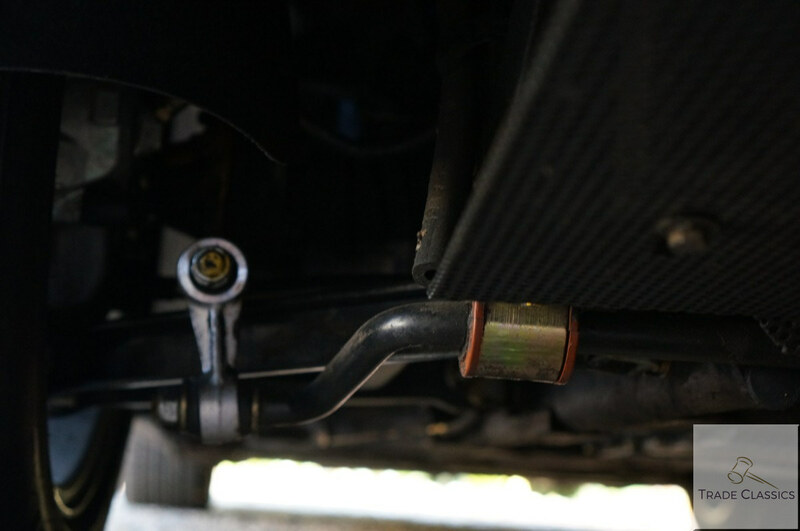 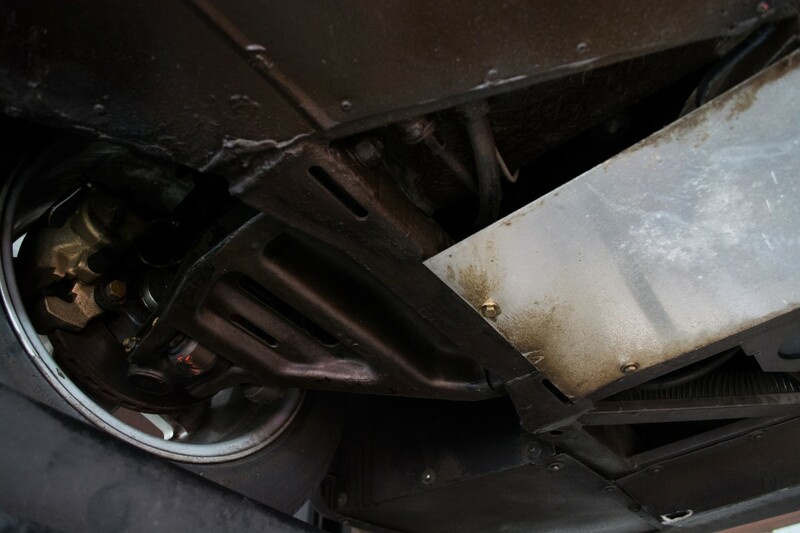 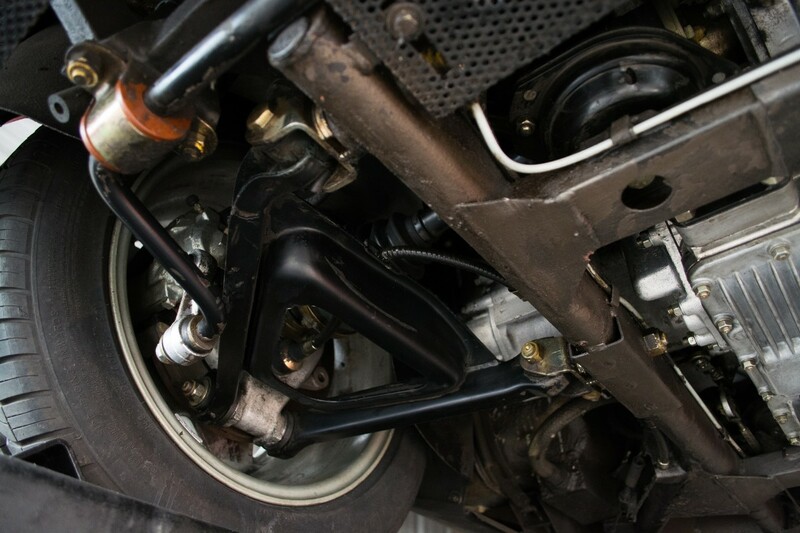 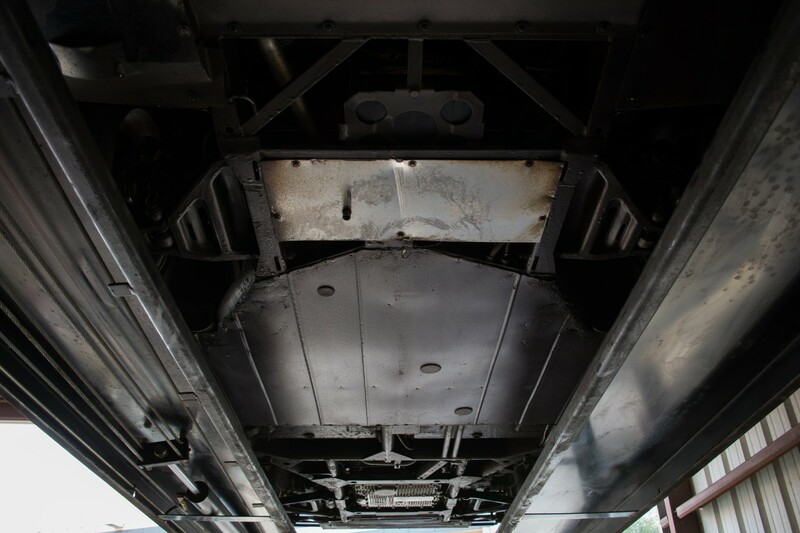 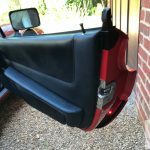 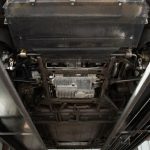 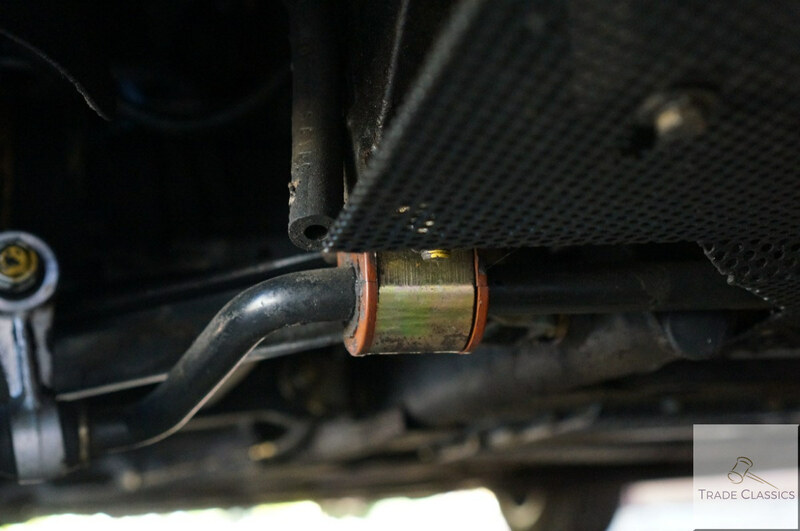 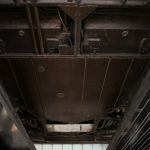 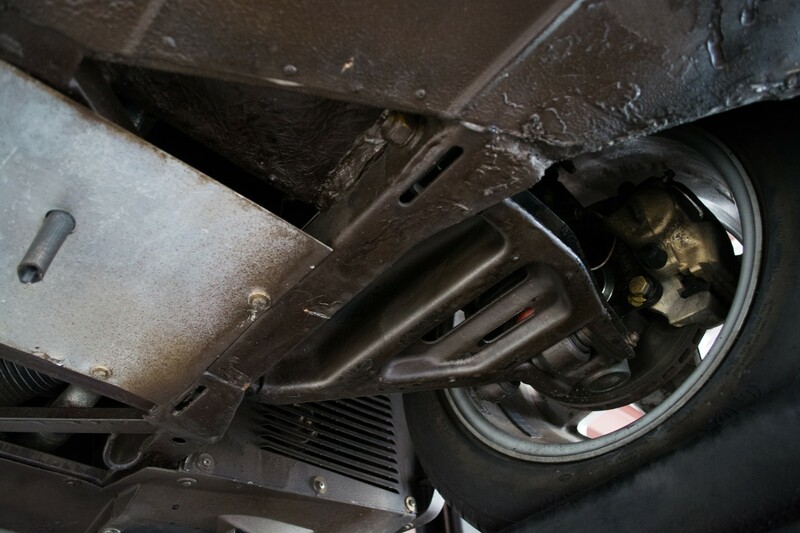 You can see from the pictures of the underside of the car, the suspension looks in great condition, the bushings for the various parts clearly visible. 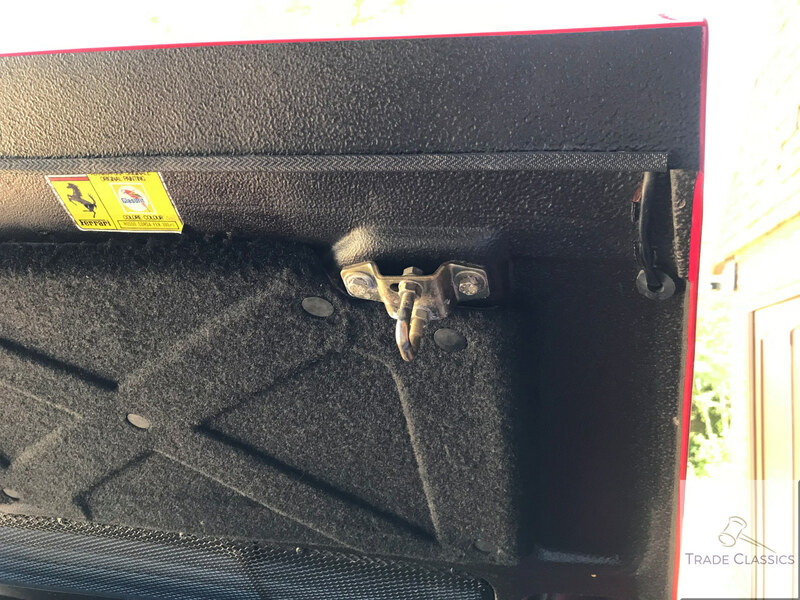 Gary informs us that the car drives without fault. 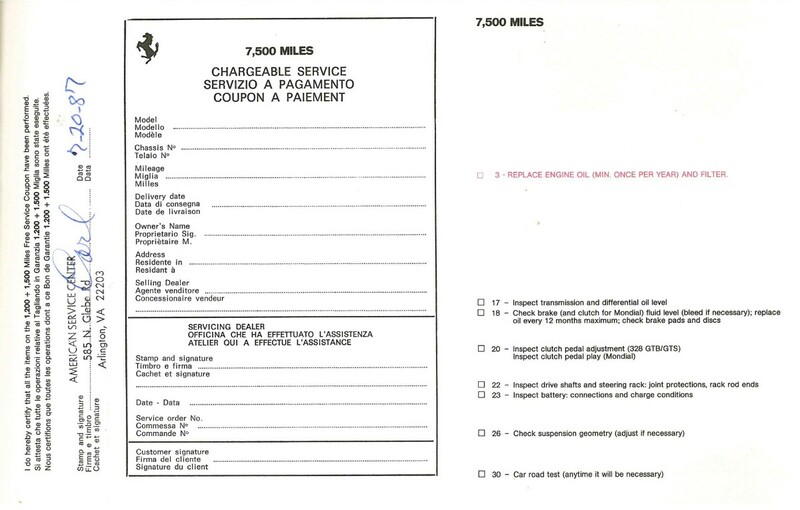 The car comes with its delivery stamps in the service book. 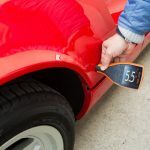 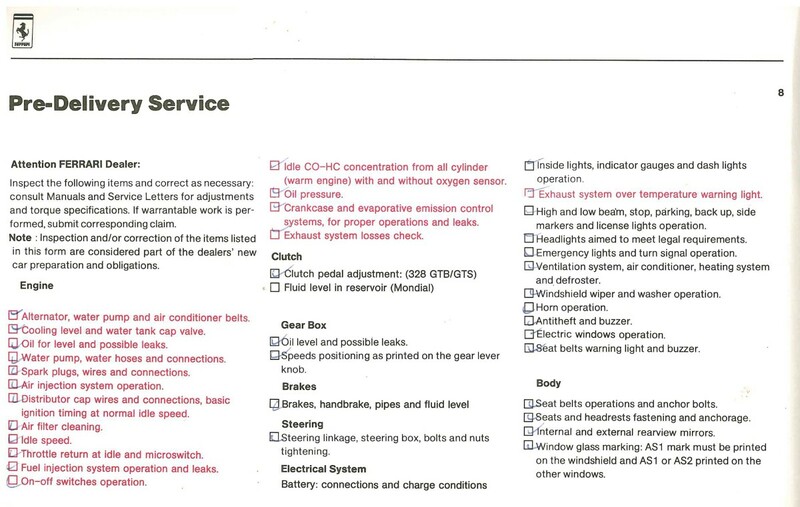 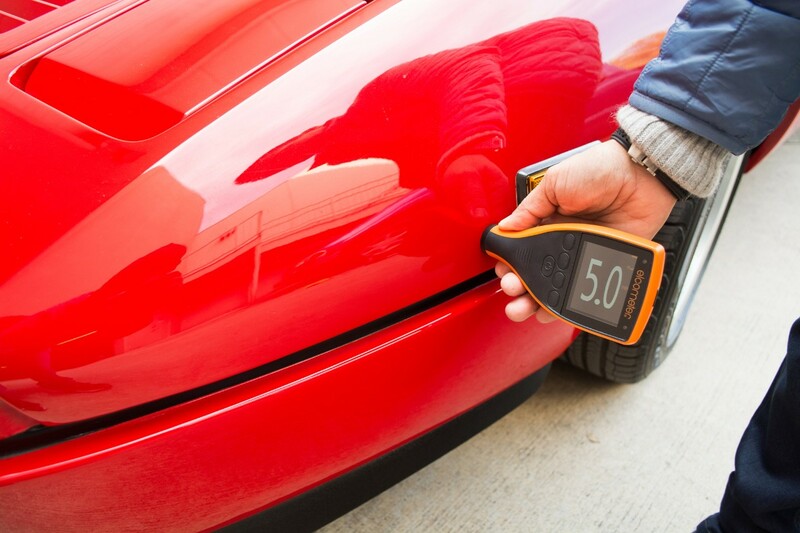 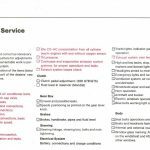 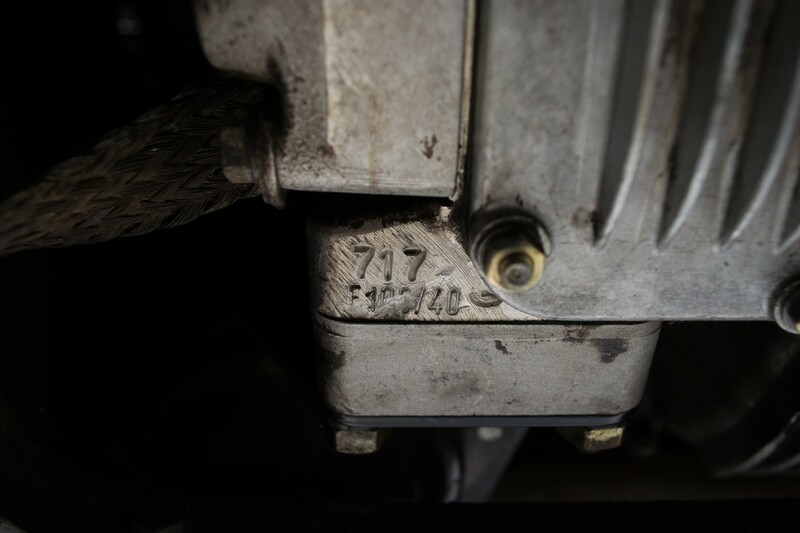 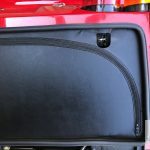 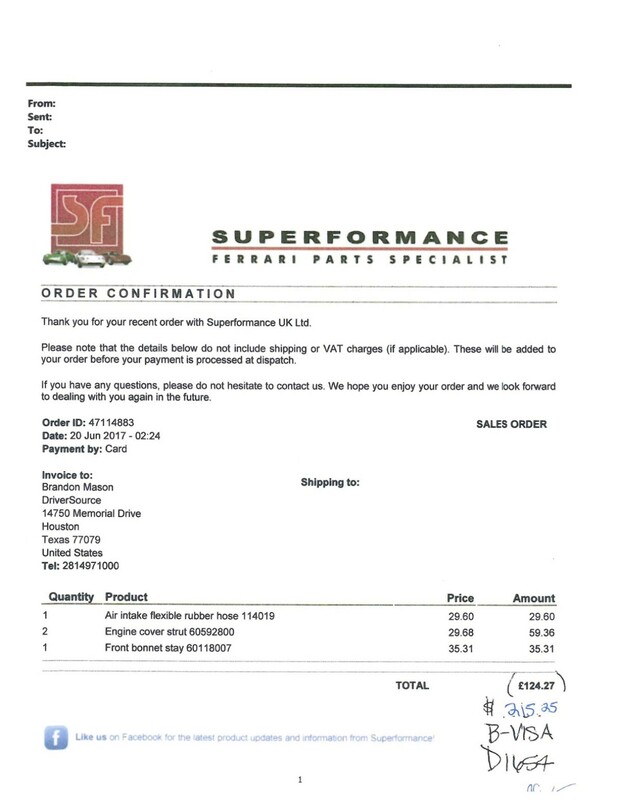 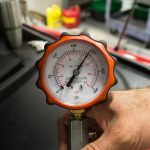 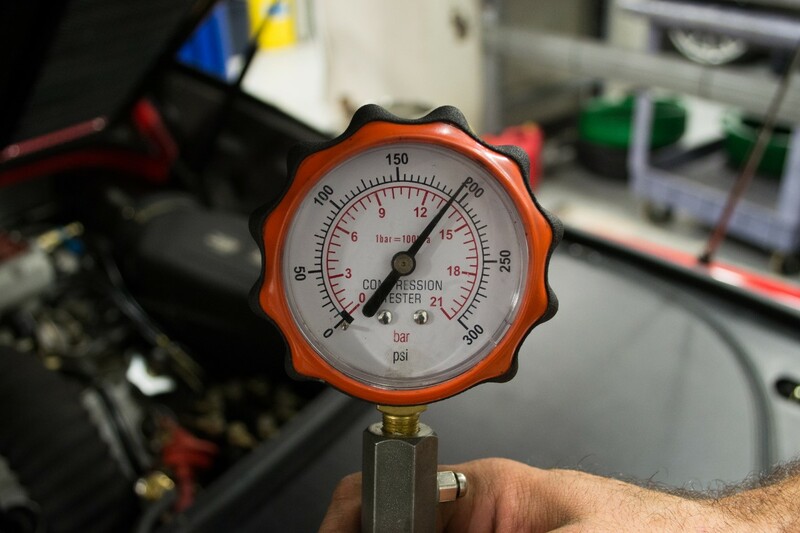 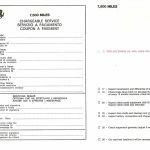 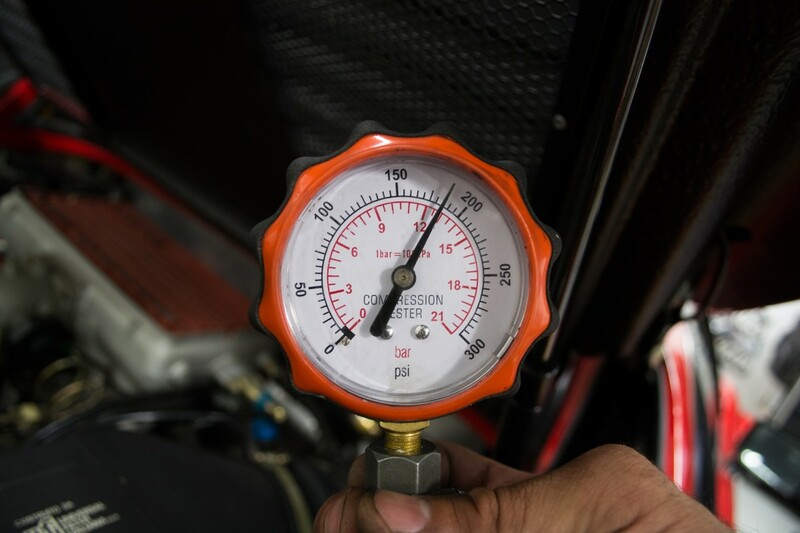 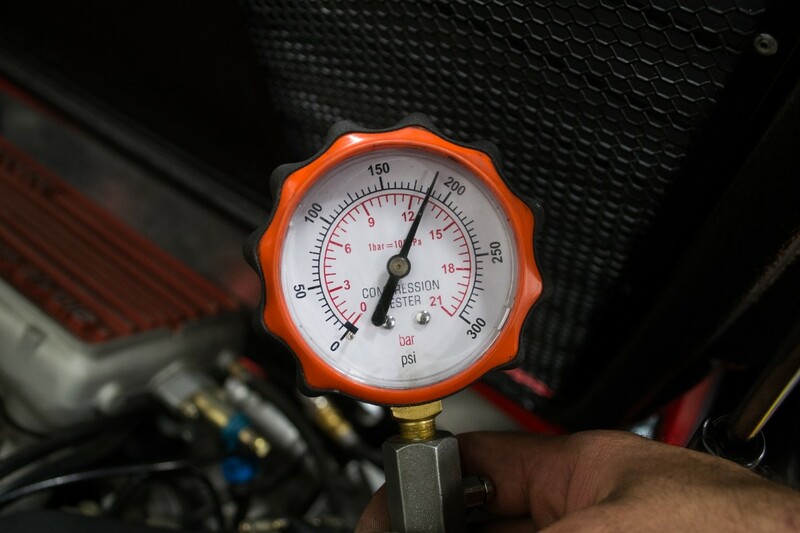 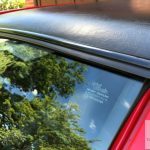 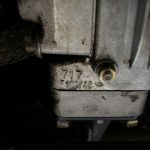 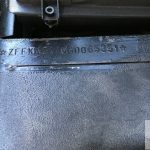 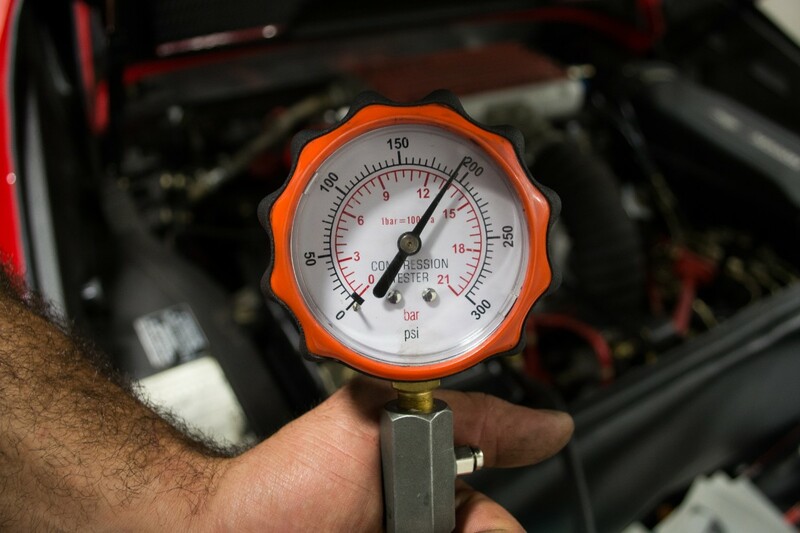 In terms of work completed on the car, in 2016 there was a major belt service and can be observed in the history documents the car comes with. 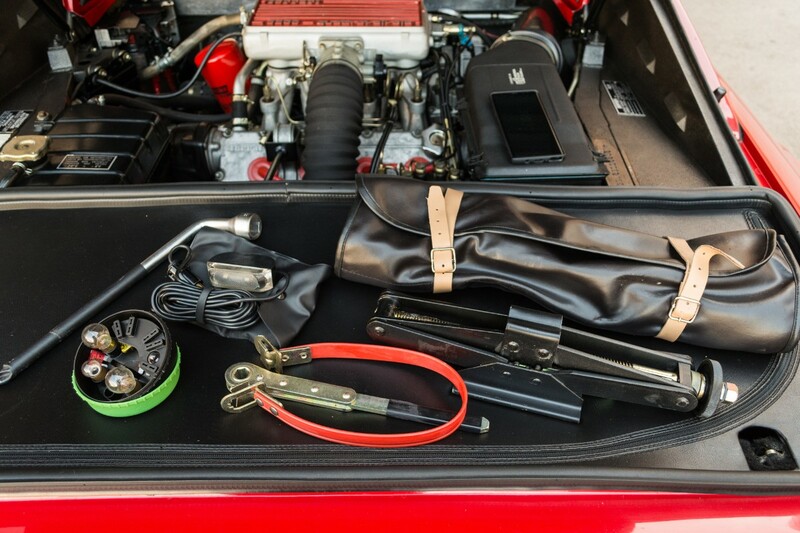 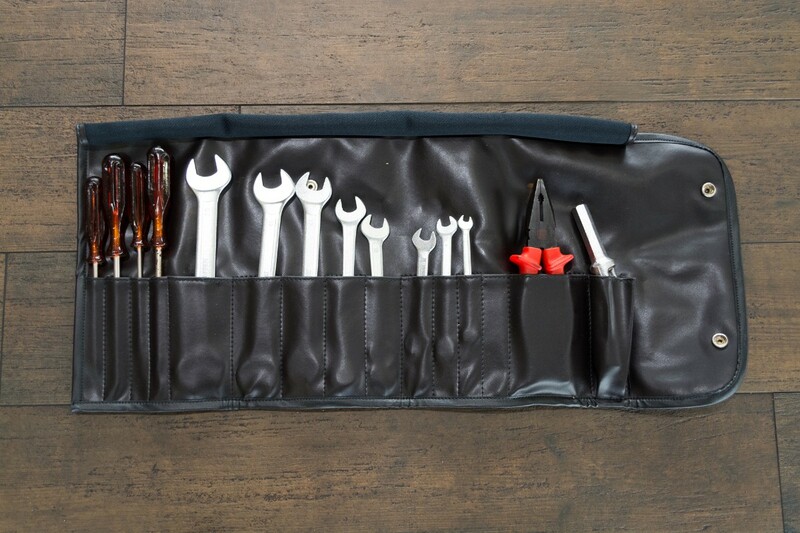 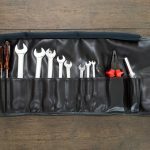 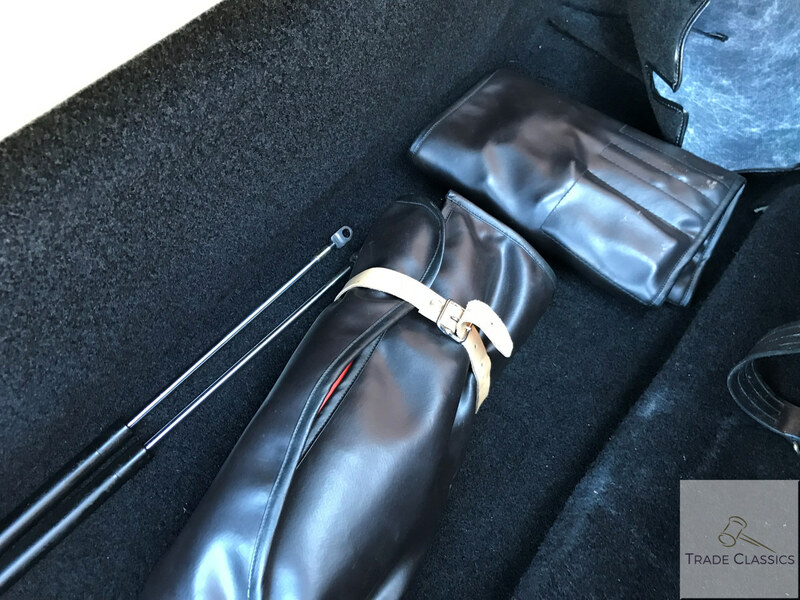 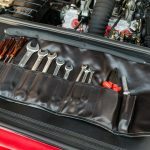 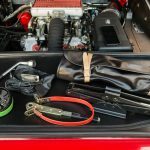 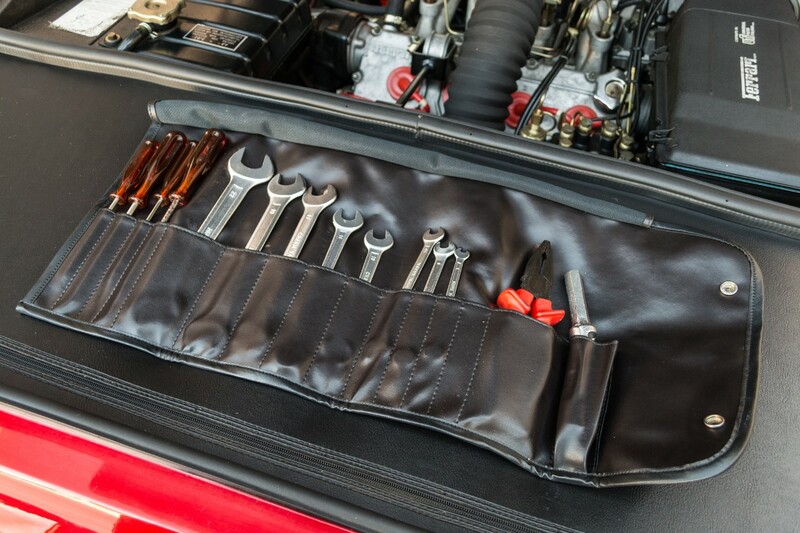 The car comes with a fitted cover, the original service book and manuals, and the original tool kits as pictured. 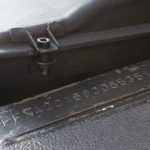 – N/A – The car has not been registered in the UK yet. 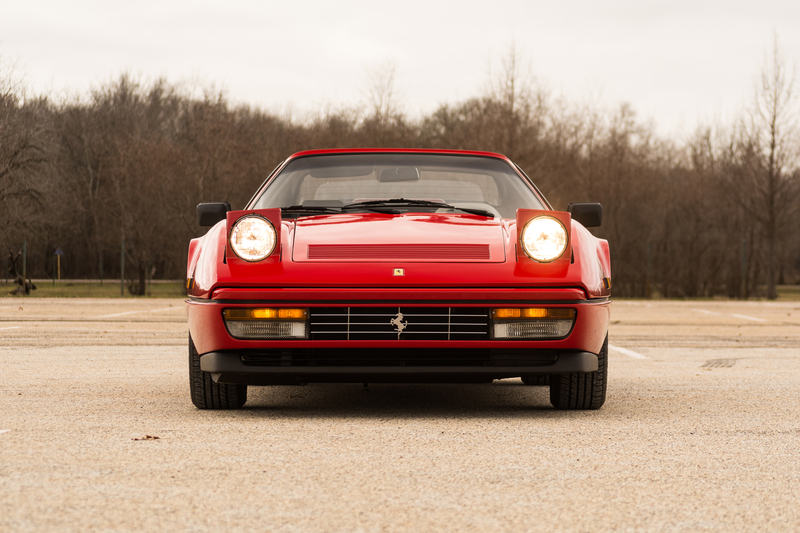 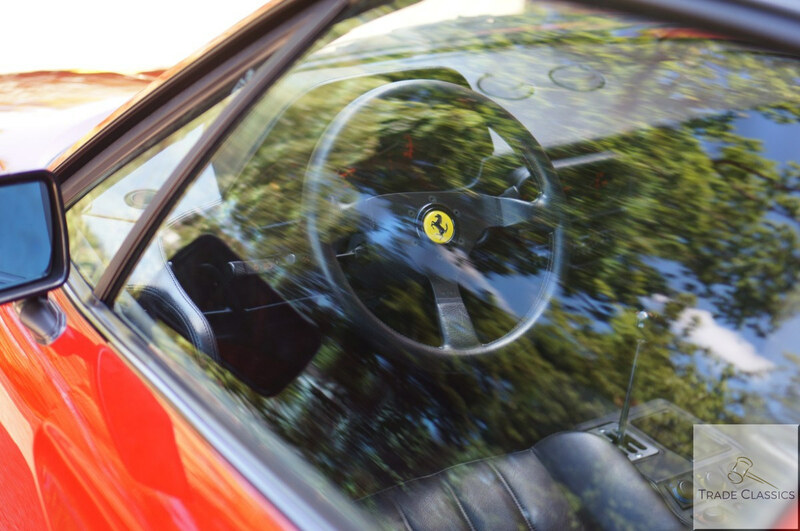 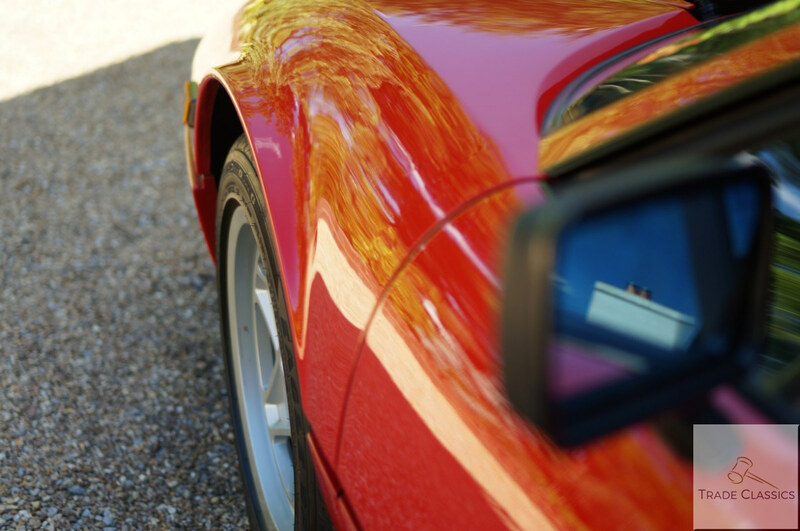 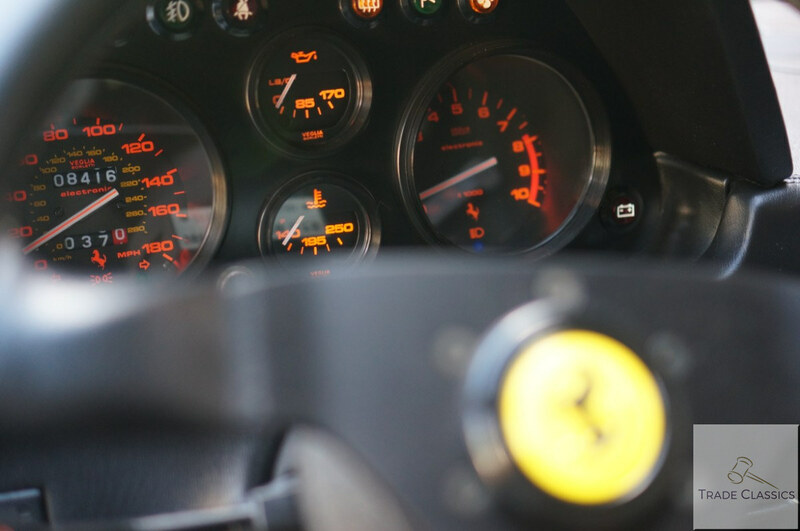 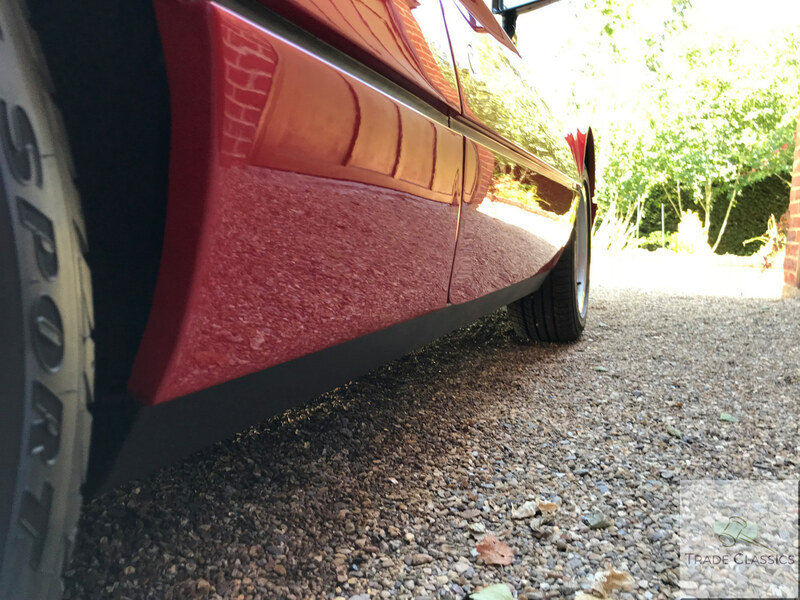 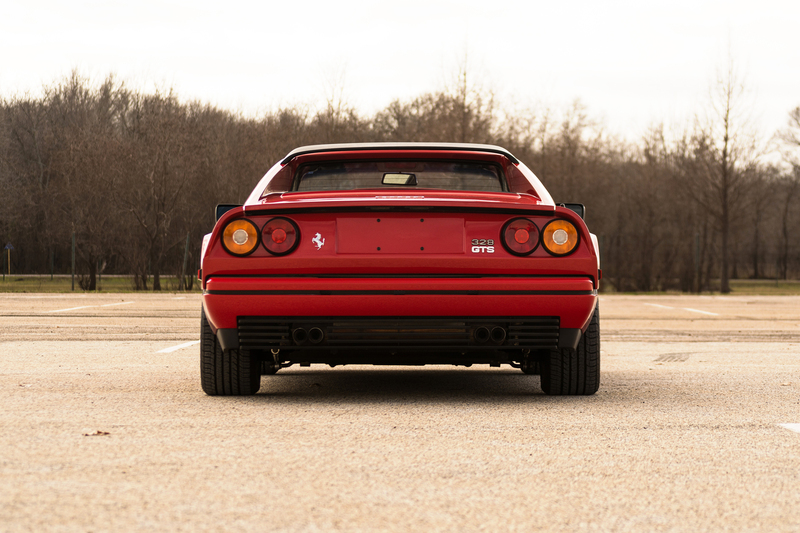 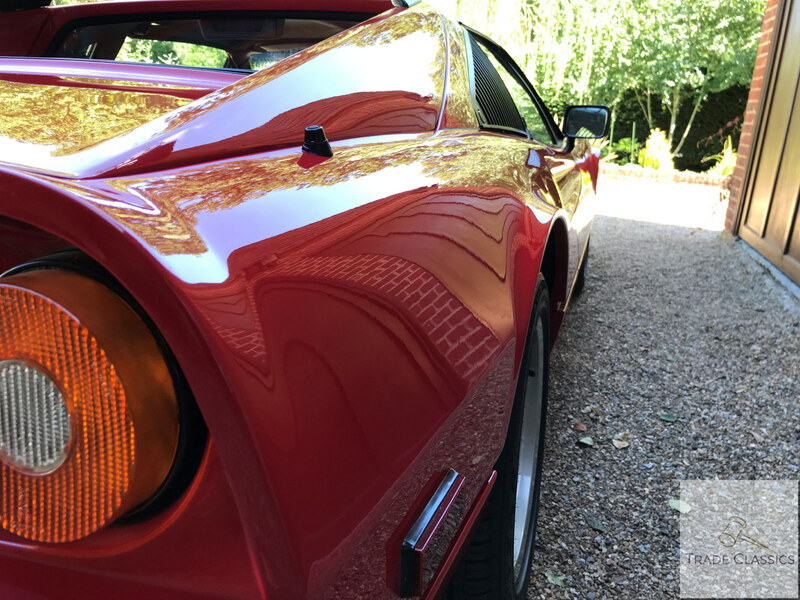 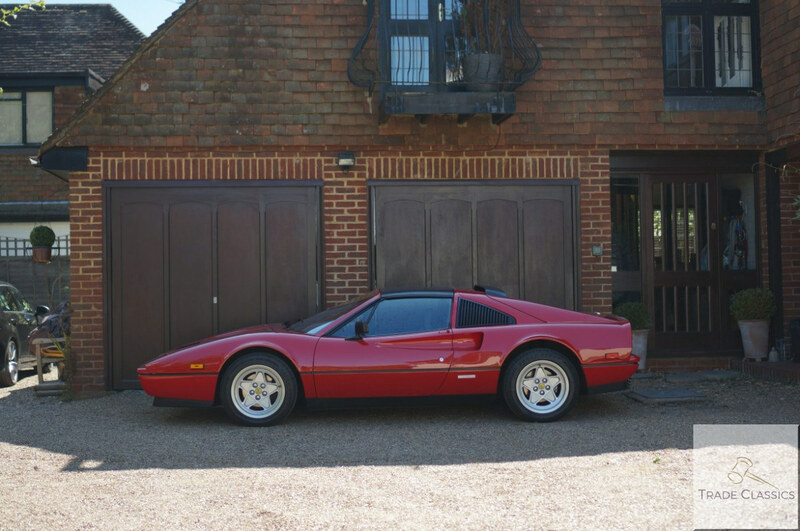 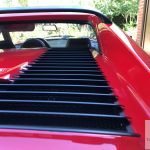 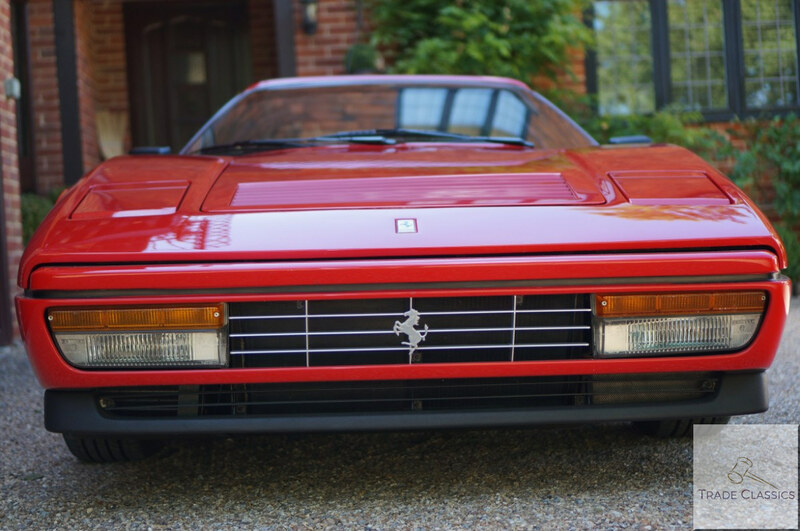 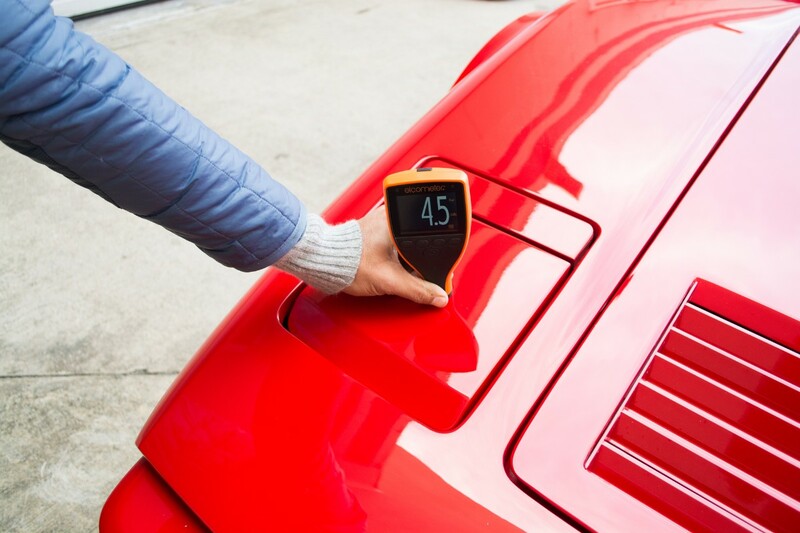 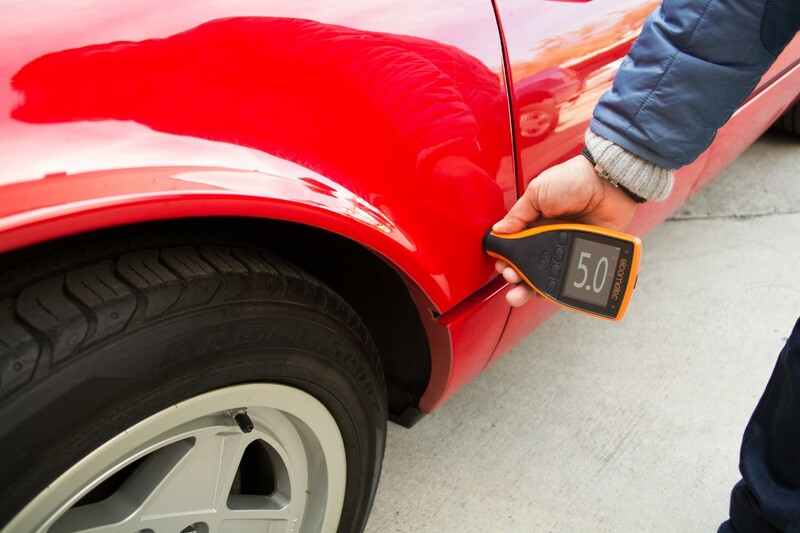 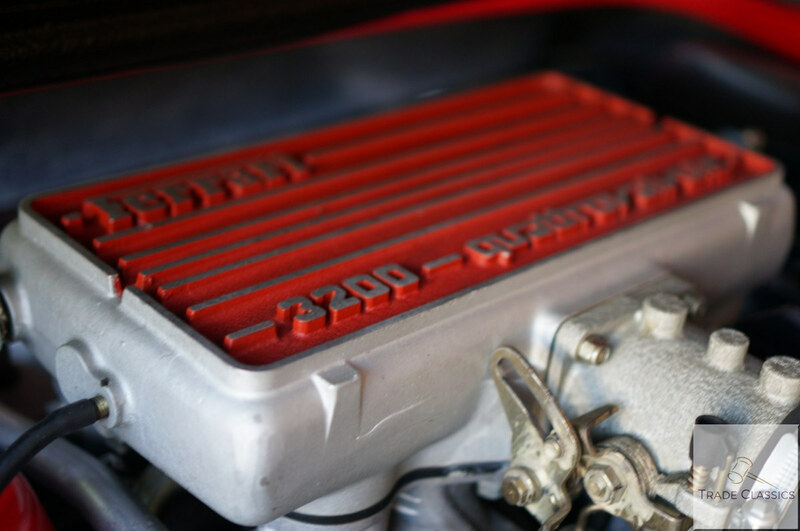 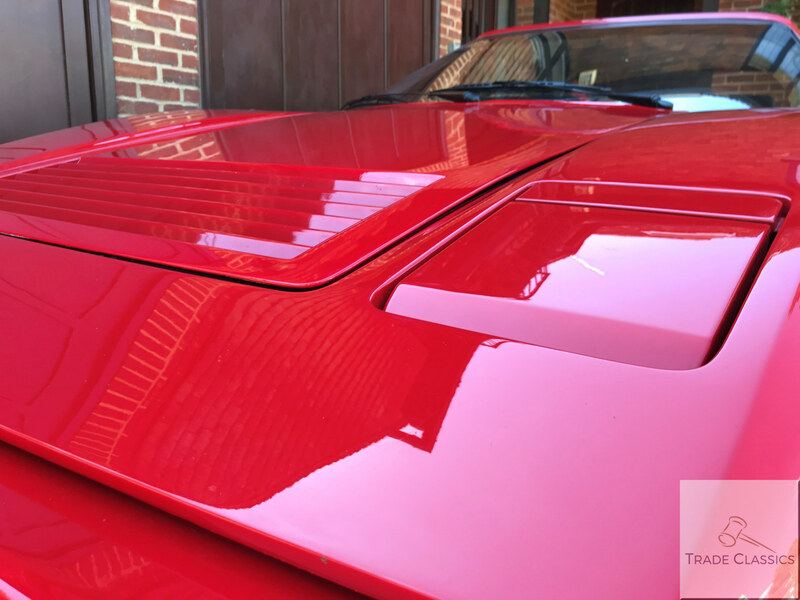 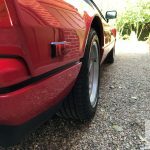 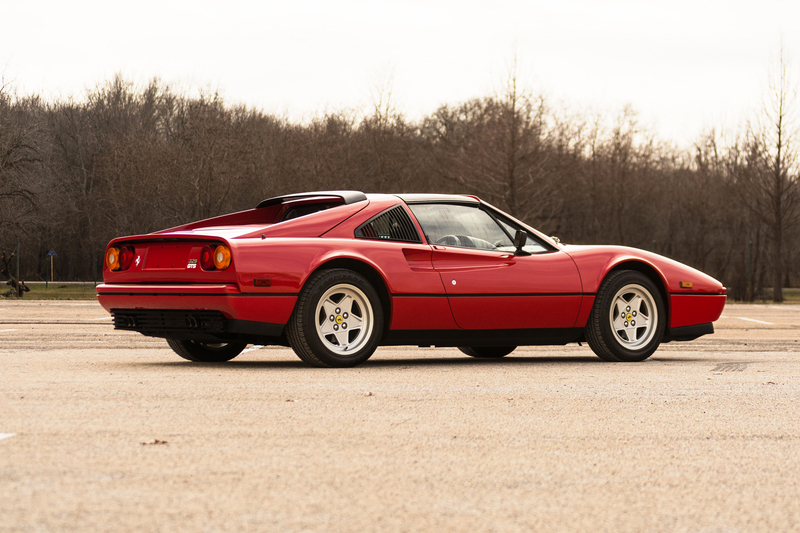 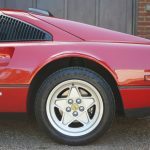 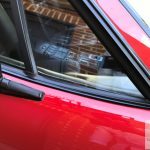 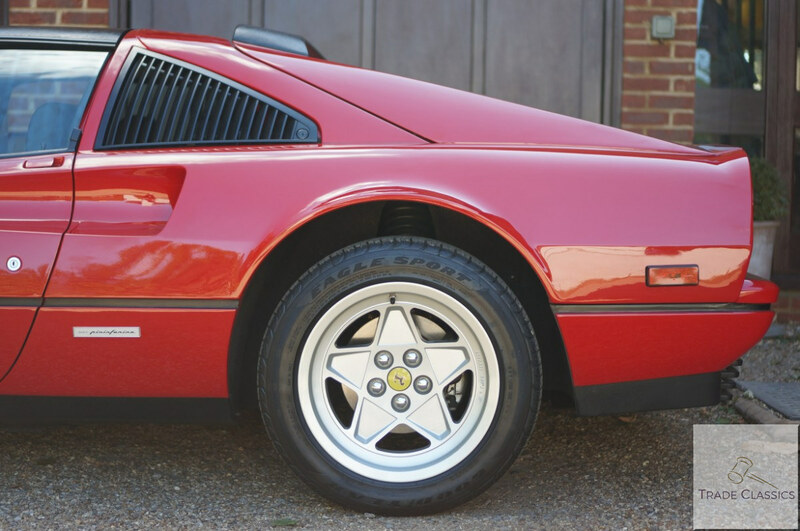 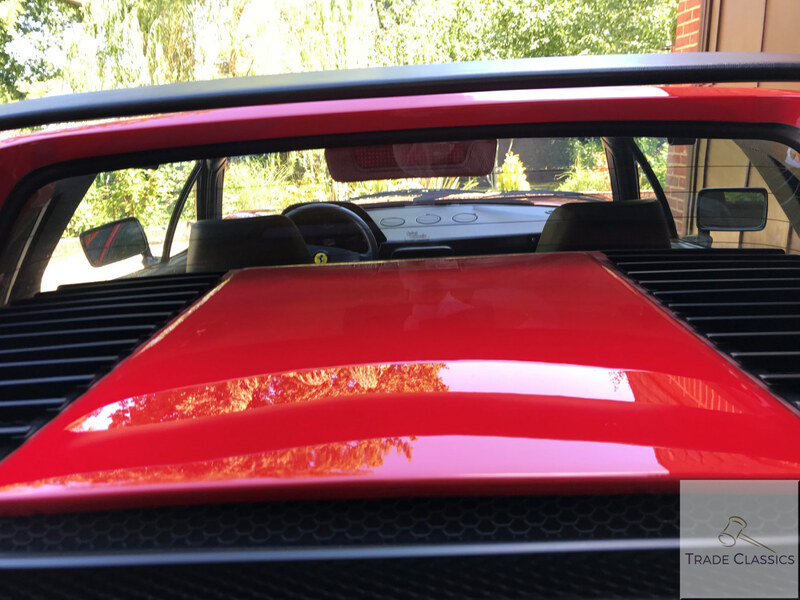 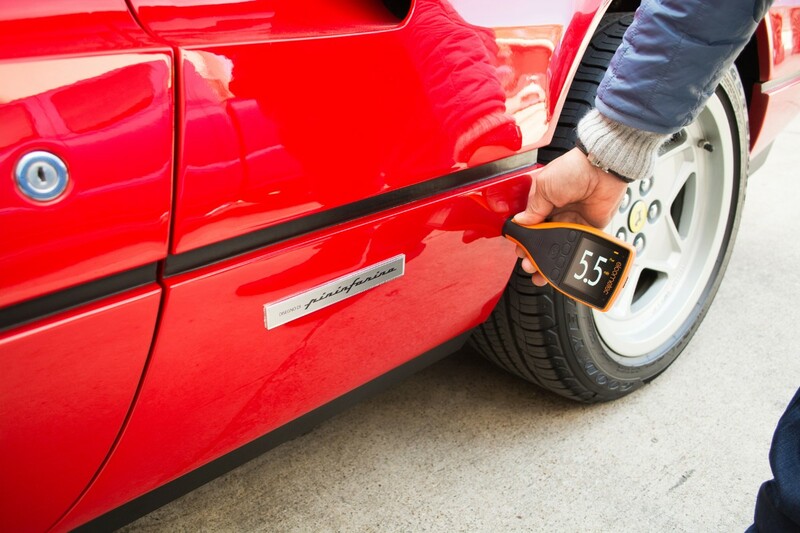 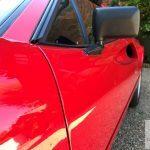 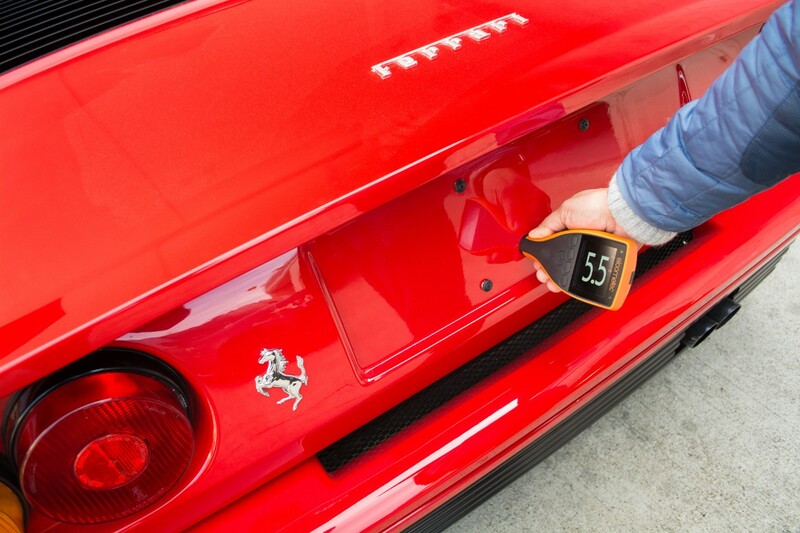 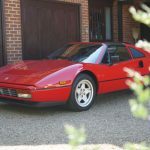 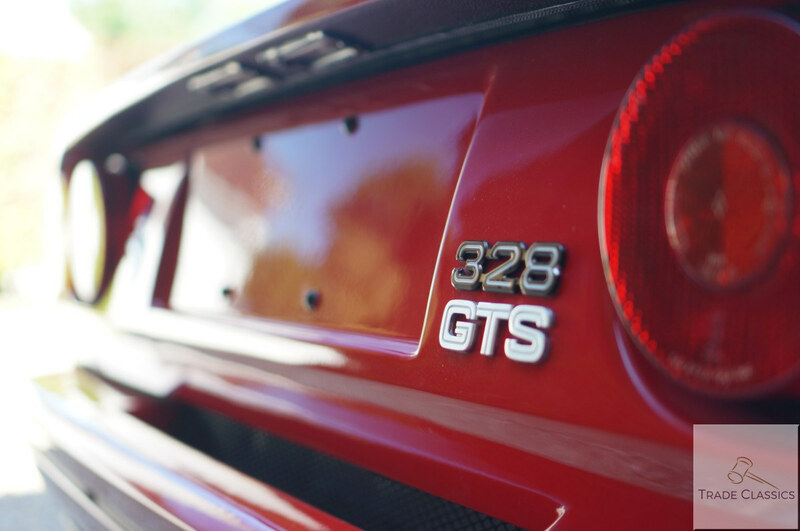 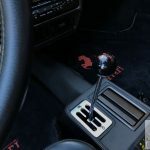 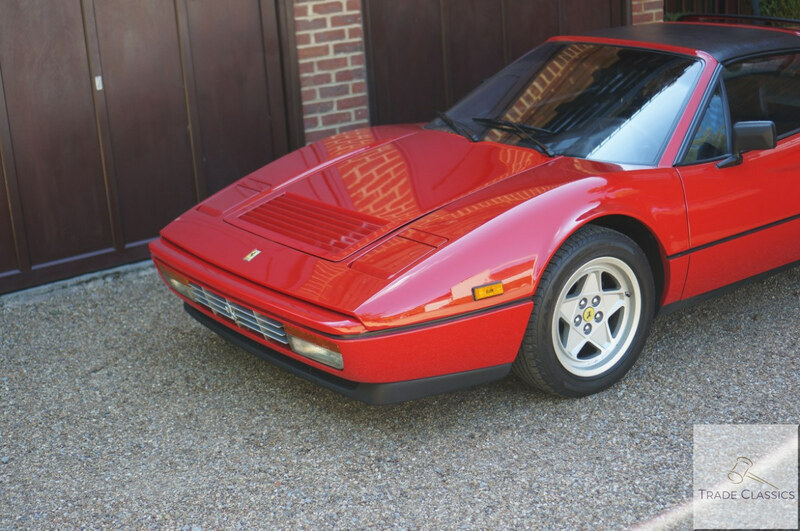 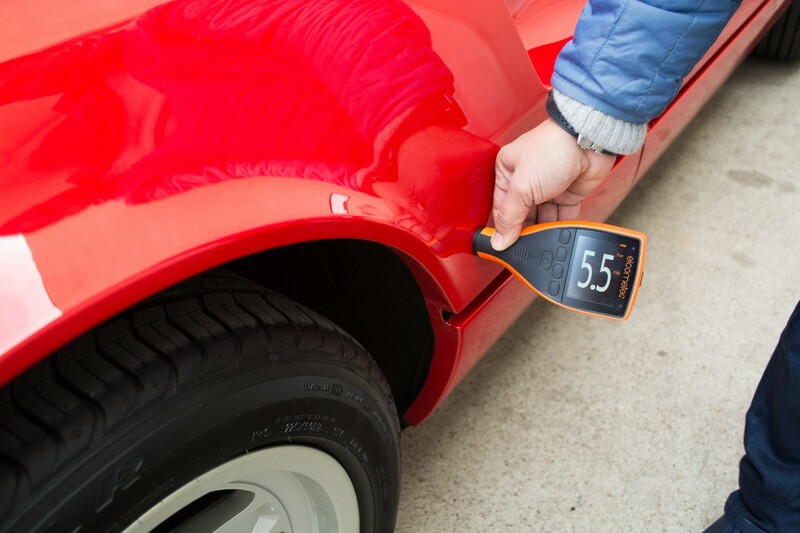 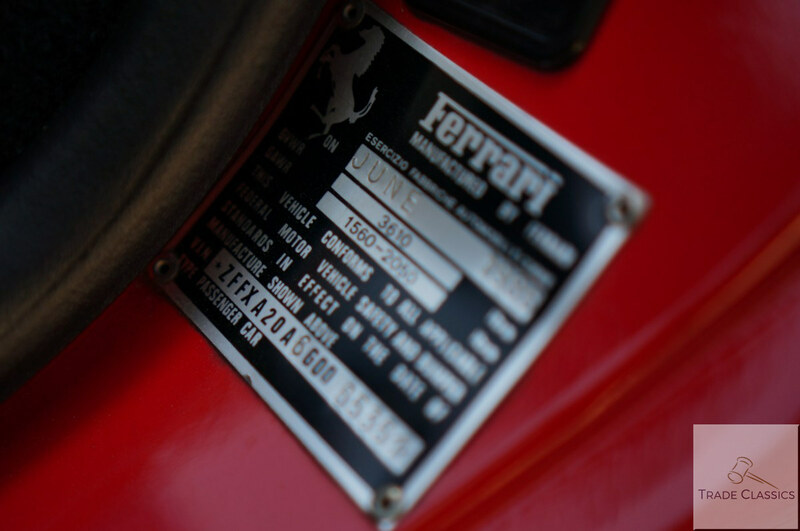 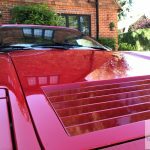 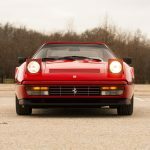 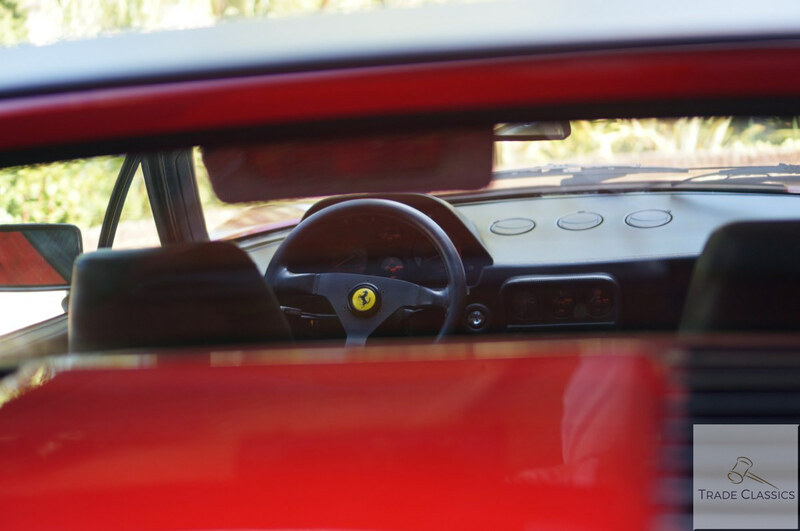 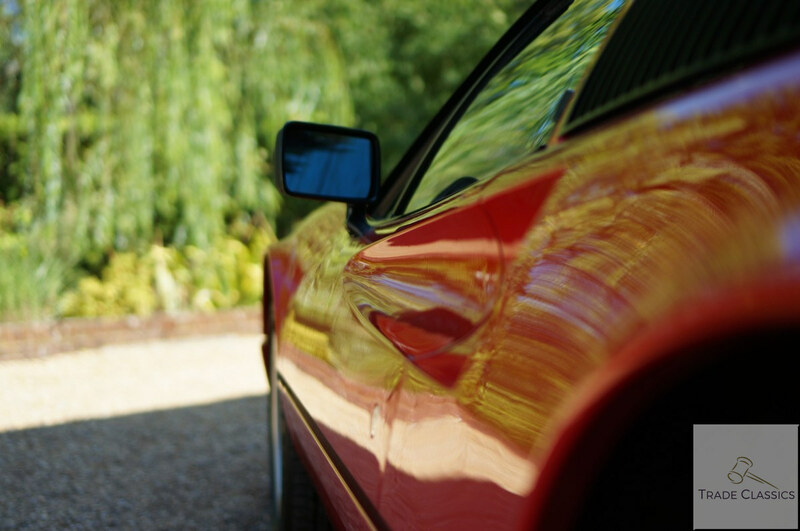 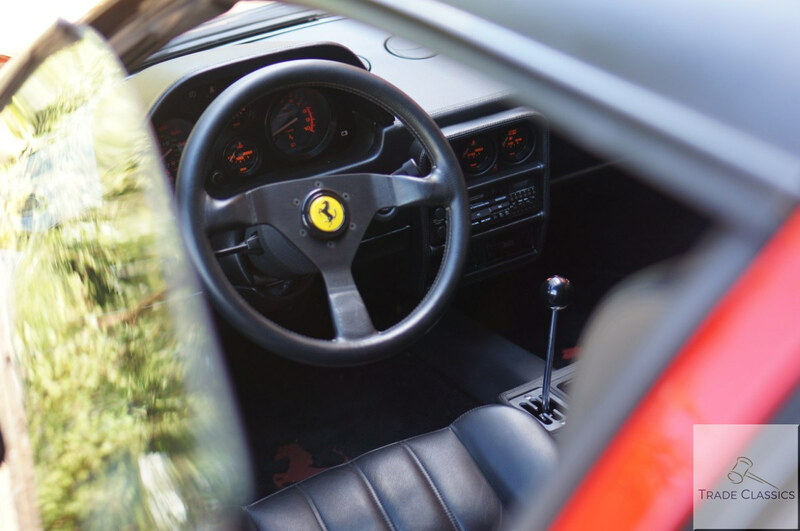 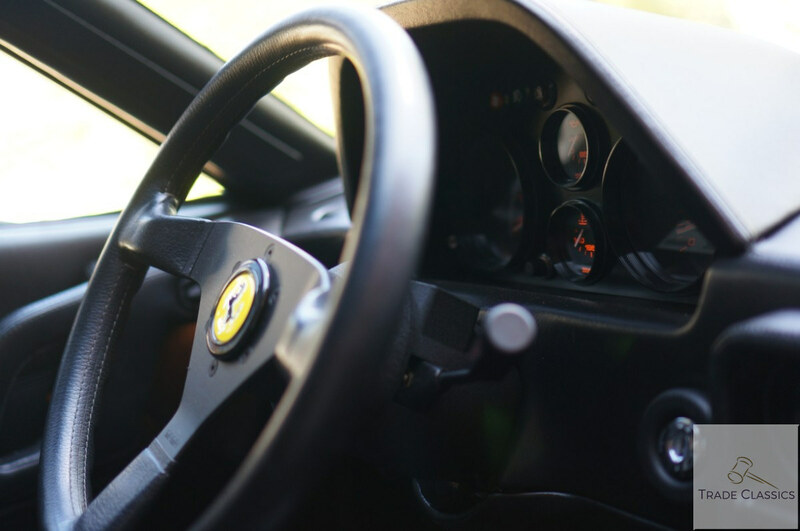 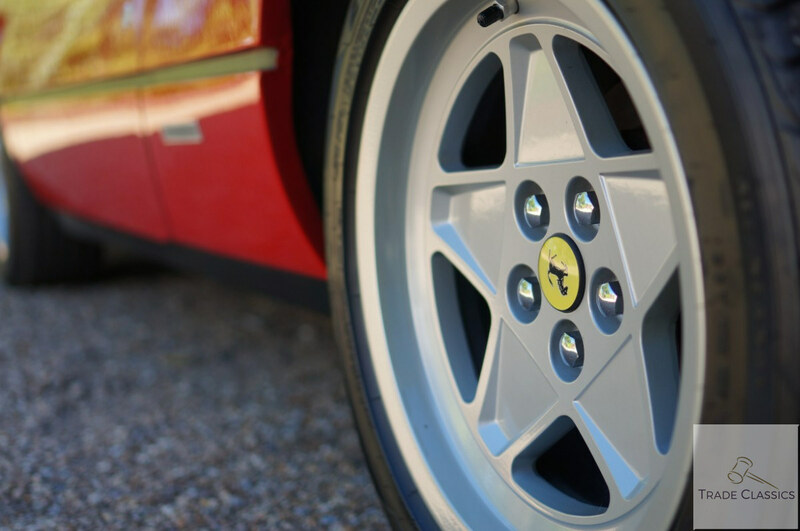 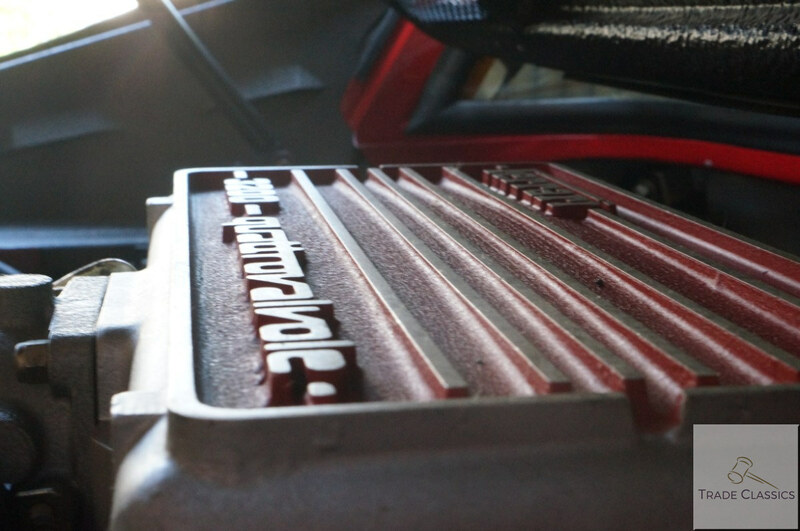 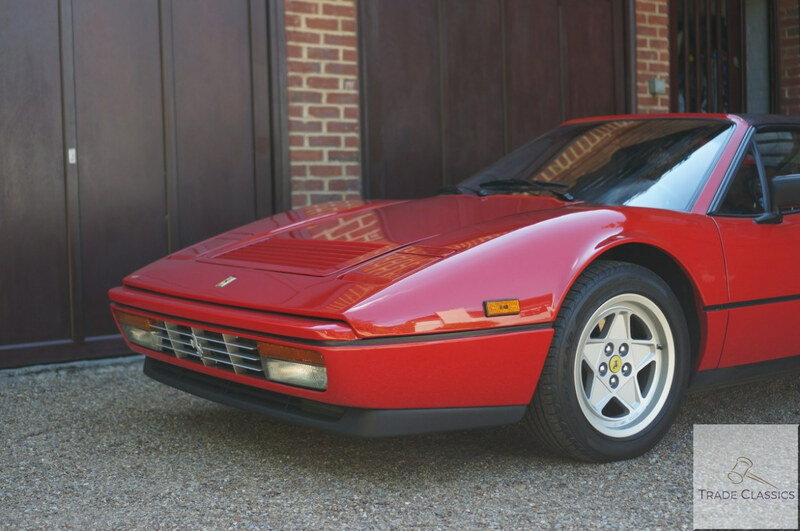 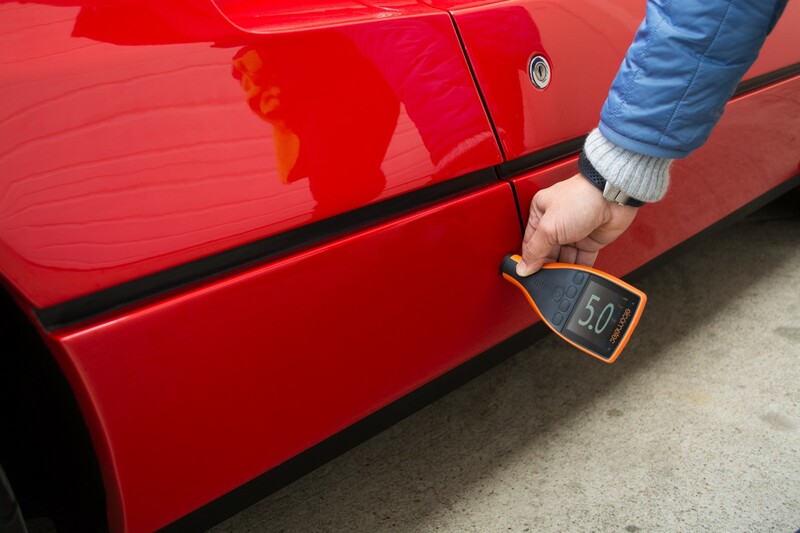 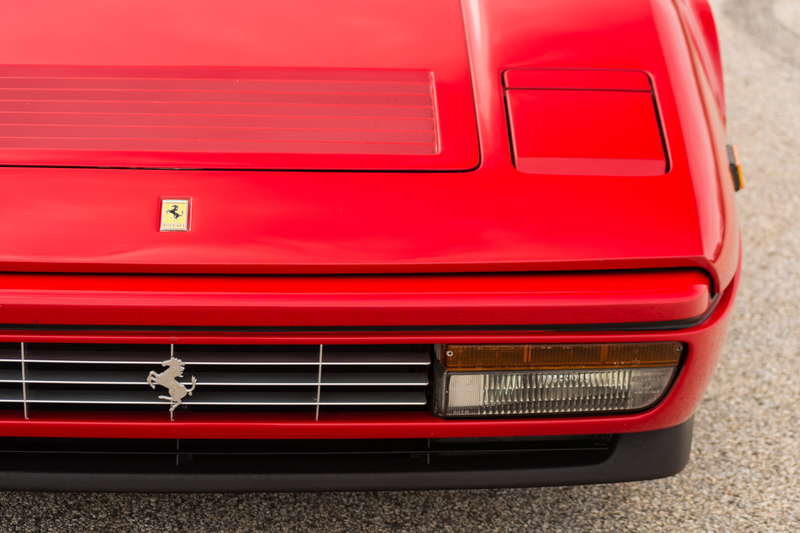 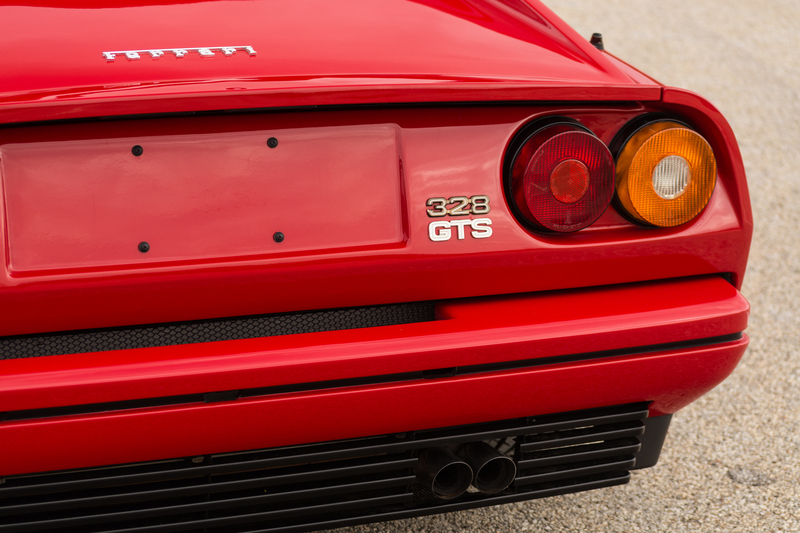 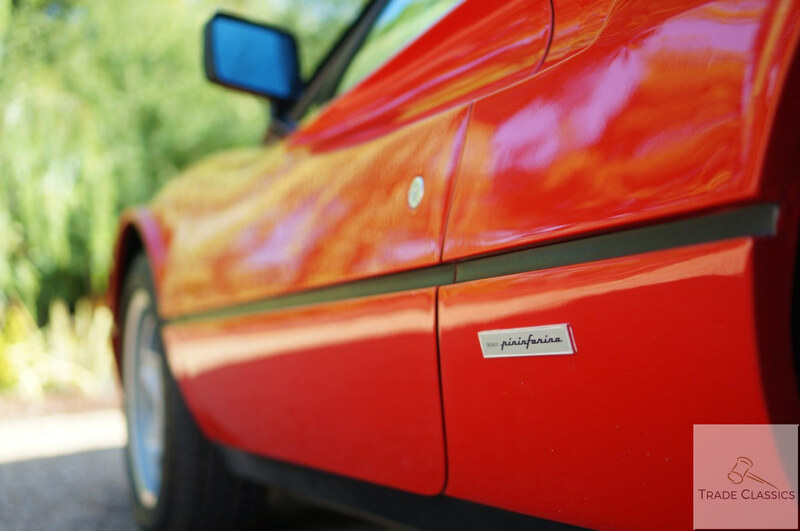 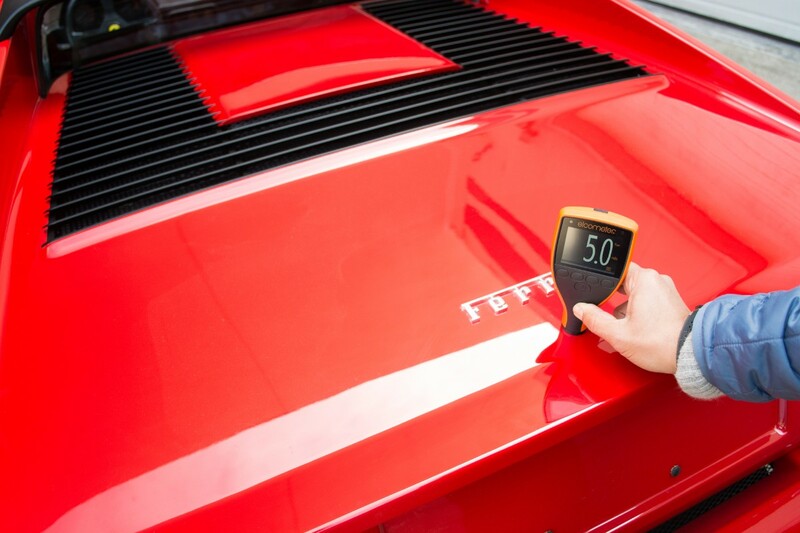 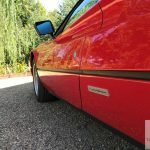 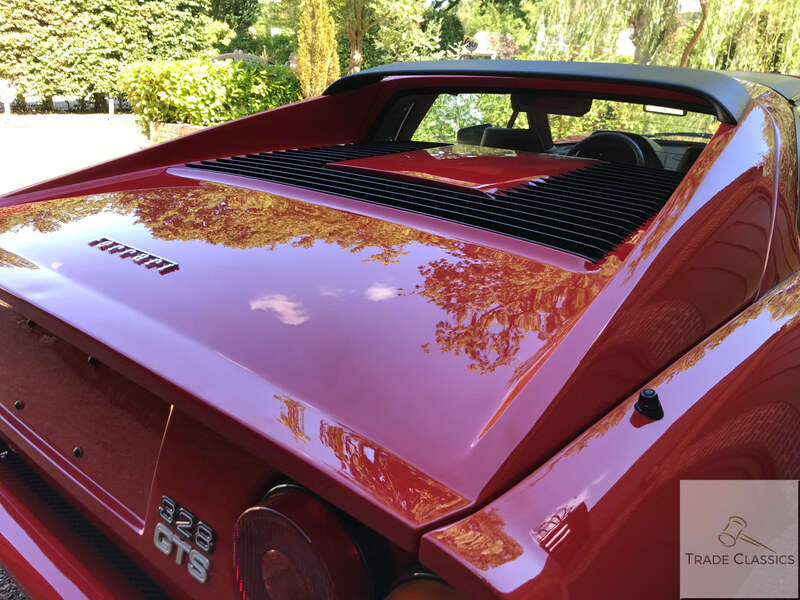 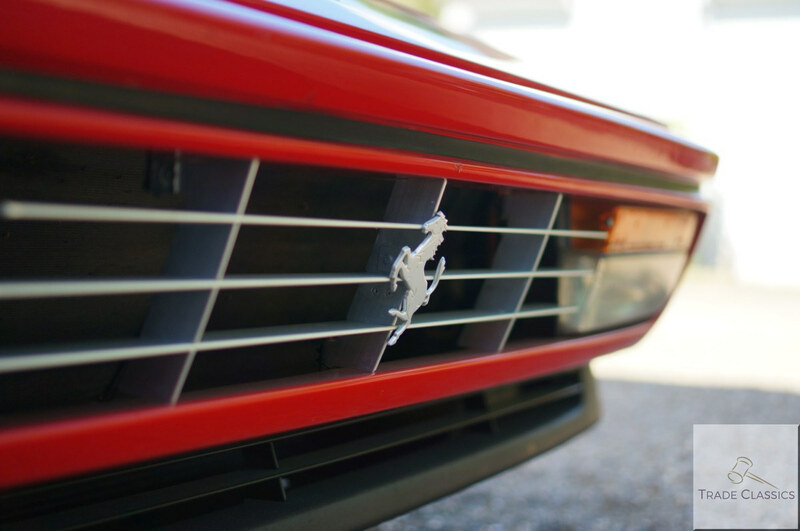 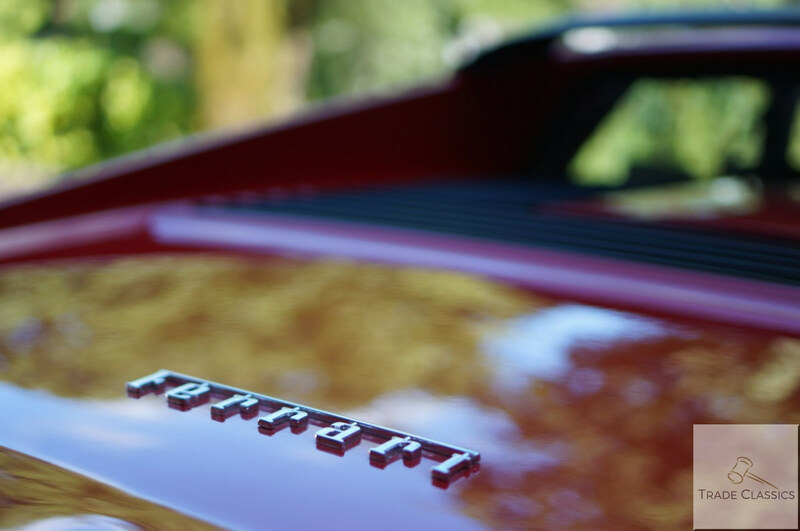 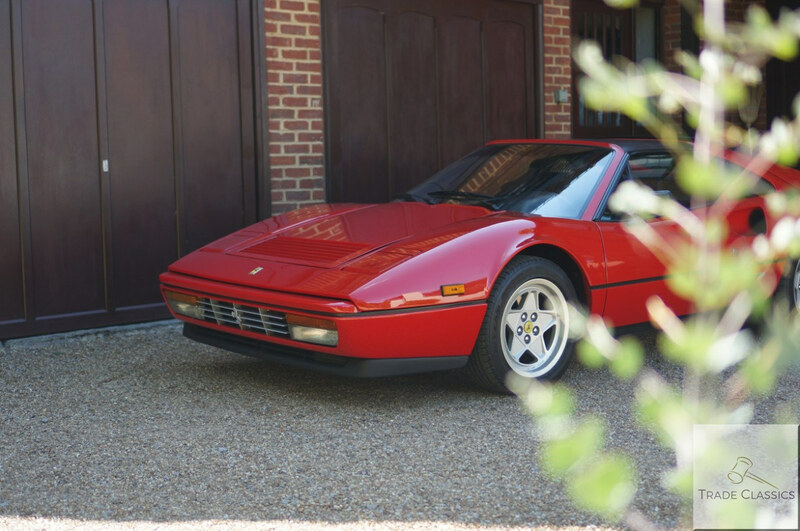 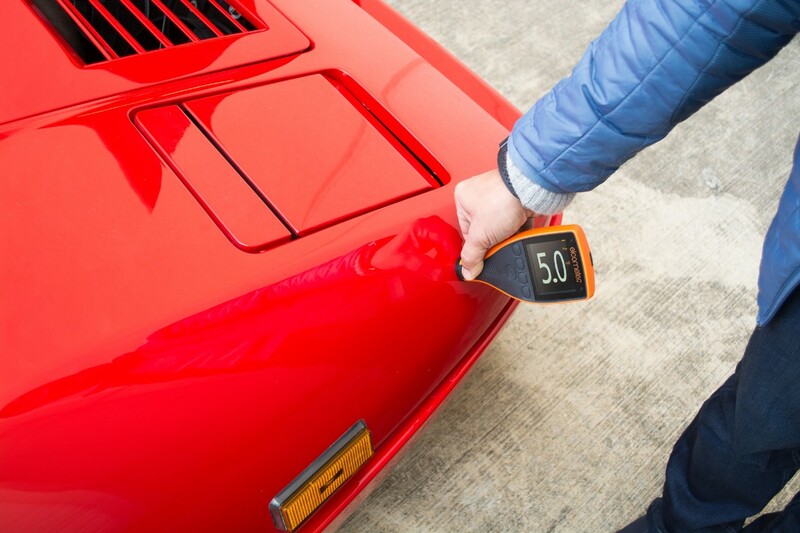 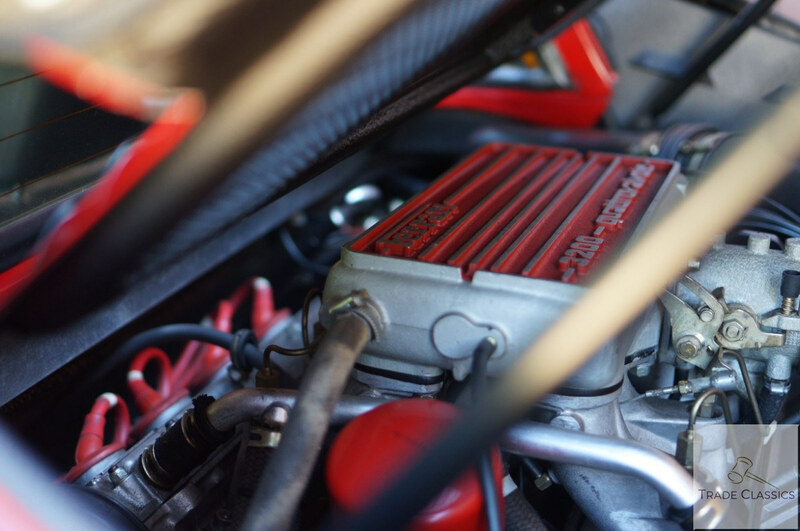 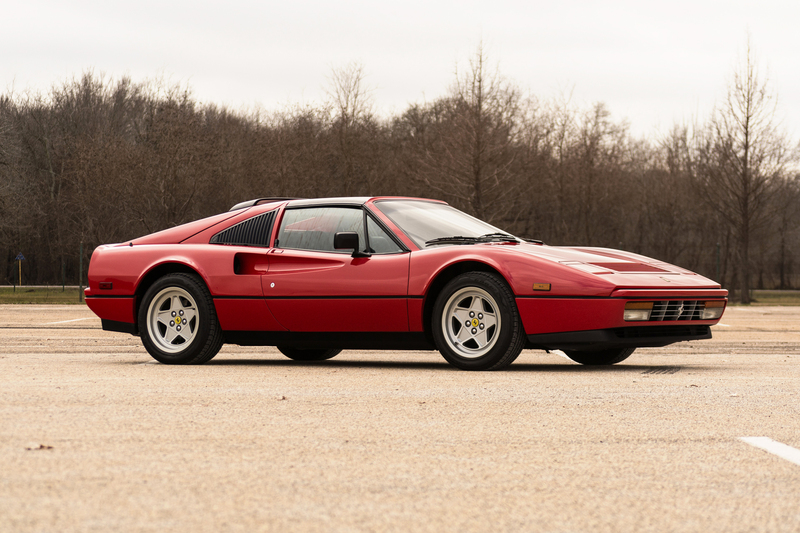 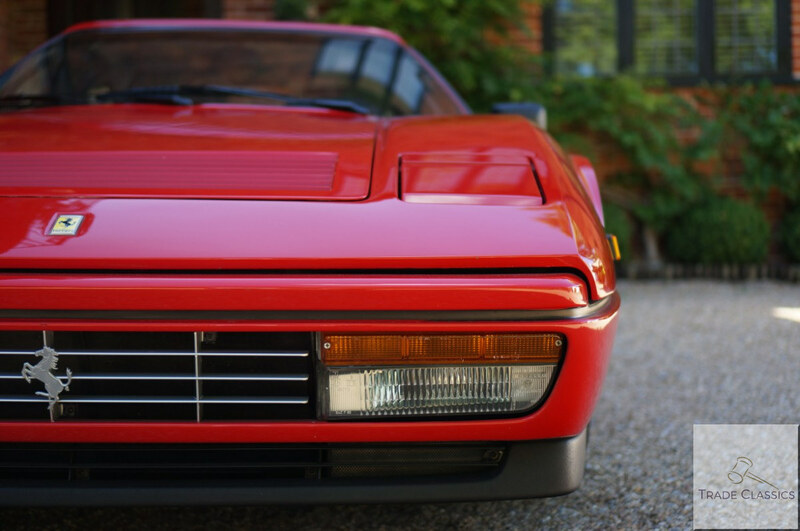 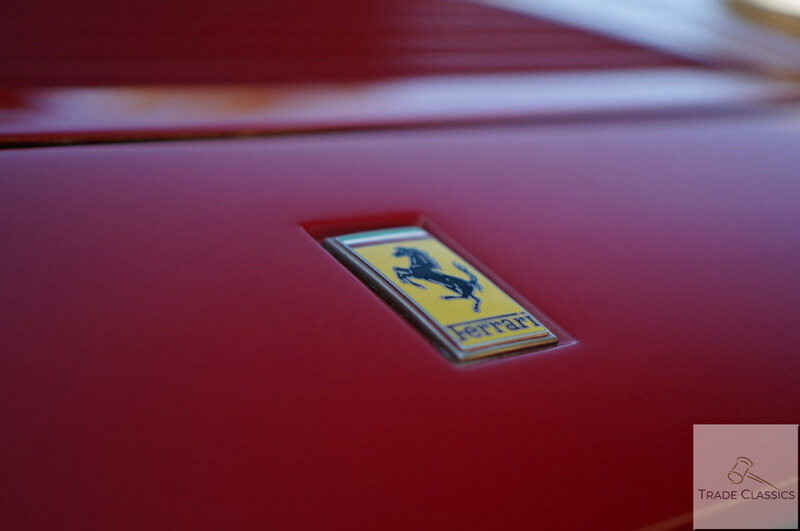 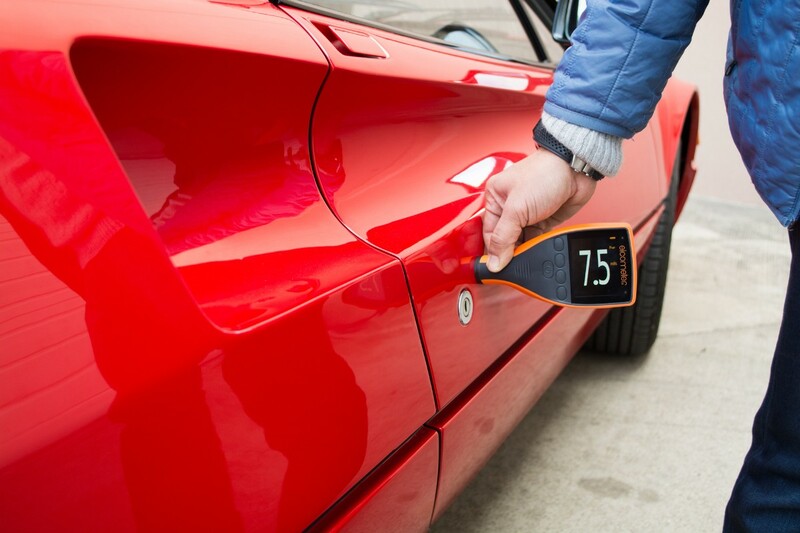 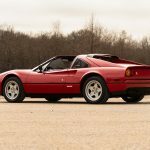 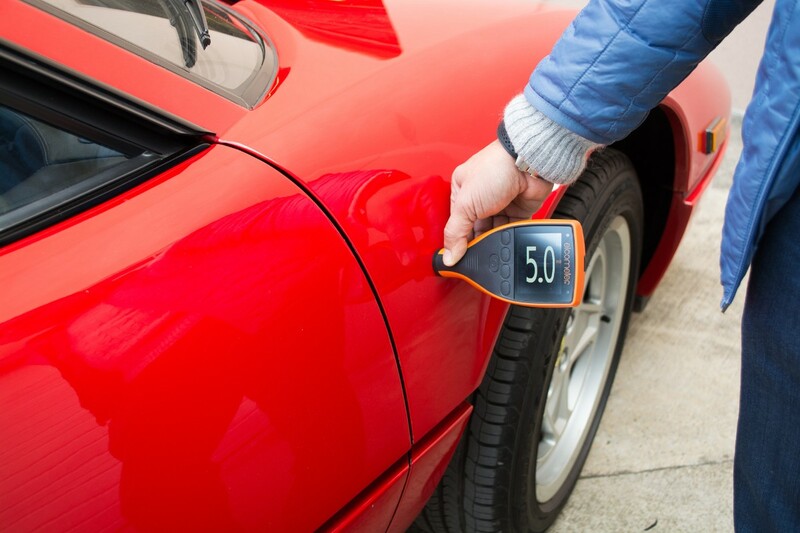 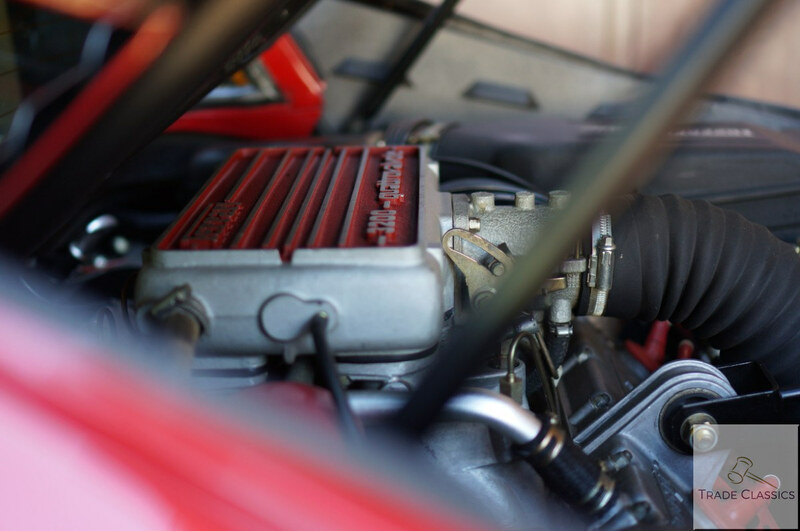 Ferrari enthusiasts often regard the 328 as the most reliable Ferrari to own and maintain. 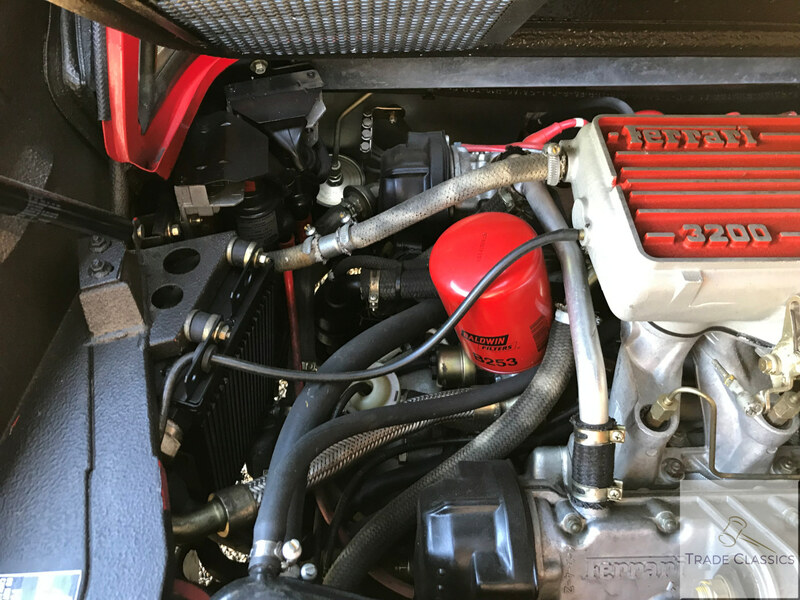 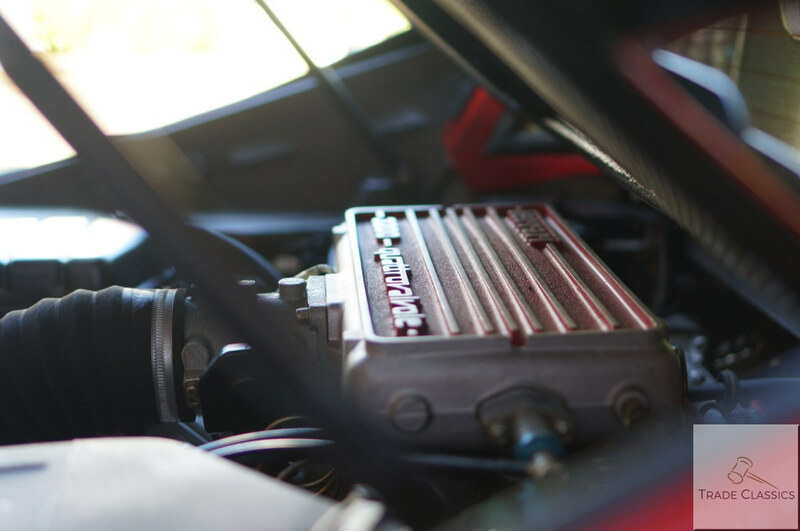 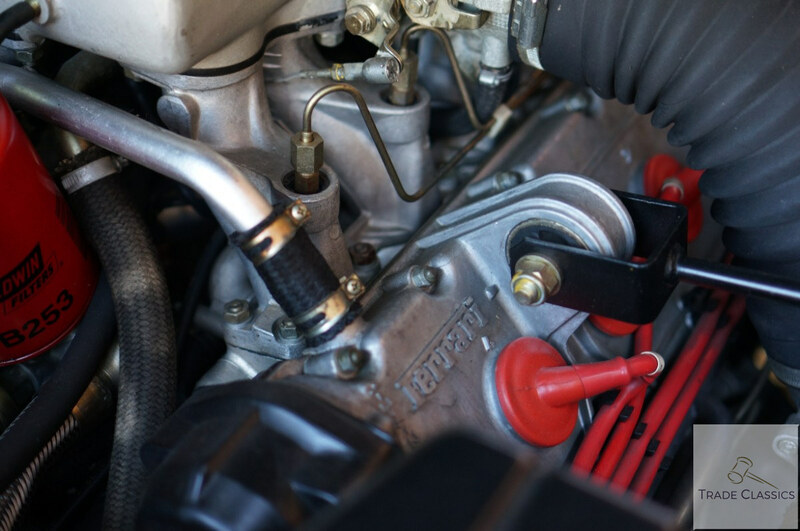 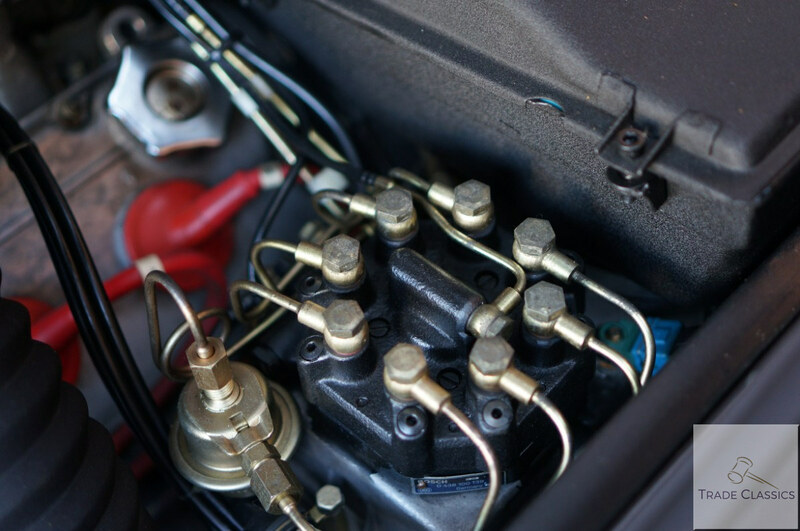 The transverse V8 set-up of the 3.2L engine allow for relatively easier maintenance compared to some of its siblings and predecessors. 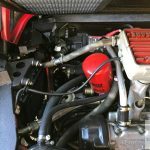 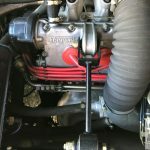 No need to drop the engine out when changing belts etc. 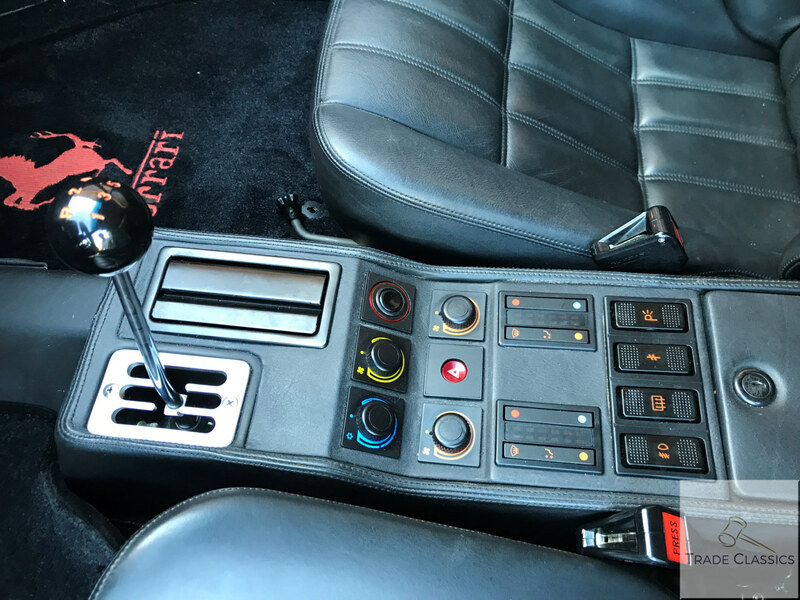 Cars like this, with such low mileage and in almost time-warp condition, do not come up for sale very often. 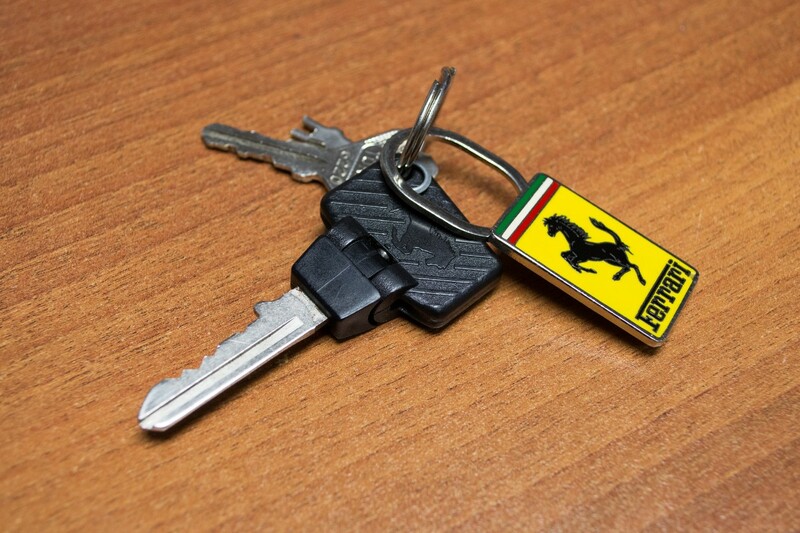 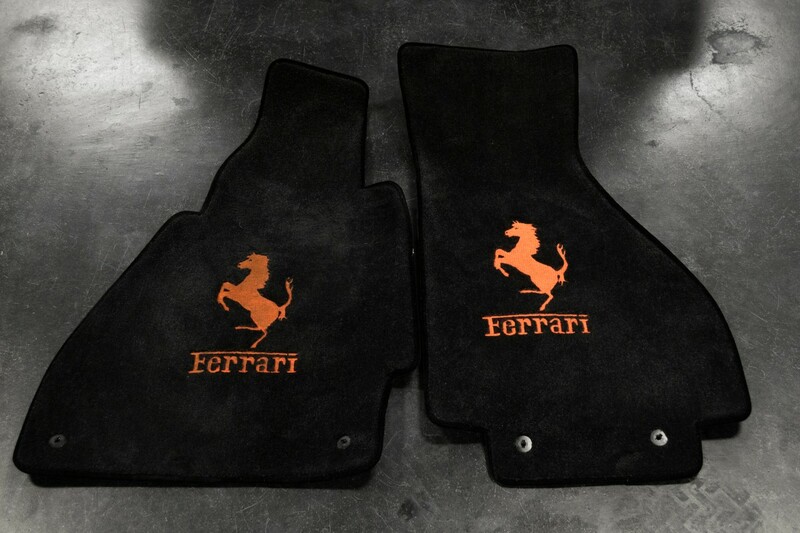 This car offers a serious collector or investor a very good opportunity to add to, or start their Ferrari collection. This car is available for a private sale, and will not be going to auction, so get in touch with us if you are interested and would like to arrange a private viewing. 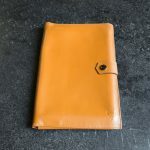 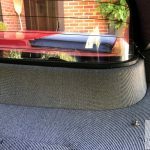 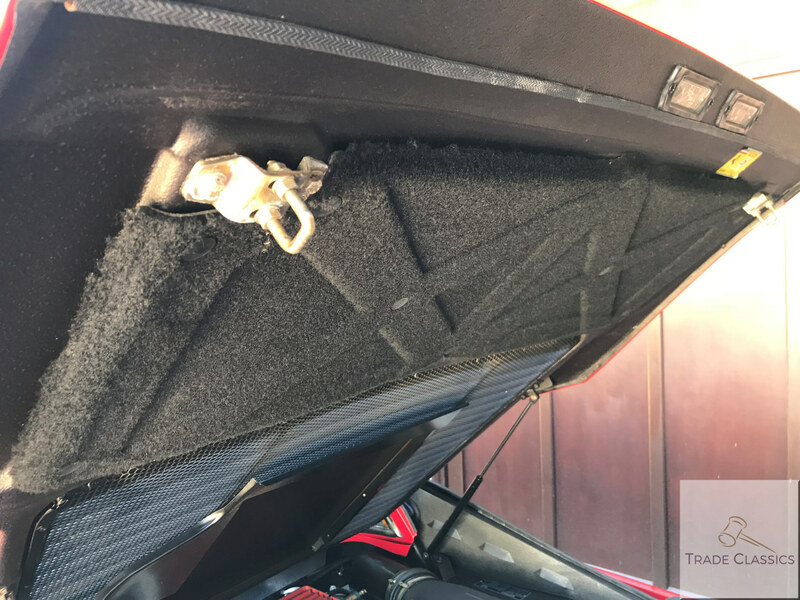 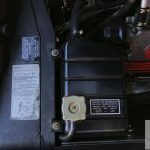 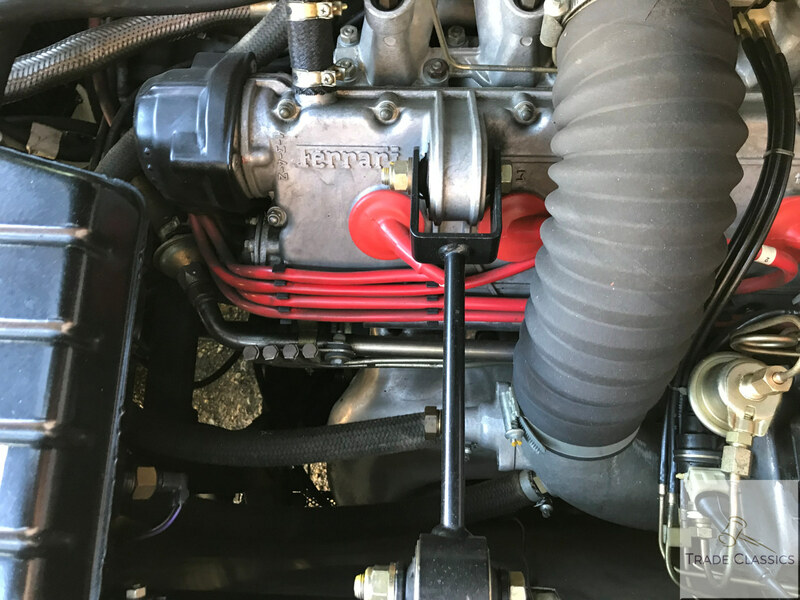 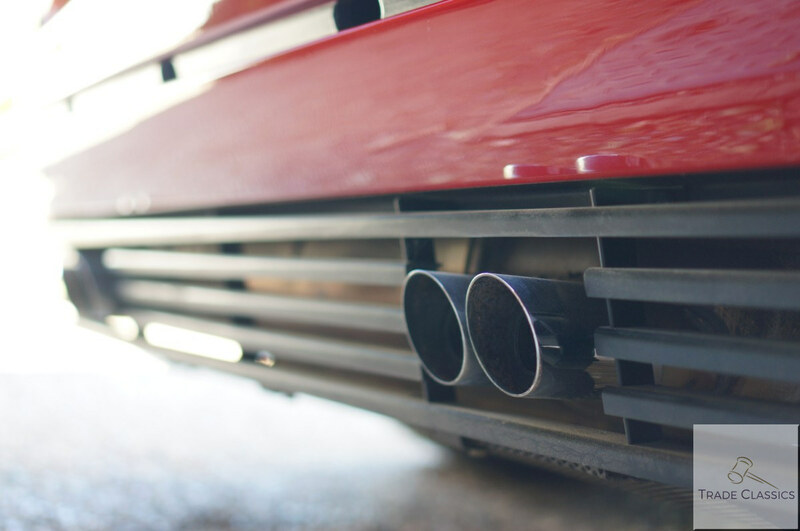 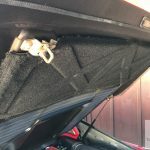 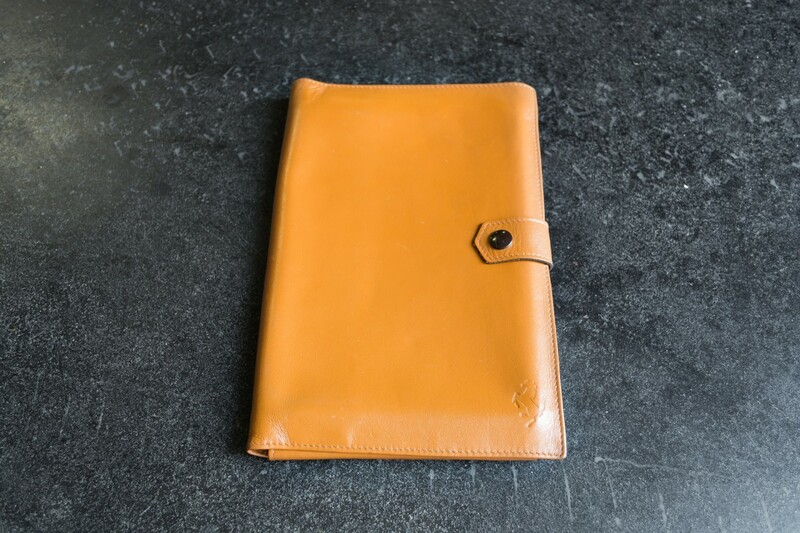 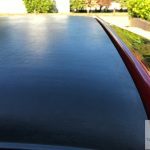 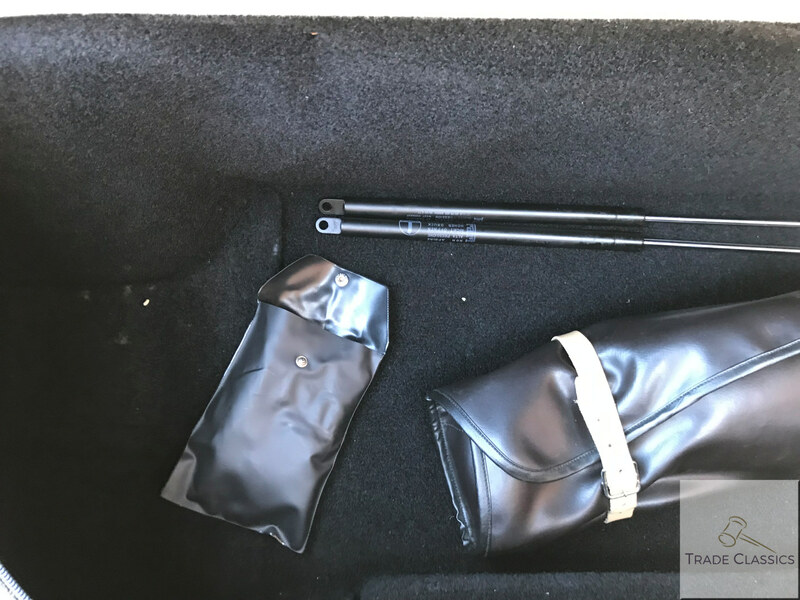 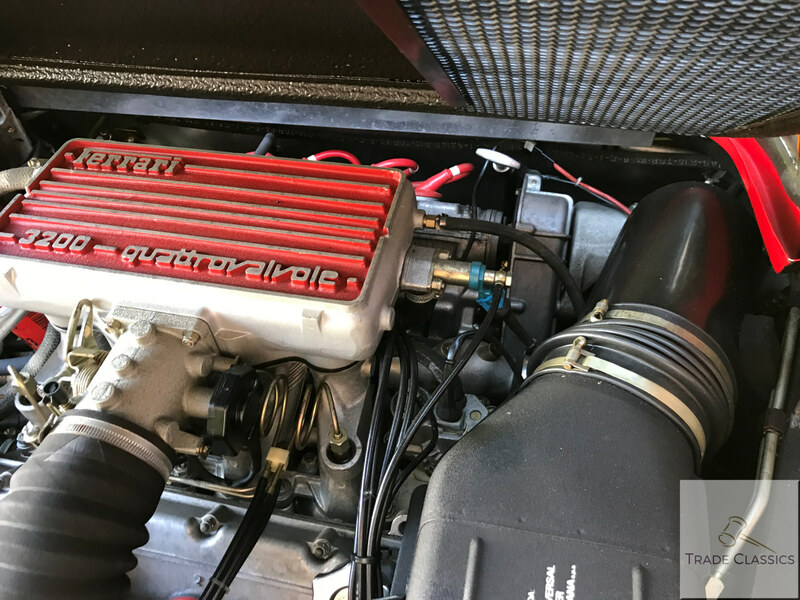 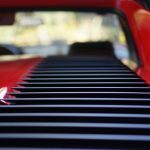 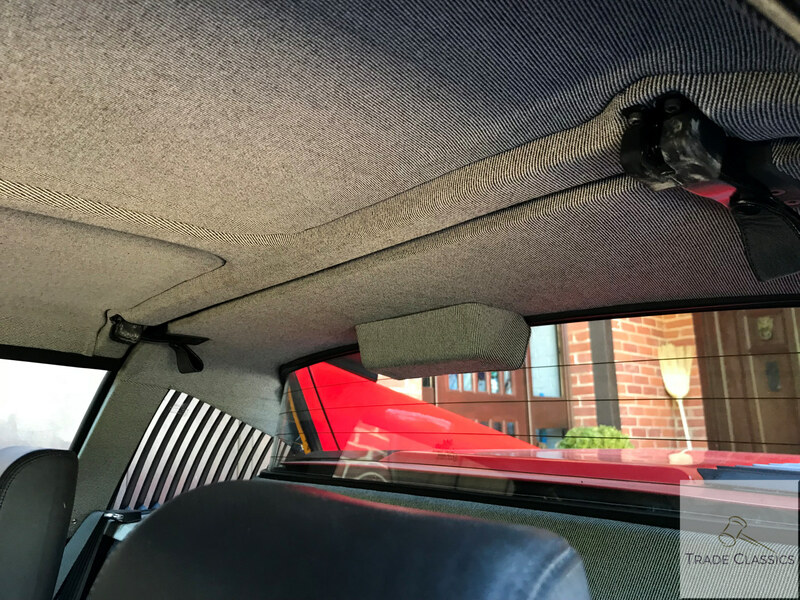 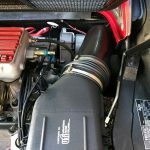 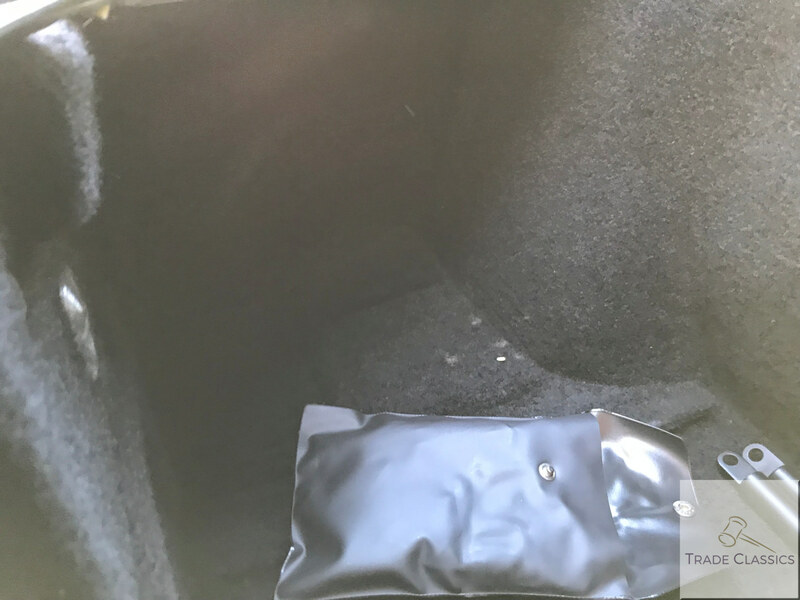 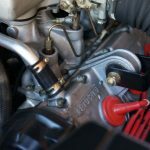 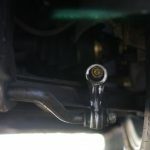 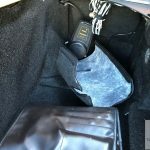 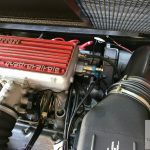 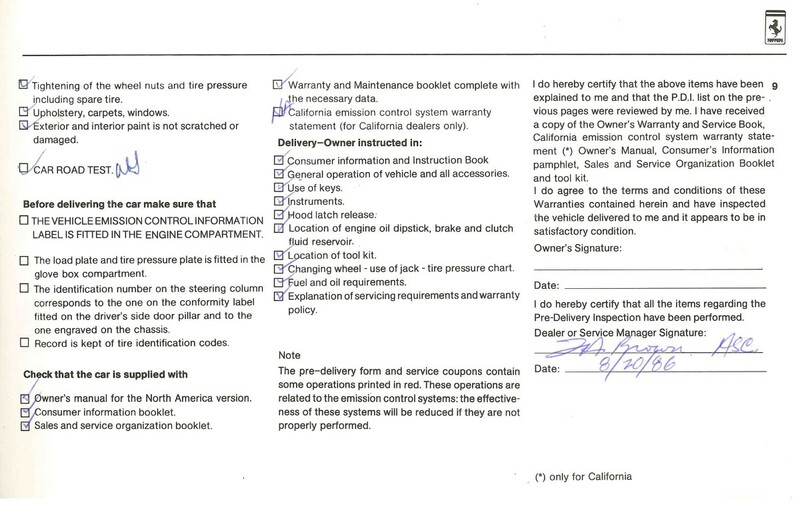 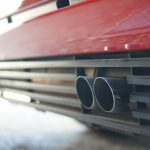 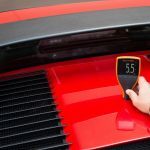 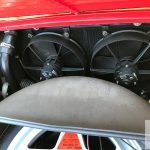 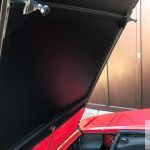 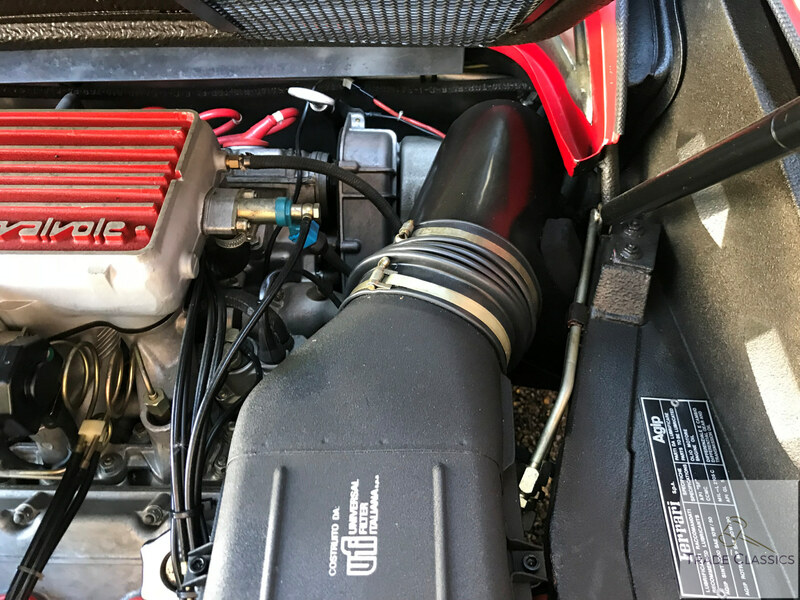 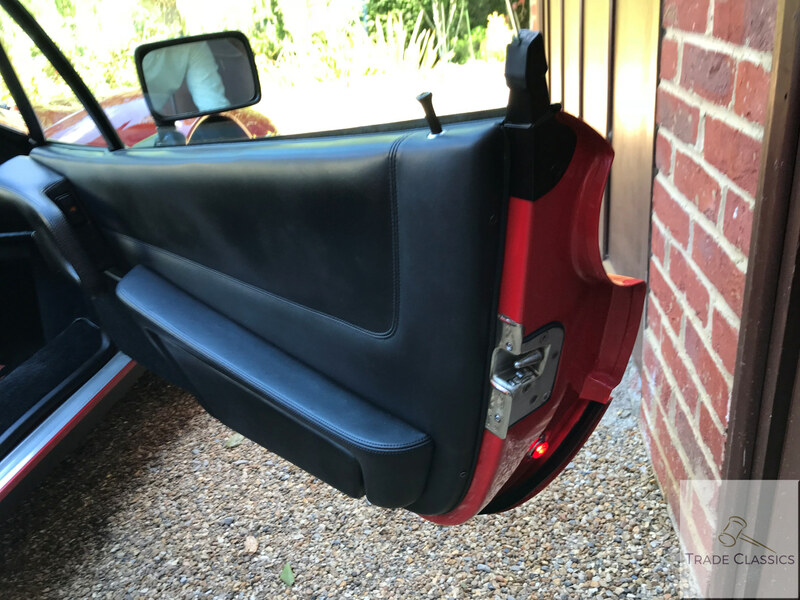 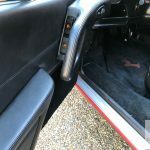 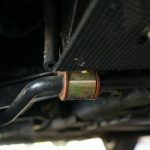 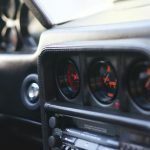 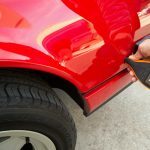 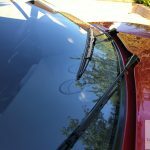 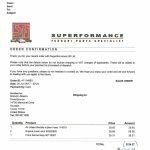 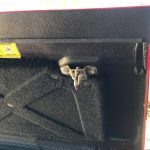 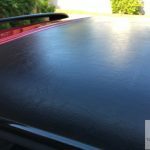 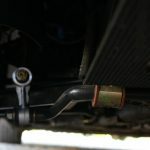 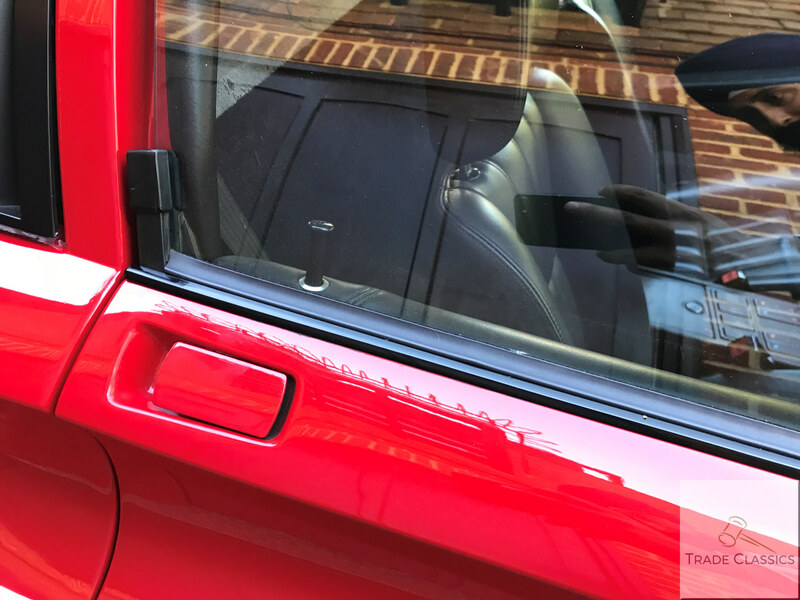 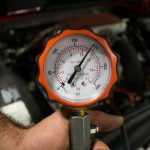 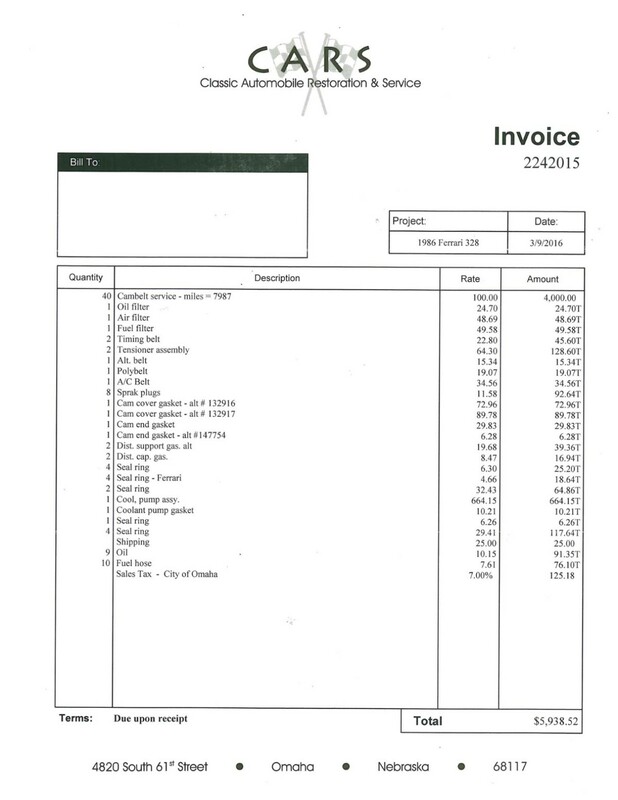 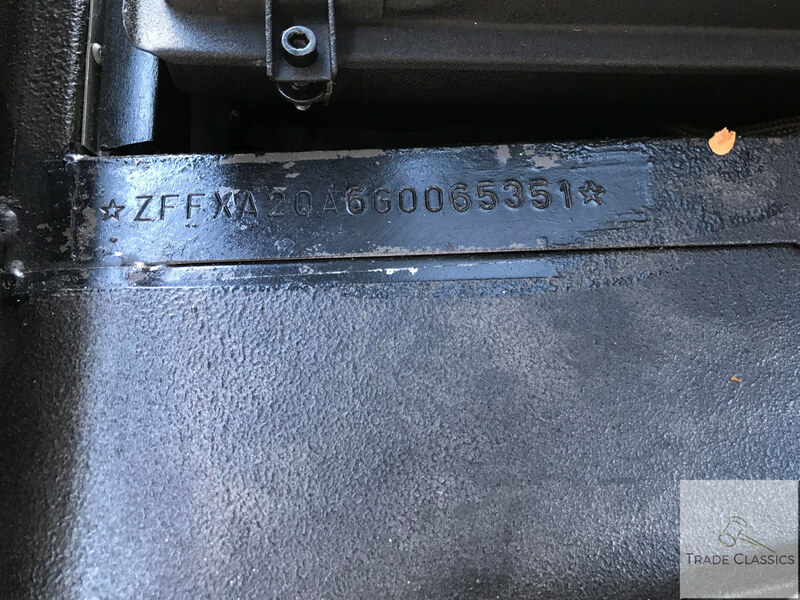 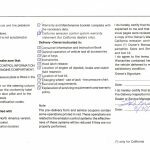 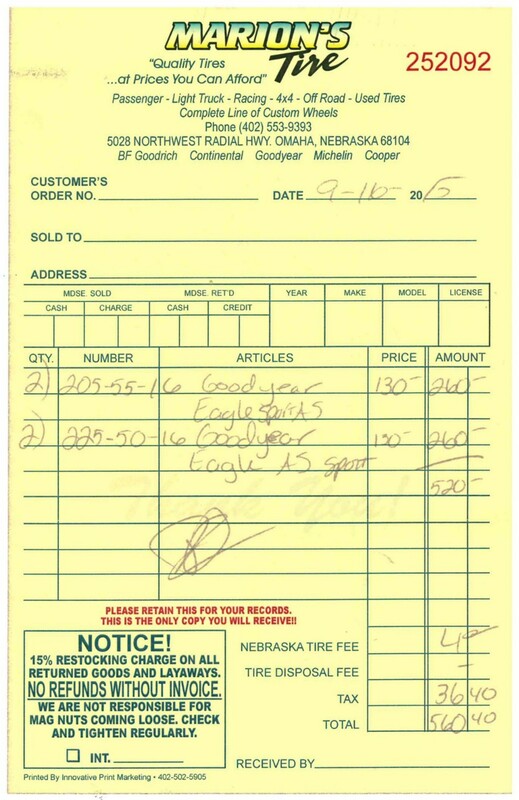 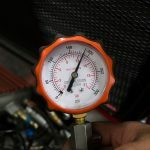 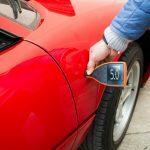 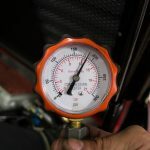 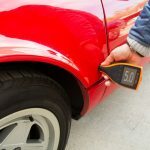 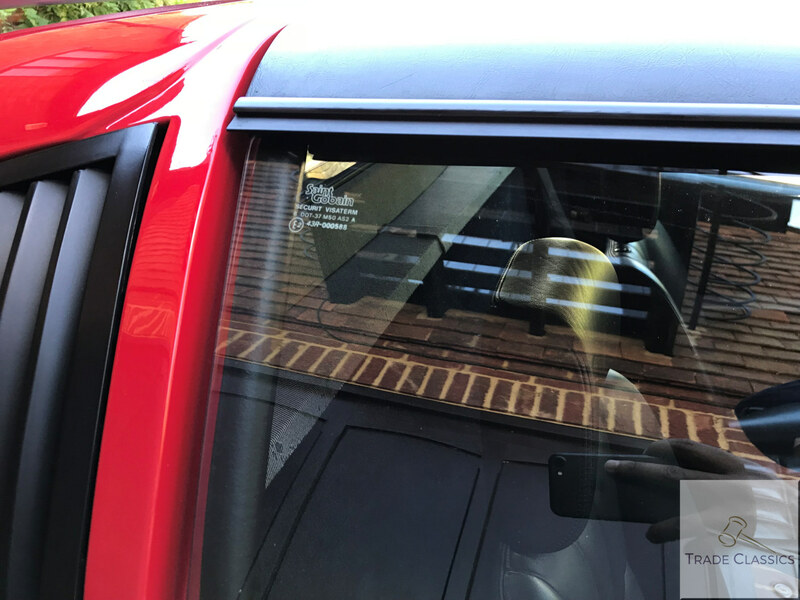 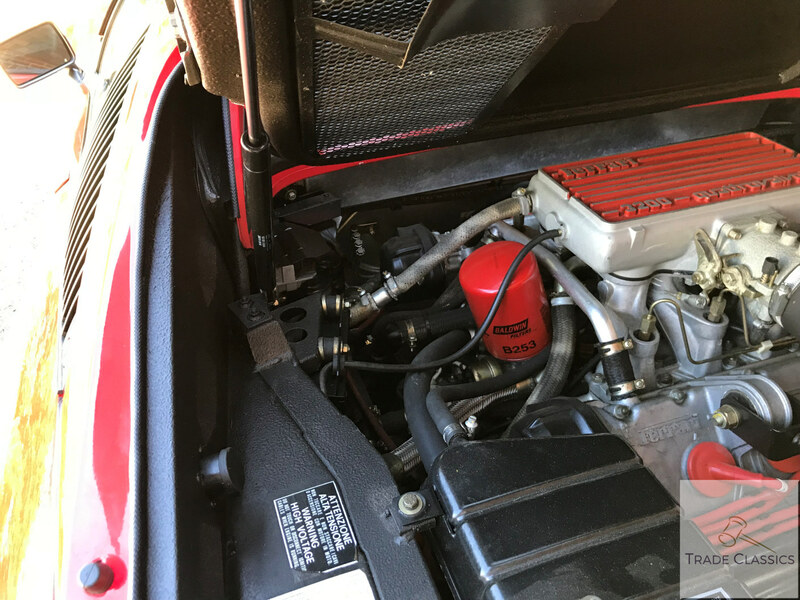 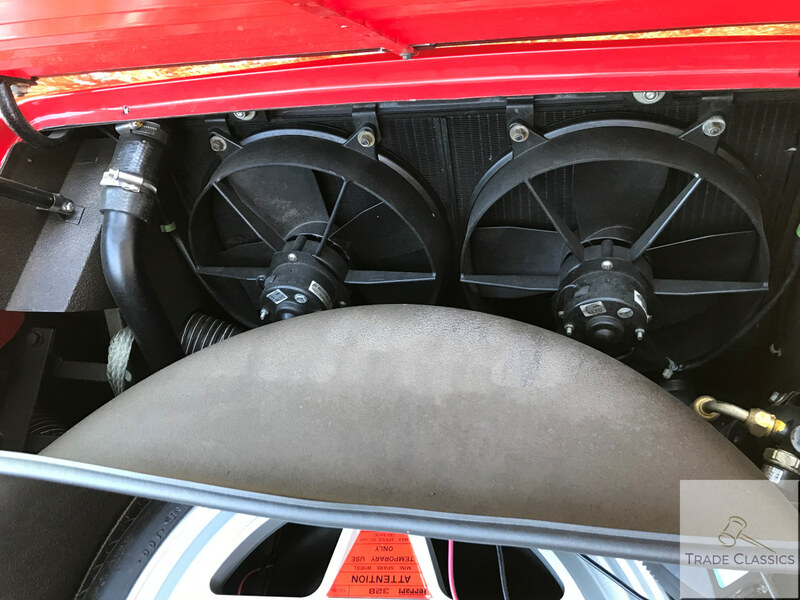 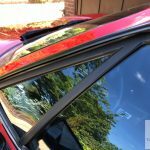 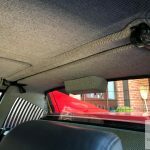 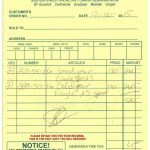 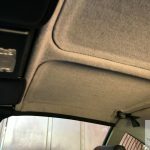 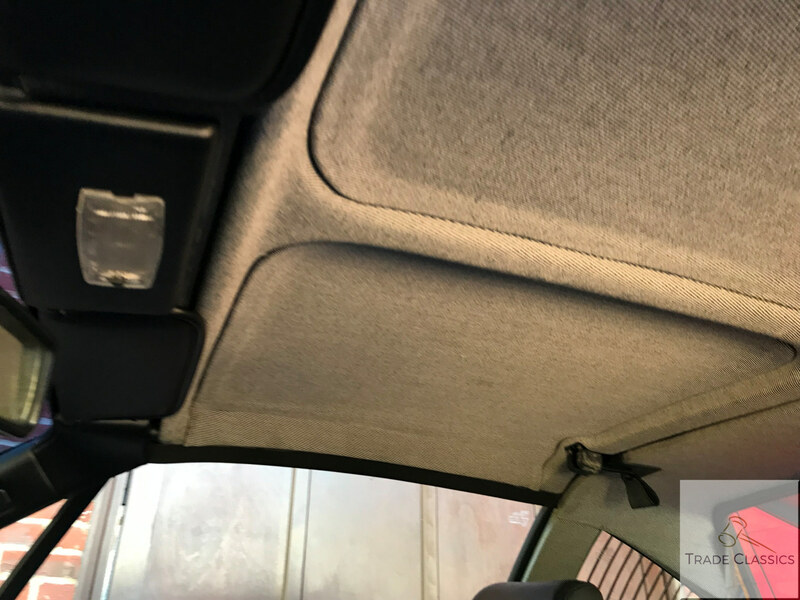 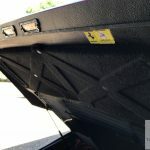 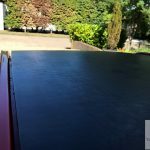 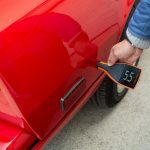 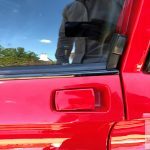 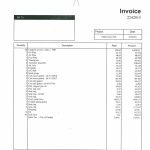 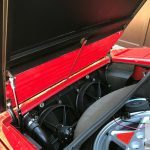 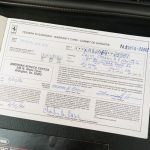 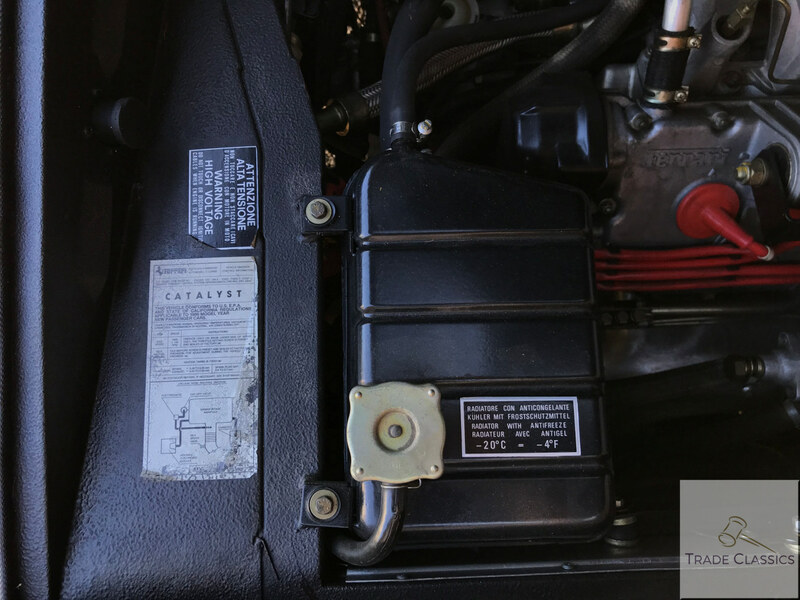 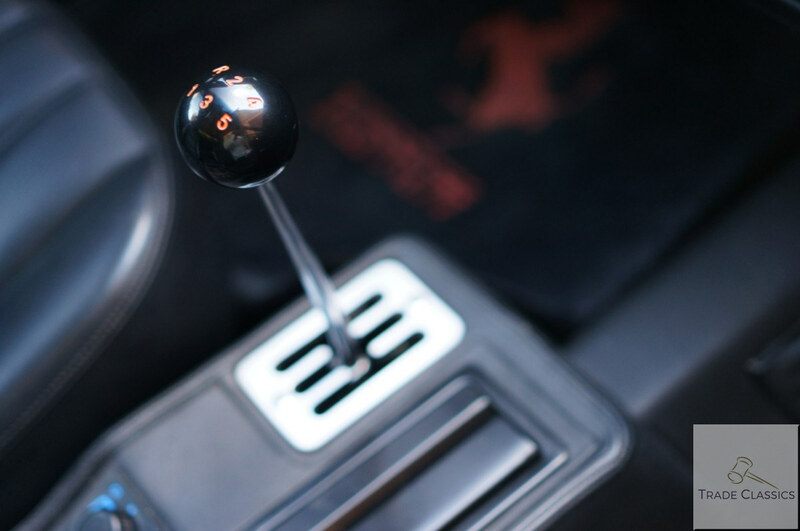 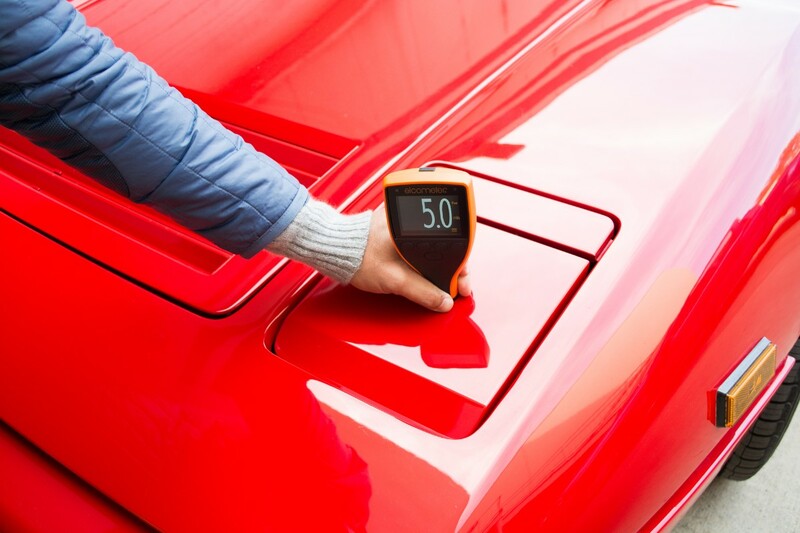 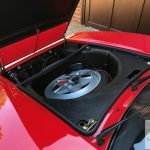 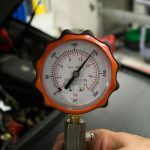 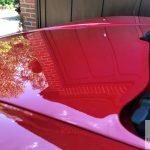 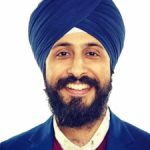 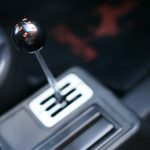 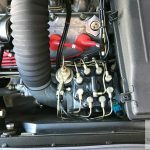 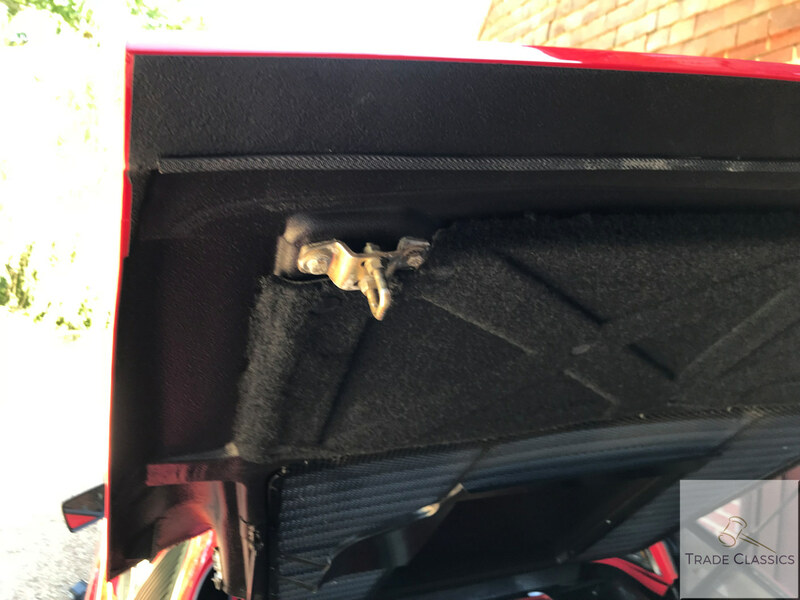 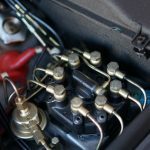 This listing was written by Kulraj Singh Salh from information gained from Gary (owner and seller of the vehicle), and having visited the vehicle.